Slot are first come first served. Confirmed participatants will be emailed. 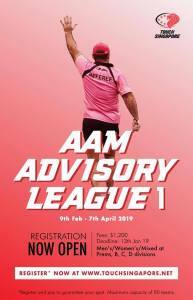 It’s time to get your team registrations in for the AAM-Advisory 2019 League Season 1. Please note that due to field space availability we have a maximum capacity of 80 teams which will be confirmed on a first registered & paid basis. Registeration Form is on the widget on the right. Please take some time to read the Rules and Regulations PDF for the league on the League Tab. 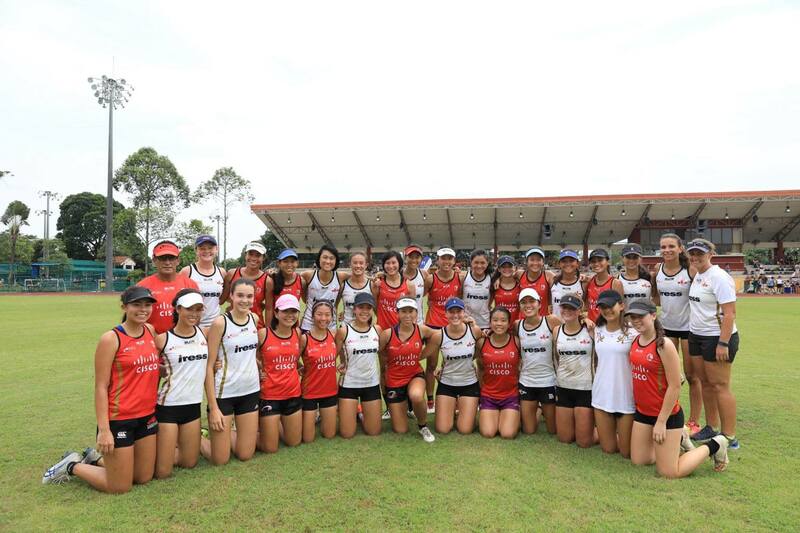 Touch Singapore is delighted to announce the Women's Open squad for the upcoming 2019 Touch World Cup to be hosted in Malaysia. 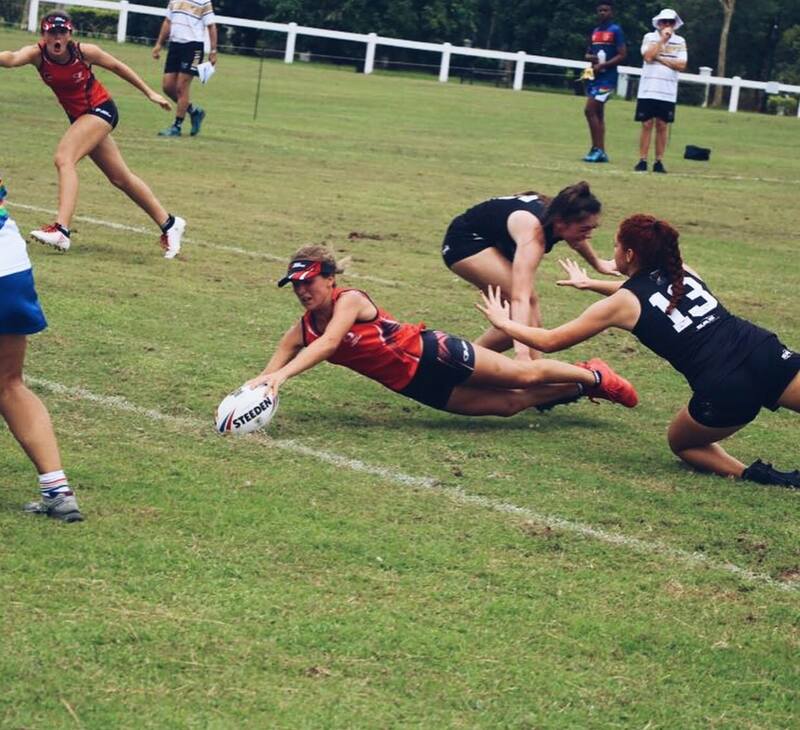 The selection process has been exceptionally challenging due to the high-quality performances of all the players in the AAM-Advisory Touch League and the impressive development we have observed by our youth players, who have benefited greatly from the experience of playing at the Youth World Cup in June, now stepping up to full International Women's Open status. TSG would like to wish all the players, coaches and management the best of luck and our full support in their preparations for the championships. 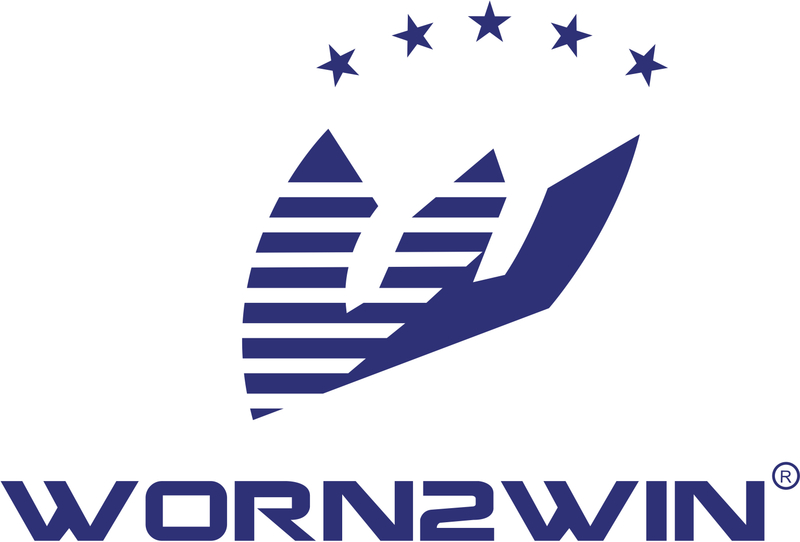 Touch Singapore are delighted to announce the appointment of Worn2Win as the Official Kit Partner for the supply of the Singapore National Touch kit in a 2 year agreement. The agreement will include the provision of all playing and off field apparel for the Singapore National Teams and officials throughout the contract period which includes both the Youth World Cup and the Touch World Cup. 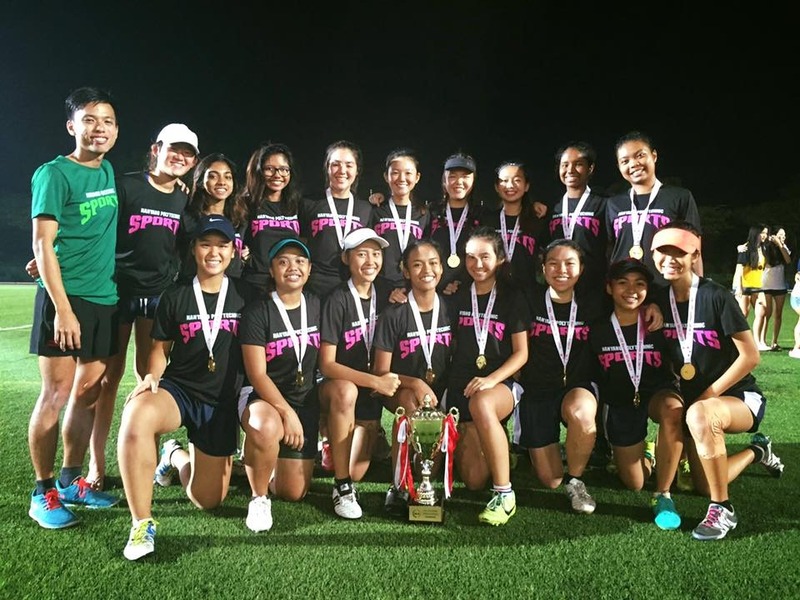 As part of the partnership Worn2Win have secured the Title Sponsorship rights for the Singapore International Touch Knockout (SITK) tournament which will now be titled as the Worn2Win Singapore International Touch Knockout held in June. The tournament has been hugely popular with 40 teams throughout Asia battling it out for the title across a two day knockout format in 4 categories (Men’s, Women’s, Mixed Opens & Men’s Masters). 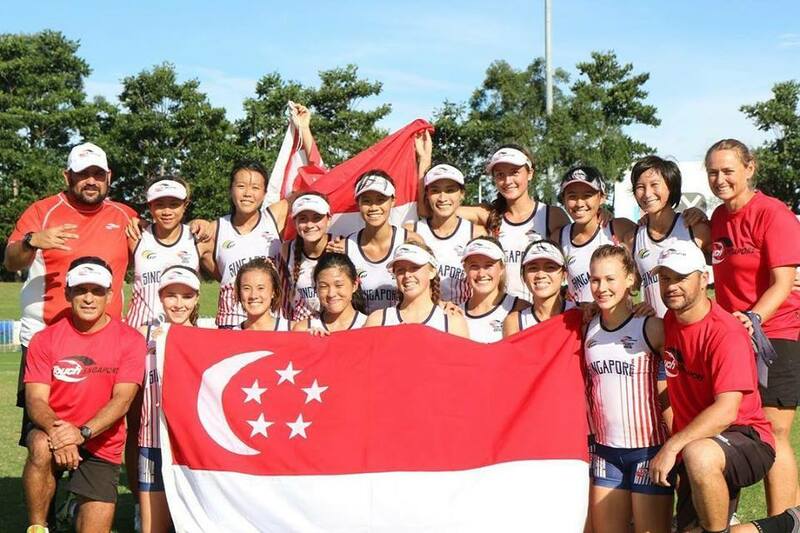 The competition is entering it’s second edition this June and is highly anticipated as it also coincides with Singapore Women’s Open team hosting Japan in their first ever 3 Test Series on home soil. Another exciting development sees the first supporters merchandise range set to be launched at the SITK where Worn2Win will have a merchandise tent set up for the event and an online store platform will be launched in the coming months allowing Touch fans to purchase official Touch Singapore merchandise. 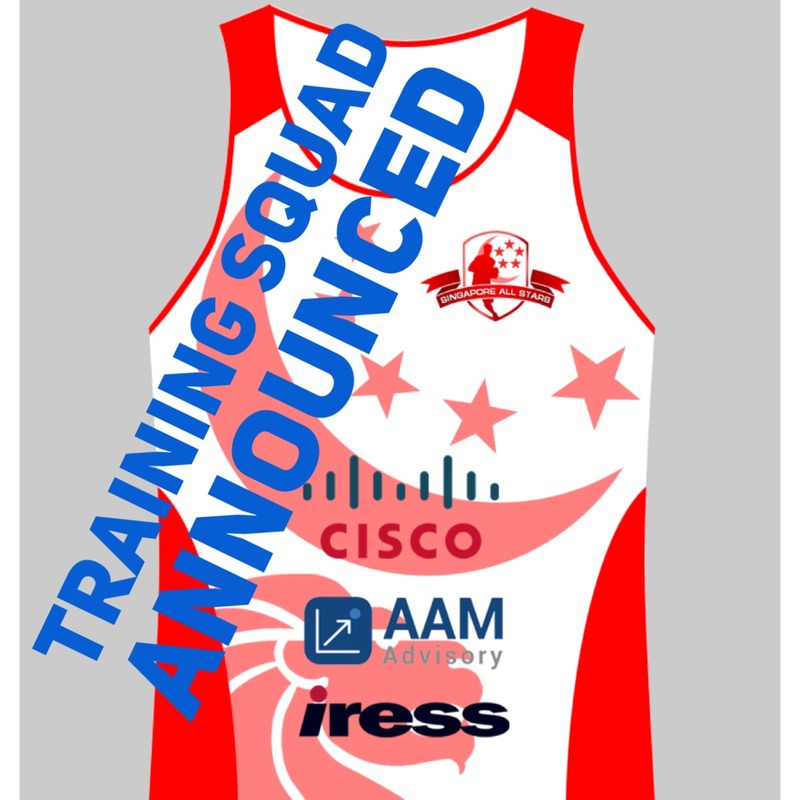 TSG will be announcing details for the club kits programme in the coming weeks and will share with club officials throughout the AAM Advisory Touch League for kits to be ordered ahead of the upcoming Winter Touch League in August. Worn2Win would also like to invite all clubs to visit them at the merchandise stand over the weekend of the 9/10th June where examples of their playing kit will be on display for you to see and feel their range of products. Had fun at the last league? Raring to compete at the highest level on the world stage? The Trial for all possible categories will be held on 24th June 2018, 2pm - 5pm. Venue to be confirmed closer to date. We are also looking for Coaches and a Manager for the Women's 27s Team! 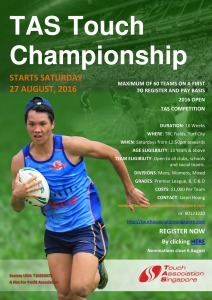 If you are interested, please email Anne at coaches@touchsingapore.net. All payments go into TSG coaching development. Participants who complete both theory and practical segments will receive a workshop participation certificate. Players interested to compete and represent Singapore in the Mixed Open in the Touch World Cup 2019, please see info on form. All players are to fill up and submit trial form to indicate your attendance for trials. This form will close on Sunday 1st April 2018, at 2359HRS. The 3rd Singapore Junior Touch Championships (SJTC) 2018 is fast approaching. 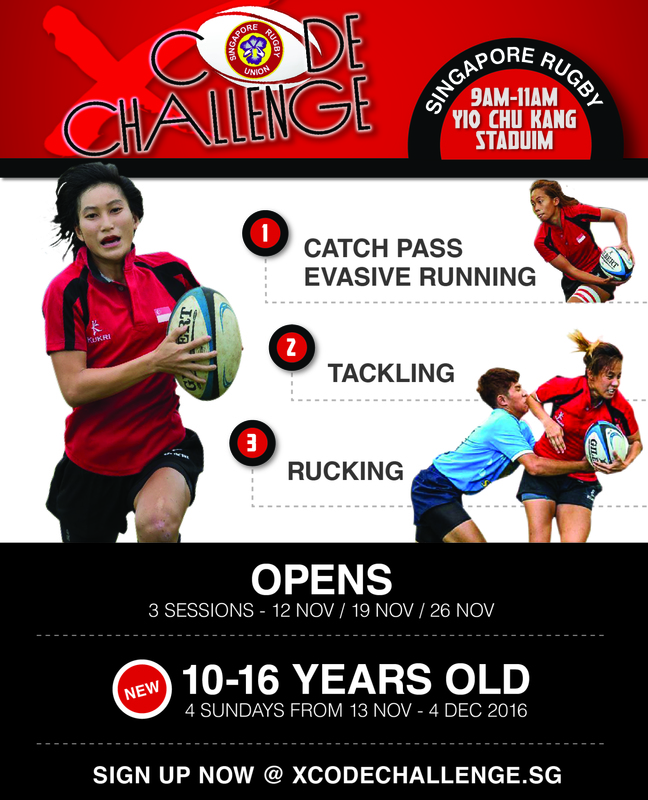 Due to unavailability of playing grounds this year, the SJTC will be a cut down version played from 1pm - 7pm at Tanglin Rugby Stadium Turf City. The SJTC has been very popular the last two years and with restricted playing space please register early to avoid missing out. The tournament is open to clubs, schools or just a bunch of friends putting in a team together. The attached flyer provides the basic details with specific details of the tournament proceedings to be sent through as we draw nearer to the date. As a guide all teams can expect to play a minimum of three games and teams reaching the grand final can expect to play a up to five games. Game duration will be flat 20 minutes with touch down turn around. TSG is a not for profit organization and as such the entry fee of SGD $280 per team is to recover costs. 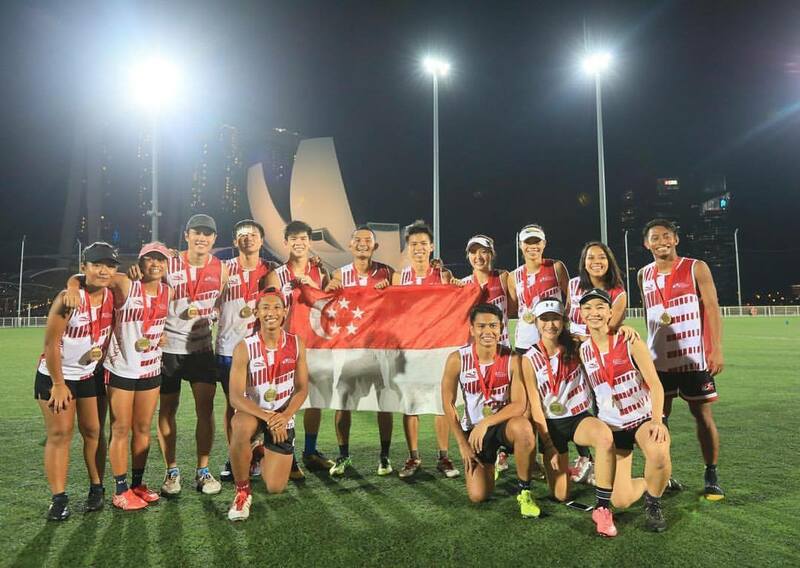 Touch Singapore are delighted to announce the national coaching appointments of the following playing categories which will run through to the conclusion of the FIT Touch World Cup 2019, Women's open, Men's open, Mixed open, Men's Over 30's, Mixed Over 30's, Men's Over 40's. 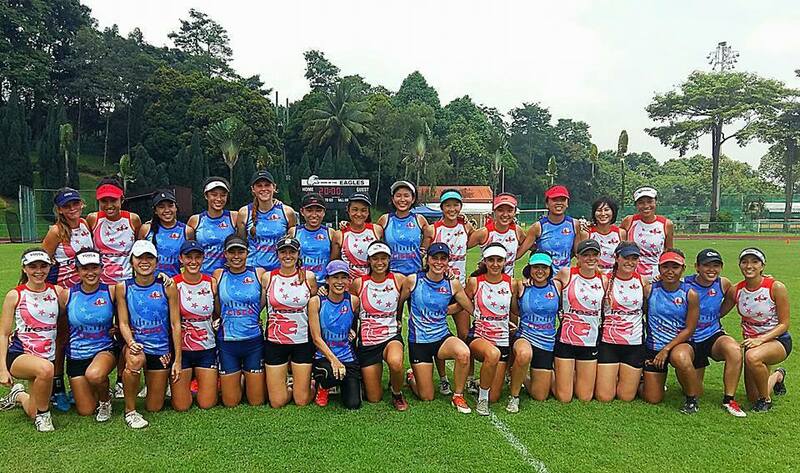 With just over 1 year to the FIT Touch World Cup, hosted by neighbours Malaysia, we are extremely pleased to be in the position to have settled all head coaching assignments before the national trials which will take place over the coming days and weeks. 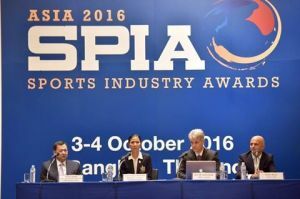 We believe that this provides strong foundations from which to launch our World Cup campaigns with the focus now immediately turning to ensuring our elite players are provided the best possible preparation for what is expected to be a very exciting tournament that Singapore has high hopes for and to continue our impressive record of past tournaments. Full details of the coaching appointments can be found within the attached release below. Touch Singapore would like to thank all that applied for consideration in this process and the coaching committee led by Anne Goh for their diligent work to ensure a full, fair and thorough process we undertaken. 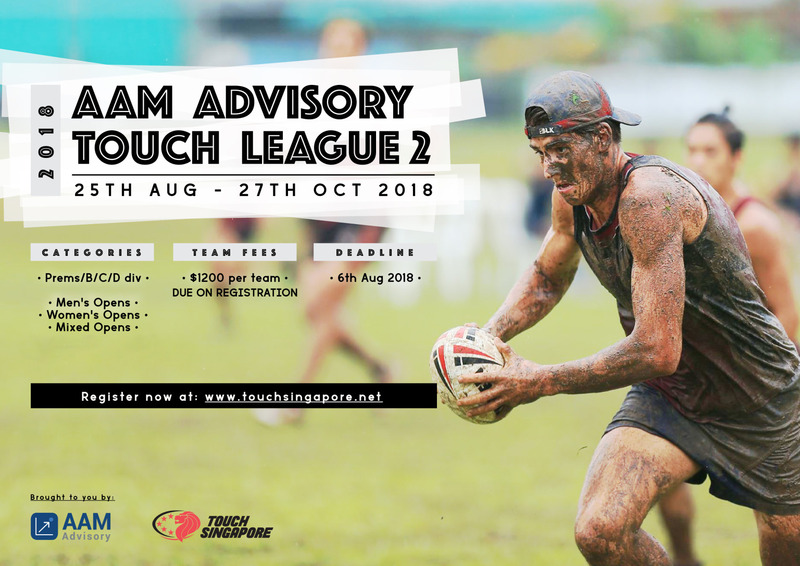 Finally, we would like to wish all our appointed coaches the best of luck to deliver a successful campaign with the full support of Touch Singapore. 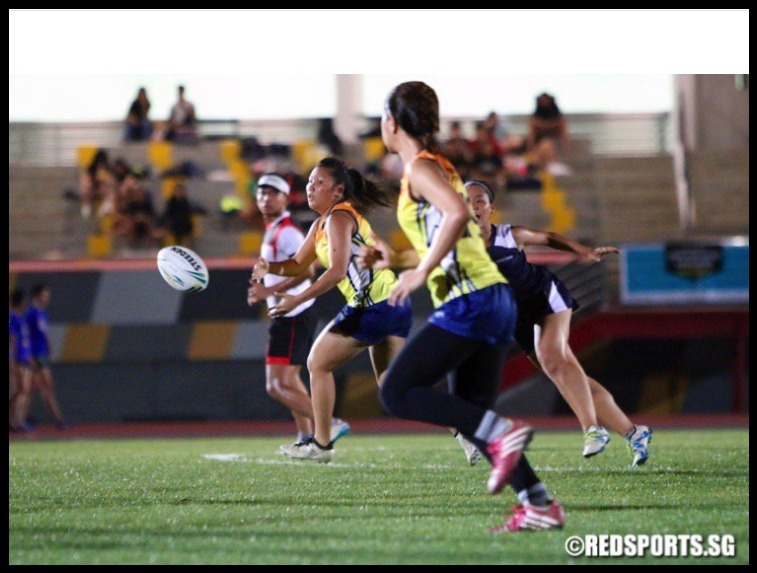 Singapore International Touch Knockout (SITK) June 9/10 2018! Throwback to the fast action at The Singapore Touch Knockouts 2017 (SITK)! Strong interest for the second edition of the SITK 2018 with a number of international teams making their way to the island of Singapore. 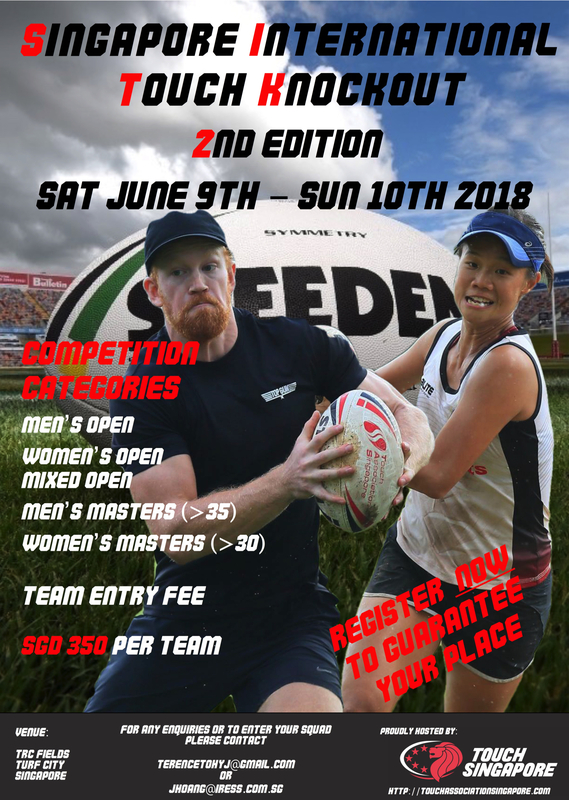 Entries will be restricted this year as we will also be hosting Test Matches between Singapore V Japan as show piece games during the tournament. We suggest if you haven’t already done so to register and confirm your place at the 2018 SITK to avoid disappointment. 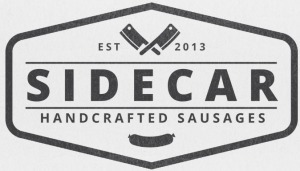 Echo Cafe - New TSG Sponsor! 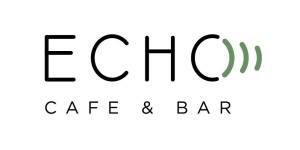 Touch Singapore are delighted to announce that we have secured a new partner, The Echo Cafe to provide onsite Food & Beverage services at TRC fields for the duration of the TSG league season. By bringing Echo in to the Touch Singapore family, we are now able to ensure all Players, Match Officials and Organisers are able to get fast and easy access to high quality meals and refreshments to boost energy levels throughout the day and we no longer have to make the trek over to Grandstand when we need a bite to eat. All TSG club members are also entitled to 20% OFF on all a la carte breakfast and lunch menu on weekdays when visiting The Echo Cafe which is located on China Street in the CBD. We look forward to all our TSG members sampling the produce on game day and popping in for a coffee! 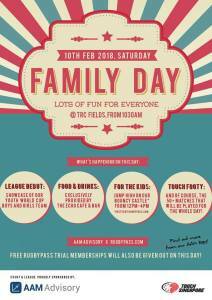 With the league season now just 4 days and counting we are delighted to announce that we will be hosting our first FAMILY DAY this coming Saturday at TRC Fields to coincide with the official launch of the AAM-Advisory Touch Singapore League 1. 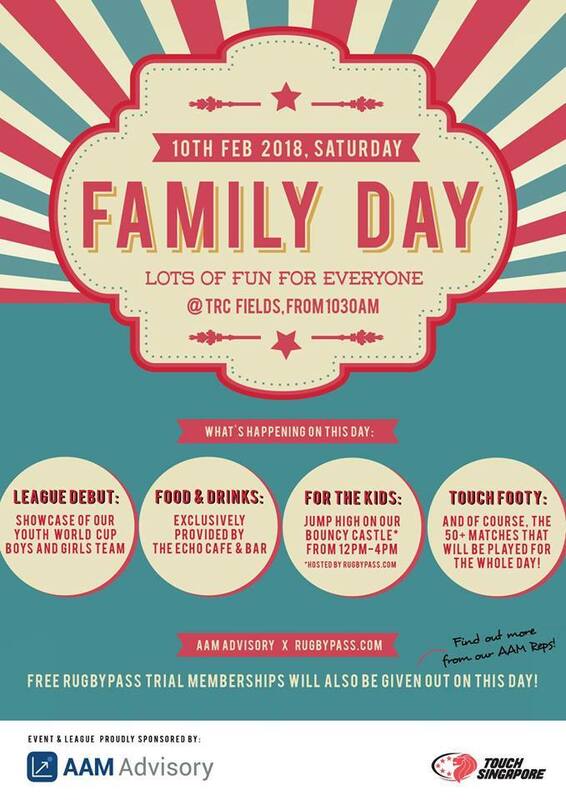 We have a host of great activities on site including a bouncy castle for the kids, fabulous food and beverages supplied by our new F&B Partners The Echo Cafe as well as the excitement of the league debut's of our Youth World Cup (YWC) squads playing in the Men's and Women's Premiership divisions respectively. 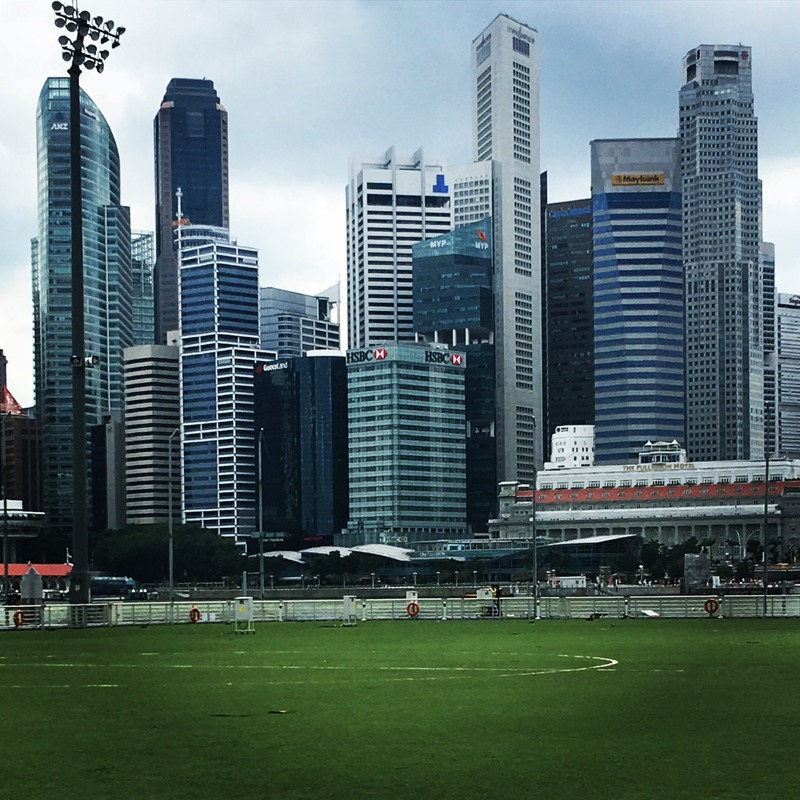 YWC teams will be in action at 1pm / 3pm and 6.50pm so be sure to watch the future of Singapore's elite touch players take the fields for the first time. There will be some great promotions on offer thanks to our sponsors AAM-Advisory who have partnered on the day to provide complimentary access to RugbyPass who are Asia's premier Rugby content streaming platform. Find the AAM representatives who will be on site to claim your pass. It's sure to be a great day out so please spread the word invite your friends and relatives to come down and enjoy the action. We anticipate some big crowds so please do make a day of it! Referee Courses for the first half of the year are out! With the growth of players, we equally need the support of the community to support referees to ensure that we can play and raise the standard of your game. Each team/club is expected to have a ref for the upcoming season so get your mates in! Sign up here! 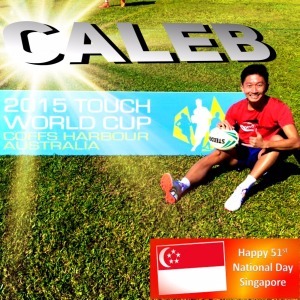 Touch World Cup Player EOIs Open! The FIT Touch World Cup 2019 will be held in Malaysia next year. Touch Singapore (TSG) welcomes all players to express your interest to represent the country! All categories and info are on the form below. Should you wish to request for any dispensation, please fill in this form along with the EOI. 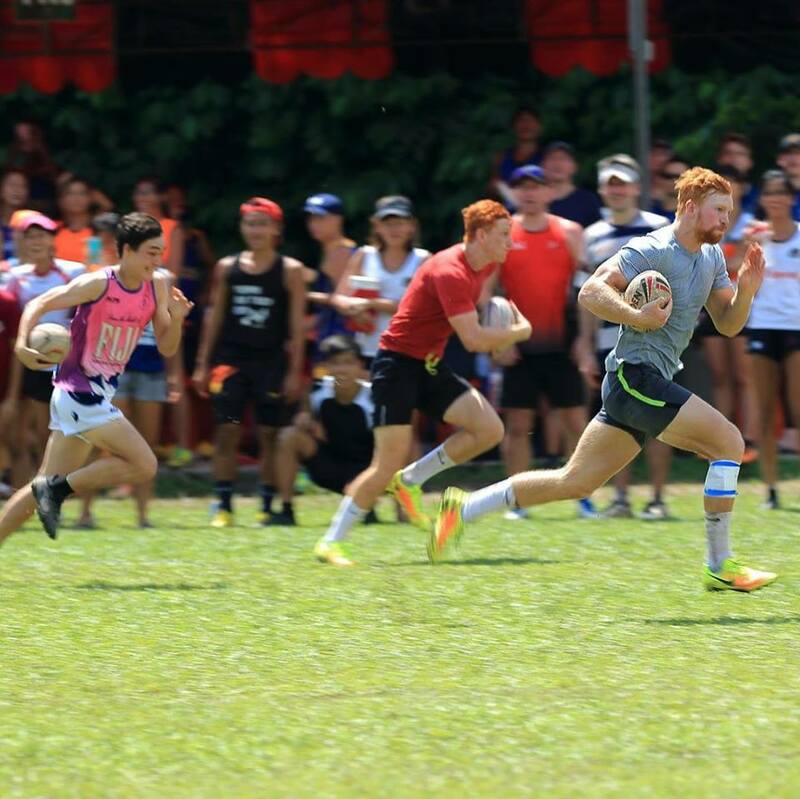 Touch Singapore is calling for an Expression of Interest(EOI) to all interested coaches and managers for the FIT Touch World Cup(TWC) to be held in Malaysia in April/May 2019. The following categories will be contested at the TWC - Men's Open, Women's Open, Mixed Open, Men's 30s, Men's 40s, Women's Open, Women's 30s, Mixed 30s. See attached announcement for Singapore National U20 Youth Male Squad. Congratulations boys! All teams are fixed and set. Let's go Singapore! 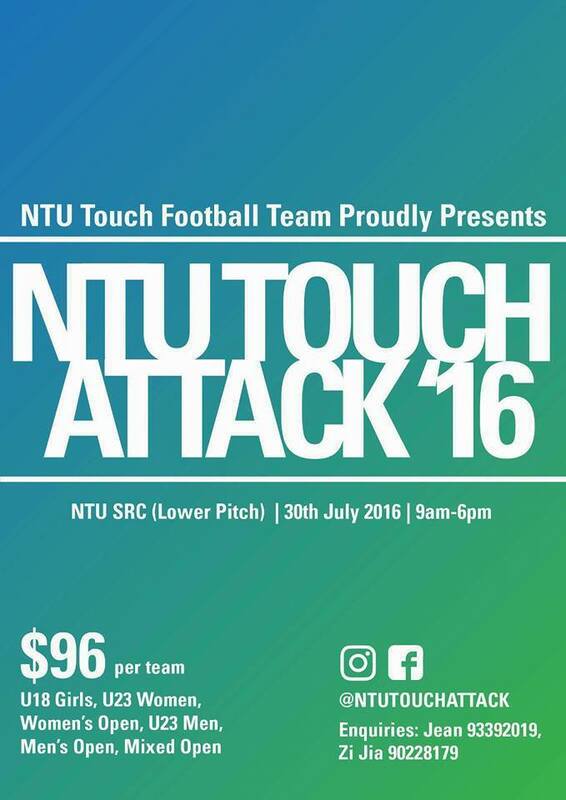 Touch Singapore (TSG) is pleased to bring our member teams this promotional ball offer. 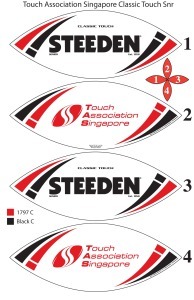 Each ball will come branded with the NEW Touch Singapore logos and the logo of our league sponsors AAM Advisory. Balls will cost $35.00 each ($2.00 less than retail) and are to be ordered in multiples of 5 units. For every 5 units purchased TSG will give your Club / Uni / Poly / School 1 EXTRA ball FREE. 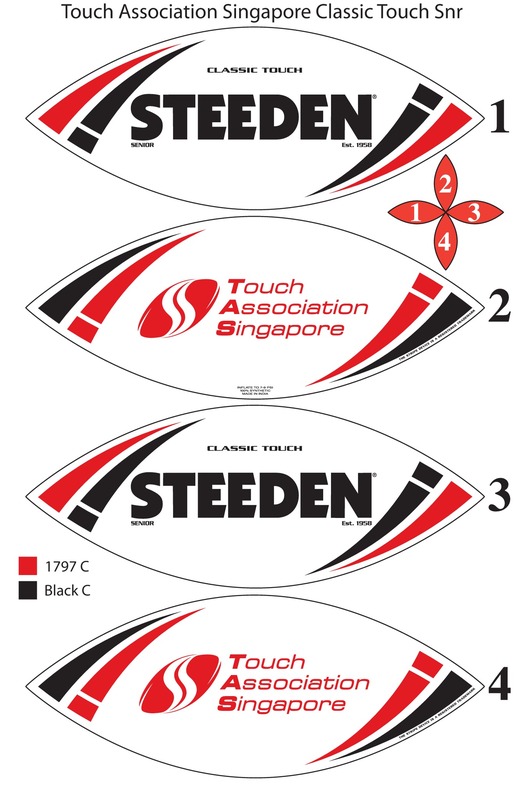 To place your order for the new Touch Singapore Steeden Classic balls, please complete the form below in full. You will be required to make payment no later than 29th December to ensure your order is processed. Failure to pay by the closing date will result in cancellation of your order. Delivery is anticipated to be during February. See attached announcement for Singapore National U18 and U20 Youth Female Squads. Congratulations to all! Let's go Singapore! Please see attached expression of interest form to coach or manage the Singapore Mixed Under 18 Team for Youth Touch World Cup 2018. More info can be found on the form. EOI to to be submitted by Wednesday, 22nd November 2017 2359HRS. Please see attached Expression of Interest document if you wish to contribute to the growth and development of Singapore Touch as a member of the Coaching Commission. 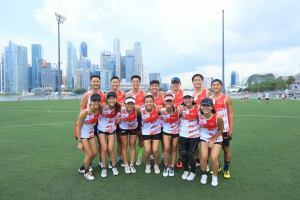 Singapore International Touch Knockout 2018!! 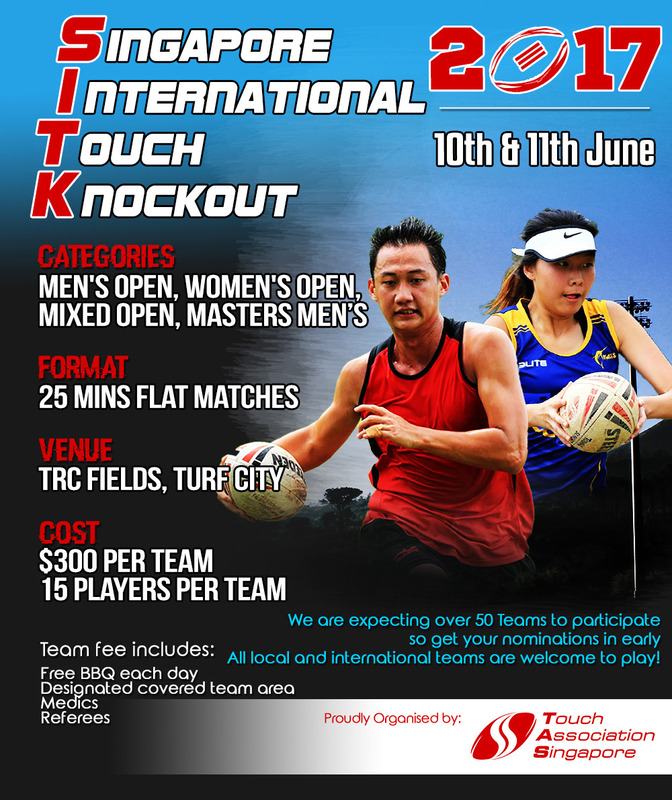 The Singapore International Touch Knockout (SITK) will return for an second edition next year after an extremely successful debut this year! 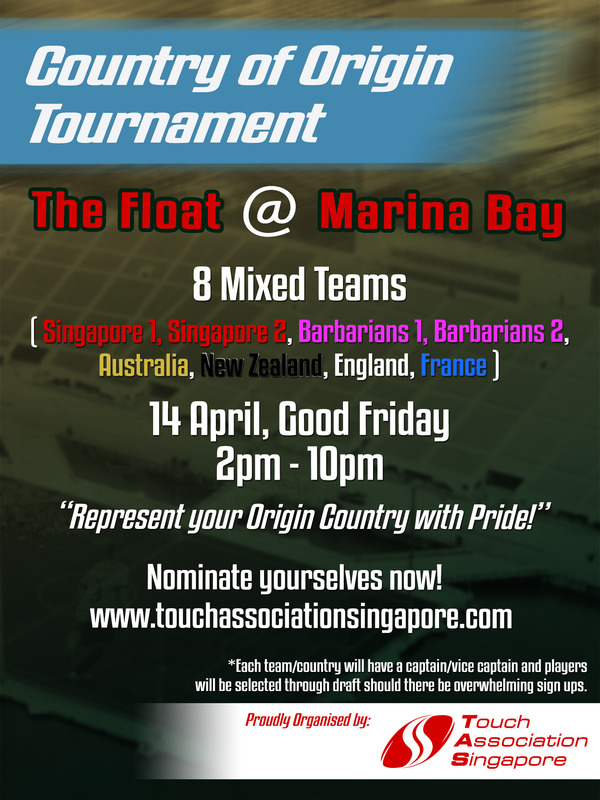 The best of Singapore's Touch will aim to compete against the best international teams from Australia, New Zealand, Asia and around the world! Lock down the dates (9th and 10th June 2018). Entry is only SGD$350! We look forward to seeing more international friends coming down this year! Register now on our website so that your team won't miss out on SITK 2018! "Touch Singapore" (TSG) is in search of a Selection Panel to assist in selecting our Singapore Youth World Cup players to participate in Malaysia, August 2018. Ideally TSG are looking for a dedicated panel to see through future team selections over the coming year(s). The panel are accountable for selecting the best possible team from the available players.They must display honesty, objectivity and impartiality in their findings and recommendations and must have the ability to work in the team environment. Finally, professionalism is required at all times. This includes behavior and appearance, such as appropriate uniform and attire both on and off duty. 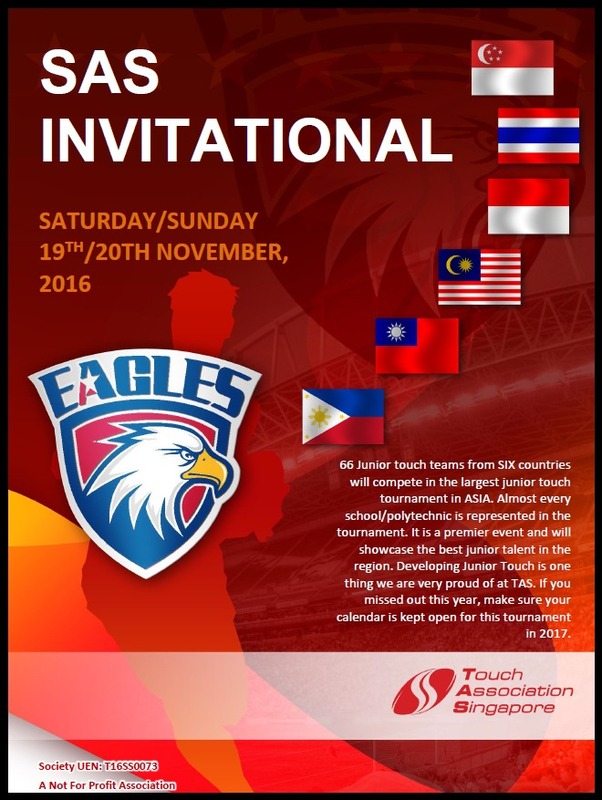 TAS is calling for an Expression of Interest(EOI) to all interested players, coaches and managers for the FIT Touch Youth World Cup(YWC) to be held in Malaysia in August 2018. The following categories will be contested at the YWC - Boys U18, Girls U18, Mixed U18, Mens U20, Women's U20s and Mixed U20. 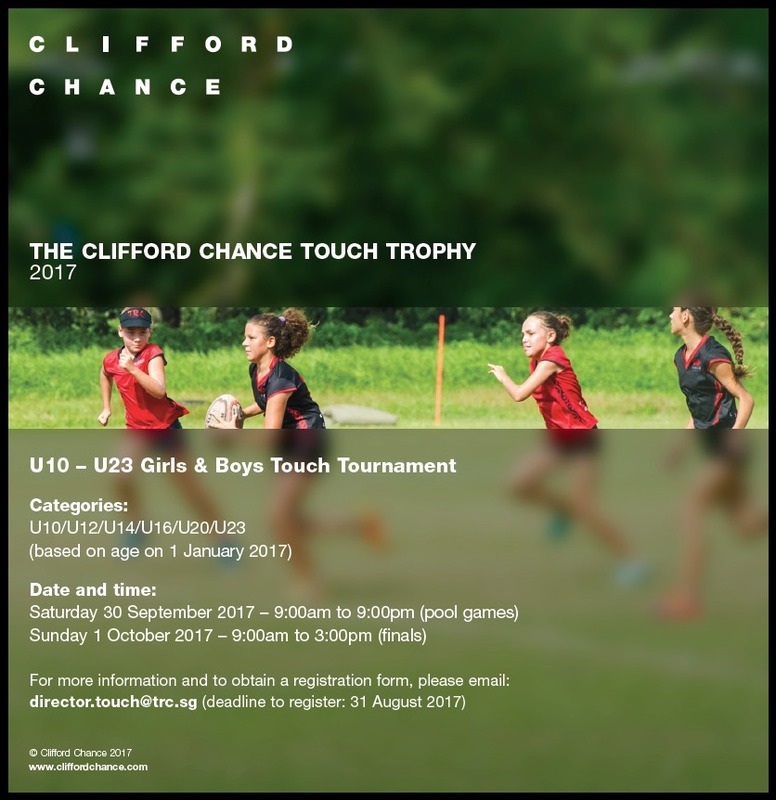 September 2017 will mark the 11th year of the Clifford Chance Touch Trophy Tournament! 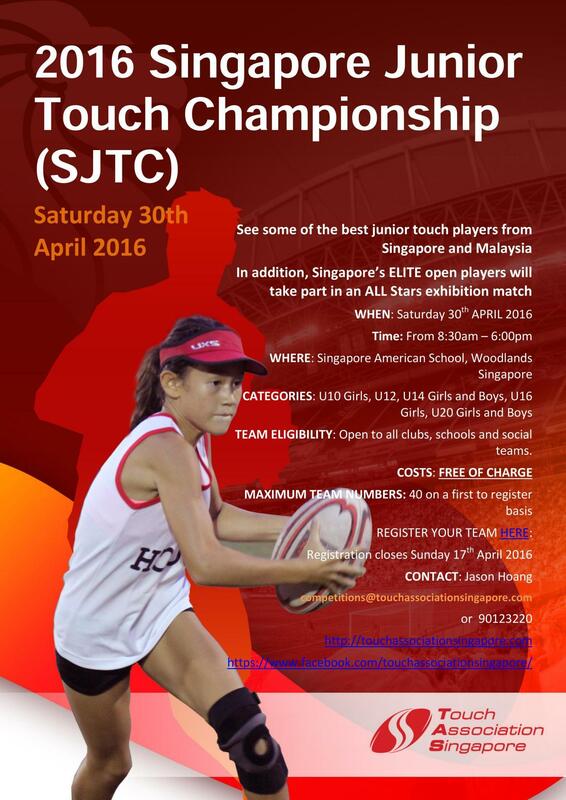 Junior Touch Action Rolls On With 44 Junior TEAMS to play in the SINGAPORE JUNIOR TOUCH CHAMPS MAY 6TH. 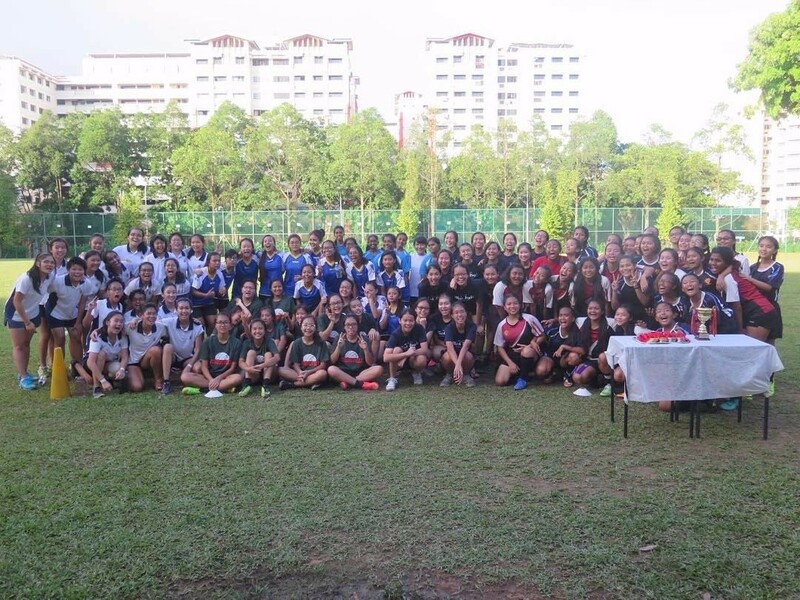 The weekend of (April 29/30) will see Tanglin rugby club send 7 juniors girls (80+ girls) Touch teams representing teams from Singapore to take part in the KL Tigers Rugby 10’s and Girls Touch Rugby Tournament. 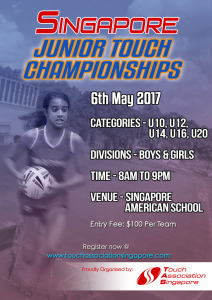 The following weekend (Saturday May 6th) back in Singapore will be the TAS 2nd Singapore Junior Touch Championships (SJTC). 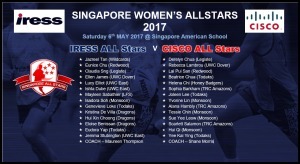 A record 44 Junior teams (up from 37 last year) will participate in an all-day event generously hosted by the Singapore American School. There are so many opportunities for children to play tournament Touch and signals continued development of the sport for the community. The children will also be able to watch the Singapore Open Women and Men’s All Star Exhibition matches that will be played during the SJTC. What an epic Grand Final in the Singapore National Junior Colleges Championship ( NJCC) played in front of the largest Touch crowd witnessed – it was loud and it was awesome. After four weeks of round robin games it came down to a truly nail biting drop off. 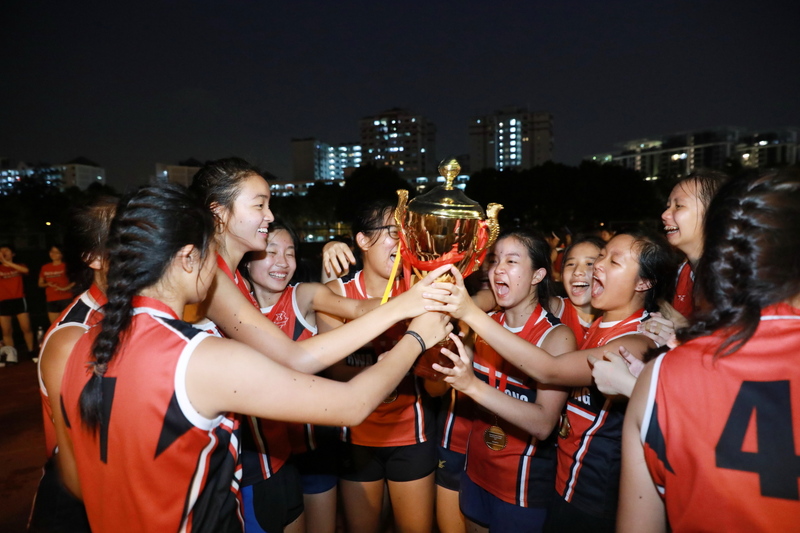 Congratulations to Hwa Chong Institution against a very spirited SRJC. On behalf of TAS we would like to take this opportunity to thank all teachers and coaches for their efforts again this year. Players from both teams showed a lot of strength in the final and displayed the skills illustrating why both teams deserved to be there. From the reactions from all the teams after their final matches yesterday, you could tell the whole experience meant a lot to all NINE colleges that participated and it would not have been possible without everyone’s contribution to make the NJCC the success it has been. TAS has enjoyed supporting the NJCC and particularly fostering the grassroots development of Junior Touch . Onwards and upwards for Singapore Touch and everyone involved. 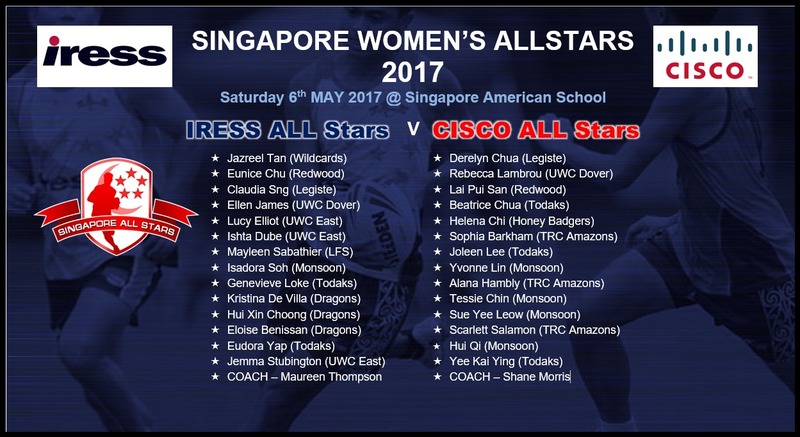 The 2017 Singapore All Stars draft took place last night at Turf City and congratulations to the 28 players selected for the IRESS and CISCO All Star Women's teams respectively. Special mention to Jazreel Tan for being the number one draft pick for team IRESS and also to Derelyn Chua for the number one draft pick for team CISCO. These are our elite players in Singapore with a host of World Cup experience among them. The game will be played as an exhibition match during the Singapore Junior Touch Championships held at the Singapore American School on Saturday 6th May. A great opportunity for our elite players to play in front of a huge appreciative crowd. Credit to the ACT(Canberra) All Stars for sharing this great concept with us. Thank you to multinaltionals IRESS and CISCO for their continued support. The 2017 Singapore All Stars draft took place last night at Turf City and congratulations to the 28 players selected for the IRESS and CISCO All Star men's teams respectively. Special mention to Terence Toh for being the number one draft pick for team IRESS and also to Mattias Chia for the number one draft pick for team CISCO. These are our elite players in Singapore with a host of World Cup experience among them. 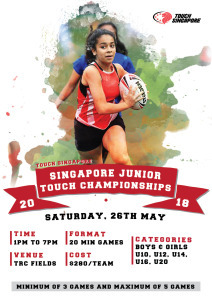 The game will be played as an exhibition match during the Singapore Junior Touch Championships held at the Singapore American School on Saturday 6th May. A great opportunity for our elite players to play in front of a huge appreciative crowd. 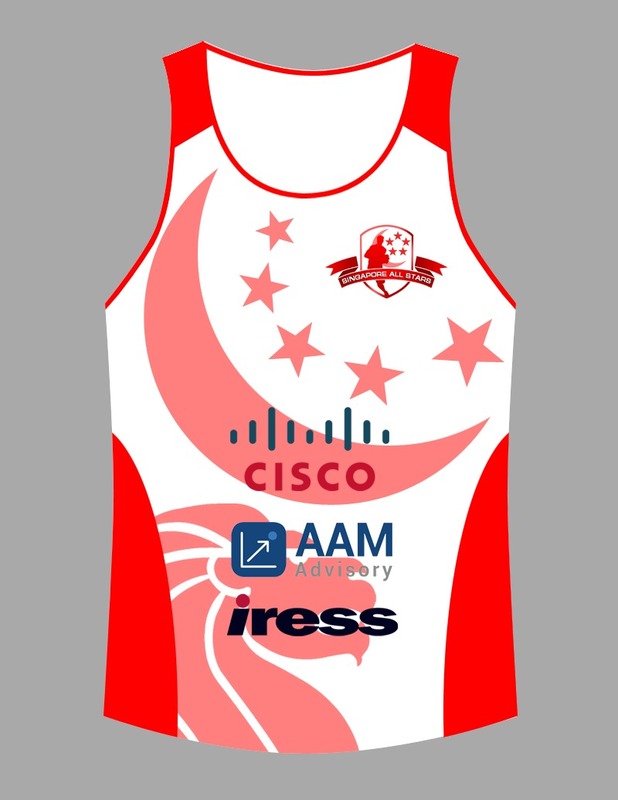 Thankyou to multinaltionals IRESS and CISCO for their continued support. 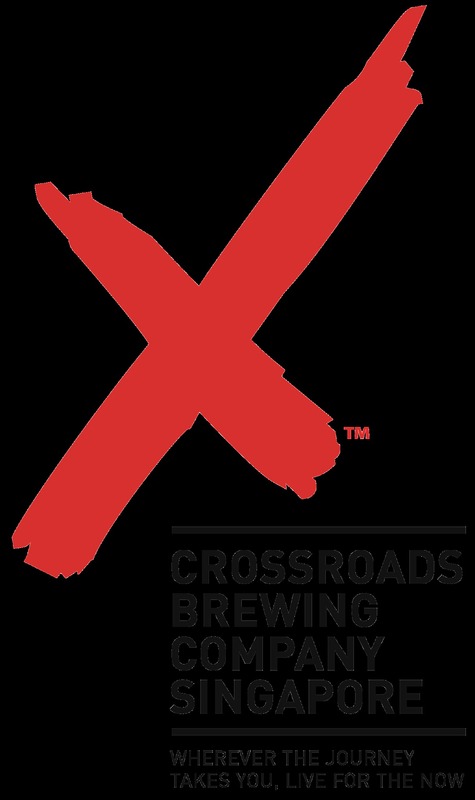 TAS are pleased to announce that our partners Crossroads Brewing Company Singapore, will be supporting a subsidised bar on Saturday, which should add to the usual great party atmosphere that is TAS Grand Finals Day. Thanks to Crossroads, who like TAS, are a new and exciting Singapore institution EACH adult team will have vouchers/tickets for 10 FREE glasses of Crossroads beer and with recent memories of bland, mass produced beer at $12 a glass we are pleased to be offering subsequent glasses of quality Crossroads brew at ONLY $5per glass! It is a great deal and will benefit all parties involved. We are sure you are going to enjoy these beers after your hard work in the play offs, or if you are out in the HEAT supporting. There will also be a Crossroads desk next to the bar for special offers for TAS members to have Crossroads bottles delivered directly to home OR OFFICE at one off special rates. New and exciting Singaporean firms like Crossroads are exactly who TAS are excited to be partnering with, and we thank Crossroads for their support of TAS. Our beers are light and session-able with flavour and character, fitting in both the price and flavour gap between mass market offerings and the “super crafty" craft beers from overseas. As an example, our 4.5% alc. Crossroads Summer Ale was inspired by the heat and humidity of Singapore. We wanted a flavourful beer that would quench our thirst and that was light enough for us to enjoy over an afternoon or evening with friends. Proudly brewed in and for Singapore, the Crossroads of Asia, we represent the perfect fusion for the urban adventurer, of old and new, difference in harmony, and celebration of the journey ahead. This is why we are not a heavy or bitter craft beer, nor are we mass and bland. With originality and without compromise, we brew at the crossroads, where the very best meet and naturally blend, delivering an original premium craft brew. We are served around Singapore at some of the city’s finest craft beer tap rooms and party spots. Our Facebook page and untappd.com ratings will also attest to the quality and growing popularity of our brew. We were confident that we could run an efficient tournament but the unknown was how the teams would take to the format and at what level of intensity would the games be played at. Looking back it shouldn’t have been a surprise to everyone that once the teams got out playing for their country that the competitiveness came through. Feedback has been very positive and the final game between Singapore Merlions v Singapore Orchids was a standout. The inclusion of the Junior All Stars added to the atmosphere and at the peak of 5:30pm the stadium was packed including all the parents and interested random public onlookers. Looking ahead to 2018, we envisage expanding the format to 12 countries across two graded pools - planning is already underway. In summing up, many volunteers were involved in staging the event but most pleasing was how everyone came together in the end pitching in to help with clearing and packing up after the event which is what a true community is all about. On behalf of the TAS crew, thank you for making it a wonderful event for everyone to enjoy and we look forward to a bigger and better Country of Origin in 2018. Photos will gradually be uploaded onto Facebook over the next couple of days. An honour to have Singapore's Chef de Mission for 2016 Olympics and President of Singapore Rugby Union Mr Low Teo Ping present at the TAS inaugural Country of Origin Tournament at the Floating Stadium Marina Bay. Such was the success of the tournament that we are already planning to expand it to 12 participating countries in 2018 from the current 8 this year. TAS Country Of ORIGIN Heating Up! 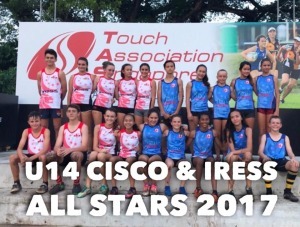 U14 TAS CISCO & IRESS Junior ALLSTARS photo shoot. Only four days until game day to be played at the Floating Stadium Marina Bay as a show piece event during the TAS Country of Origin Tournament. The Junior All Stars match will take place at 6pm. The inaugural TAS Singapore Junior Under 14's ALL STARS. What a fantastic representation across clubs and schools. A massive highlight for the children to play this representative match on the Floating Stadium Marina Bay in front of family, friends and all of the 8 Country Of Origin Teams. Thank you to the two Multinational Companies IRESS & CISCO in supporting the event. Congratulations to the children selected. The inaugural TAS Singapore Junior Under 12's ALL STARS. What a fantastic representation across clubs and schools. 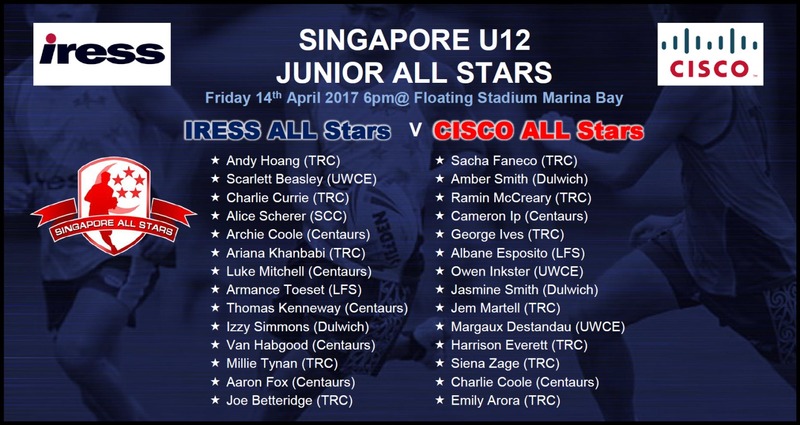 A massive highlight for the children to play this representative match on the Floating Stadium Marina Bay in front of family, friends and all of the 8 Country Of Origin Teams. Thank you to the two Multinational Companies IRESS & CISCO in supporting the event. Congratulations to the children selected. We are one day away from TAS National Junior Colleges Touch Championships! All the JC girls have been training hard and are raring to go tomorrow. First round of matches will be played at Serangoon Junior College on 1st April, Saturday 8am - 11.30am. 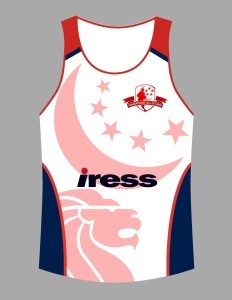 TAS is proud to support Grassroots Touch ensuring longevity and development of the game for Singapore. We will have 8 Fields in play so get your team registrations in ASAP to play against the best players in Singapore and experience the best two day tournament in the country. 83 Children Nominate For Junior ALL STARS! AWESOME response to the the Junior ALL STARS. Nominations have now closed and 83 children have nominated for U12's and U14's teams. Four teams in total will be selected so good luck to all nominees. A great opportunity to play representative touch at an Iconic location and in front of all the Country Of Origin Players. The children will love the atmosphere provided. Great response so far with 71 nominations (selection challenges) for the Junior ALL STARS matches. The CLOSING Date for nominations will be midnight Sunday 19th of March. 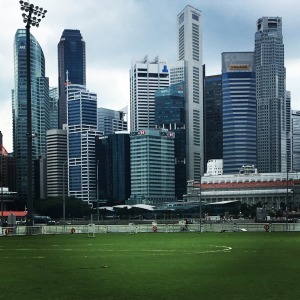 Just a great opportunity for the children across all clubs in Singapore to play representative touch in front of the Country Of Origin Adults and in an iconic location. 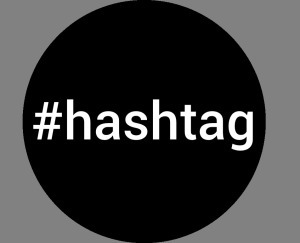 In addition it provides a great platform to promote Junior mixed Touch. Whilst we do know most of the players there will be players we are not aware of so the plan will be to have trial games/drills session on Sunday 26th March at TRC Fields from 5:30pm -7:00pm. • Two Training Sessions for both Age groups will be announced. • Friday 14th April – Game Day! Inaugural Junior All STARS on the Floating Pitch Marina Bay. We look forward to continued success in supporting all women and girls in pursuit of health and happiness. 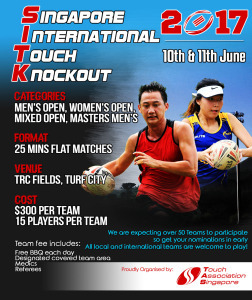 An exciting new tourney, new format known as the Singapore International Touch Knockout (SITK) will be staged in Singapore on Saturday and Sunday June 10/11 at TRC Fields Turf City. The tourney will be capped at 50 teams and we expect this to fill up fairly quick. There will be an international flavor to the tourney with international teams already expressing interest to participate. 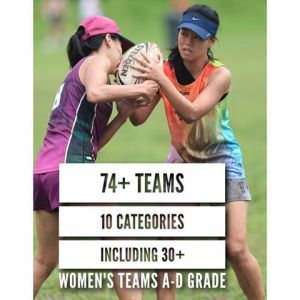 International teams can expect to play against the best teams in Singapore with most of the 2015 world cup national players across all categories participating. • Each team will play at least 3 games on Saturday and at least 2 games on Sunday. • The competition will be six-a-side. • Each game will be 25 minutes duration. • Change ends after each touchdown. • The first touchdown in each match on both days except for the Grand Final on Sunday is worth 3 points; the second touchdown and each subsequent touchdown are worth 2 points. Touchdowns in the Grand Final are worth 1 point. Draws on Sunday will be decided by the drop-off system. • Mixed teams must have the minimum of 3 female players on the field. • A player can’t play for more than one team in a division e.g. Men’s division. • All teams to be at the ground 5 minutes before the game is due to commence. • A points system will operate on Saturday with 3 points for a win; 2 points for a draw; 1 point for a loss; and 0 points for a forfeit. • Any player sent off for the remainder of the game will receive an automatic one game suspension on either day unless the TAS Judiciary believes otherwise. • Players in each team must wear the same playing shirt with a number on the back. Players can’t swap playing shirts. • Each team to supply own touch ball. 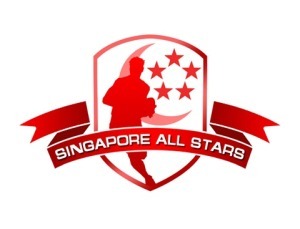 •All decisions by the Singapore International Touch Knockout Disputes Committee are final. We have a partnership with IHG group and can assist any international team in securing favourable rates at the following hotels – whatever your budget we have something for every visitor. Teams that need assistance with local transport we will also happily assist. The TAS National Junior Colleges Touch Championships 2017 (NJCC) Fixtures are now out on our website under 'Fixtures/Results'. 9 local colleges will once again battle it out at 5 different school venues spread over the month of April. This is part of TAS' vision to see Touch played more in local schools ensuring financial accessibility of Touch to the citizens of Singapore. 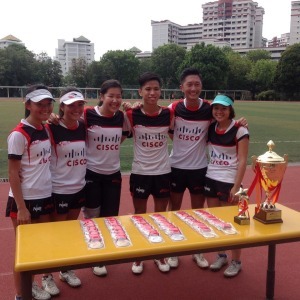 Grassroots secondary schools and college Touch competitions are vital for the future development of Singapore Touch. Many of the students who played in the NJCC last year currently play for various teams in our ongoing 76 Team ATL, signalling a clear youth pathway for our young TAS members. 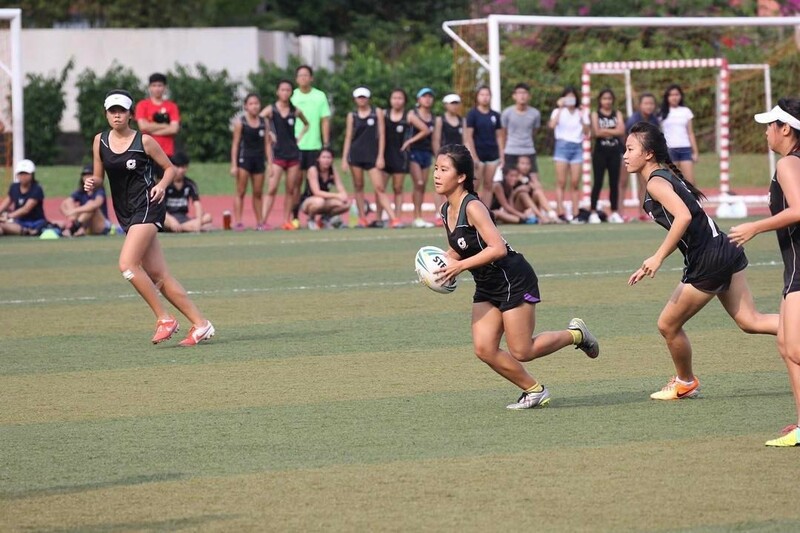 Pictured are Raffles Institution players playing NJCC 2016. 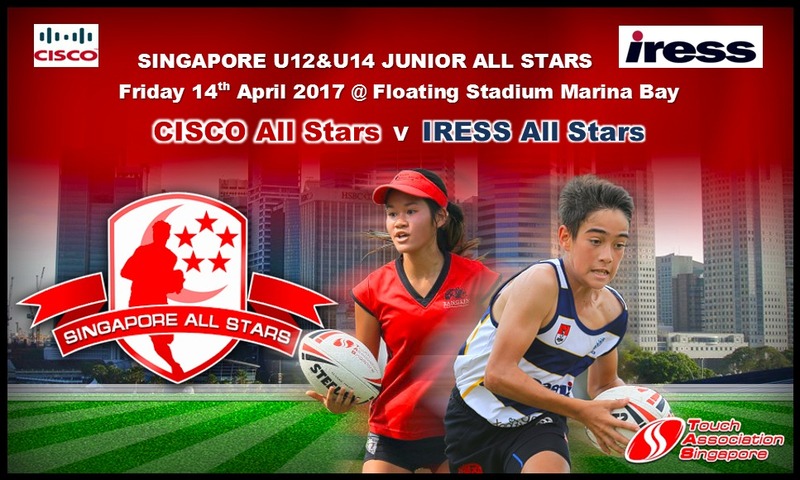 The inaugural Singapore U12 & U14 Junior Mixed ALL Stars 2017 will bring together the best available juniors from across all clubs to participate in an exhibition All Stars match. These matches will be MIXED category up to 14 players on each team. There will be an U12 match and U14 match which will be played on the Floating Pitch Marina Bay in conjunction with the TAS Country of Origin Tournament Friday 14th April 2017. These Junior ALL Star matches are planned to be played between 5-7pm with exact timing to be confirmed over the next few weeks. Coaches will shortly be appointed for each of the four teams. All nominated players will be entered into a draft and opposing coaches will take in turn in selecting their players. However, prior to this process taking place there may be a trial session whereby coaches can assess players over a series of trial games (subject to demand for places). CISCO and IRESS have sponsored this event so it will be FREE for the children to participate. 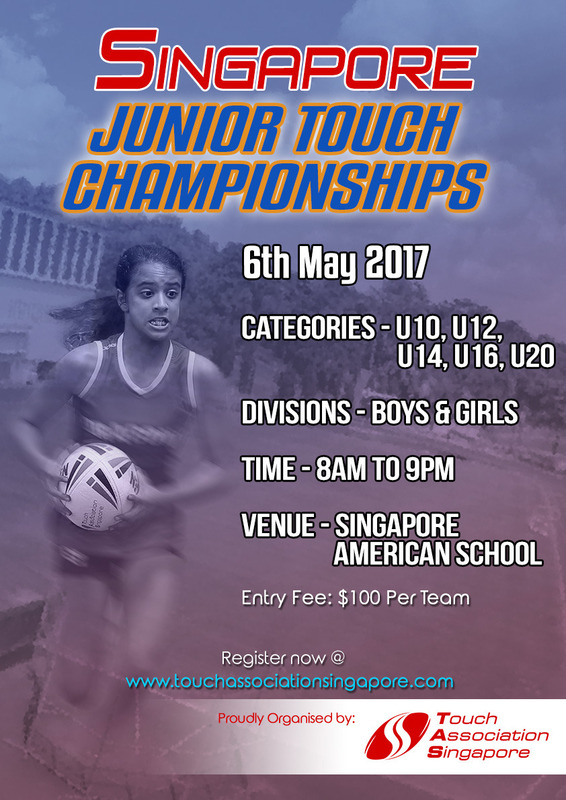 The 2nd Singapore Junior Touch Championships (SJTC) 2017 will bring together Juniors from across the region to participate in what will be another exciting tournament for the junior touch participants. Last year we had over 50 teams compete and we are expecting similar numbers this year. Another chapter in the development of Junior Touch awaits and this year’s tournament shapes up to be another top line event. We have new variations lined up for the fun and exciting DASH for CASH break out which seems to be very much enjoyed by the children. Team entrants will be restricted due to limited fields so we encourage nominations and payment early to avoid disappointment. With the support of the Singapore American School and TAS, we are able to host this event at a nominal team entry fee of SGD $100. 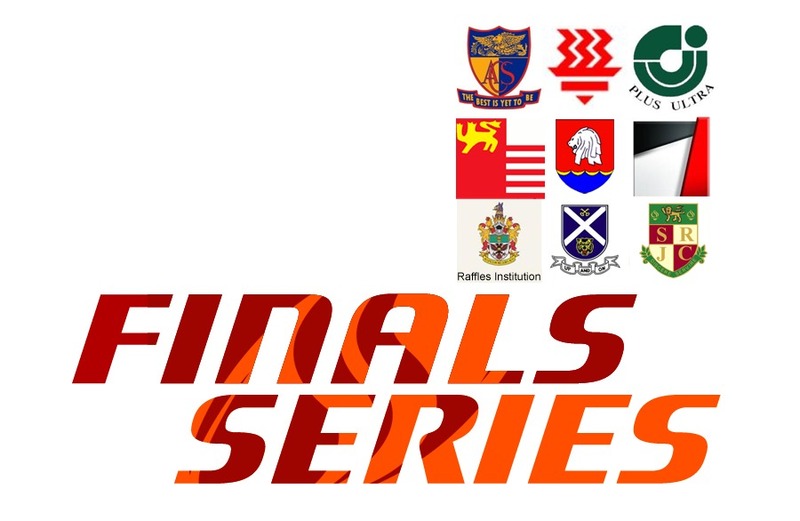 At this early planning stage it is envisaged that U10’s, U12’s and U14’s will be completed by 2pm and the older age groups to start in the afternoon with finals under floodlights. 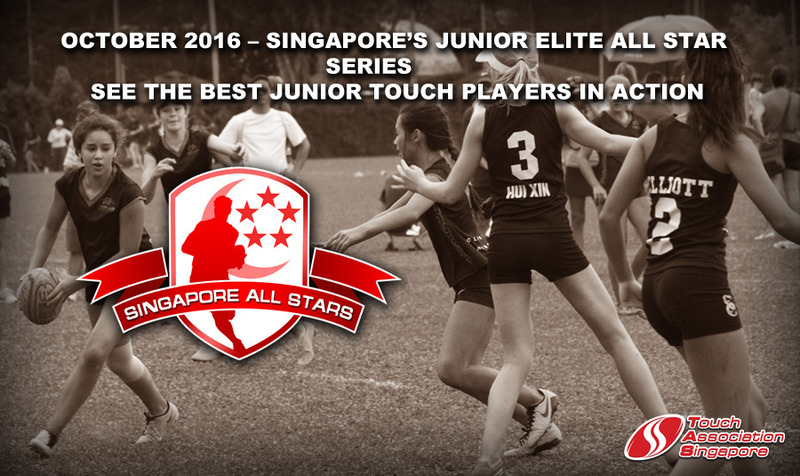 The Singapore All STARS will also be playing exhibition matches to showcase to our JUNIORS Elite Touch at its best in Singapore. Please click on this link to nominate your team. 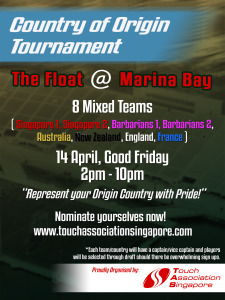 TAS Country of Origin Tournament will be held at The Float @ Marina Bay on Friday 14 April. 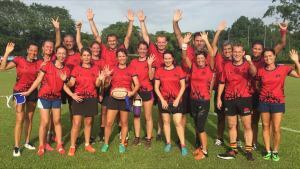 What a great STORY: See below a recount from one of the mums taking part in their first ever touch league game. TRC MAD take to the pitch for their first game in the TAS League!! I, for one, was expecting blood, sweat and tears during our Touch MAD’s first appearance against a very young and sprightly Centaurs Viking Team last weekend but I am very glad to say that, although, there was a lot of perspiration and tired bodies after our 40 minutes there were no injuries and only big smiles on everyone’s face at the end of the match. After only nine lessons - and I think some of our team only had two or three - we went out on to the pitch expecting nothing but humiliation and a large scoreline against us. Well I think we surprised ourselves. Appearing like we were actually enjoying playing and wanting to go back out on to the pitch, I think we were all delighted with the final score of 3-8. Not bad for some ‘middle aged’ - apologies to those that are not! - beginners on their first outing. As our co-captain Jon McNaught said it is good that we can give the message that ‘social, competitive sport should not end in the high teens but should continue all the way up to us parents as an example to our kids. Even if this involves a lot of eye rolling from them! All of us recognised that we wouldn’t have been such a cohesive and happy bunch if we hadn’t had our multi-talented coach-player-manager Jon Stonham to encourage, educate and direct us, aided ably by Coach Malcolm. It really made a difference having two seasoned Touch players there telling us what to do and where to be! Despite our performance, there are many areas that we still have to put a lot of work into. One that I heard everyone mention at the end was that we seem to have forgotten how to do the basic ‘A’ drive up the pitch and a few people admitting too ‘overstepping the mark'. It seems that we misplaced a few of our basic drills that we have learned over the weeks, so there is still a lot of work to be done on perfecting these. 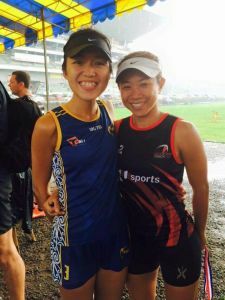 TAS is delighted to present our newly elected President, Jeslyn Lim and Coaching Director, Jazreel Tan who will be replacing Graeme Lees and Shane Morris respectively. Graeme Lees has led TAS for the past year with a lot of passion and advocates standing up for the right causes firmly. TAS achieved 70+ teams playing in the weekly leagues, an amazing achievement in any sport let alone Touch. His contributions in this historic year for TAS will not be forgotten. Graeme will be returning to Australia. 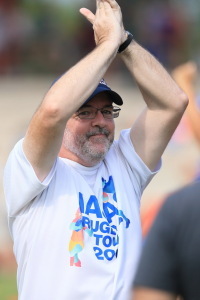 Shane Morris, National Women's Coach, highly respected in the local Touch scene has supported and fought for many notable causes this past year. He will be greatly missed by many and especially those coached under him when he leaves for New Zealand. 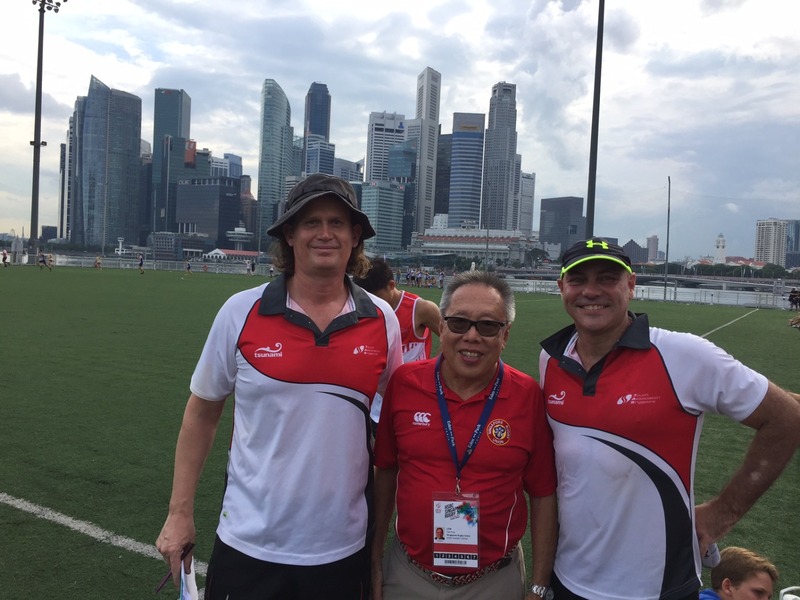 TAS and the community would like to put on record their heartfelt thanks to both men for their contributions on the committee to the Singapore Touch Community. 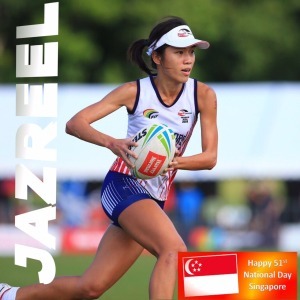 Jeslyn Lim is a 2 time Bronze Medallist at Touch World Cups and Silver Medallist representing Singapore in Rugby at the SEA Games. 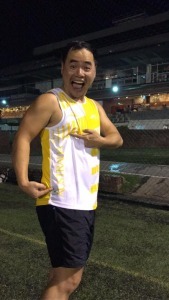 Jes was also Co-Captain of the Women's National Team at the World Cup and served as Vice President of Monsoon Touch Football Club in the past. Upon acceptance of her role, she expressed a great desire to support and bring Touch to the next level. 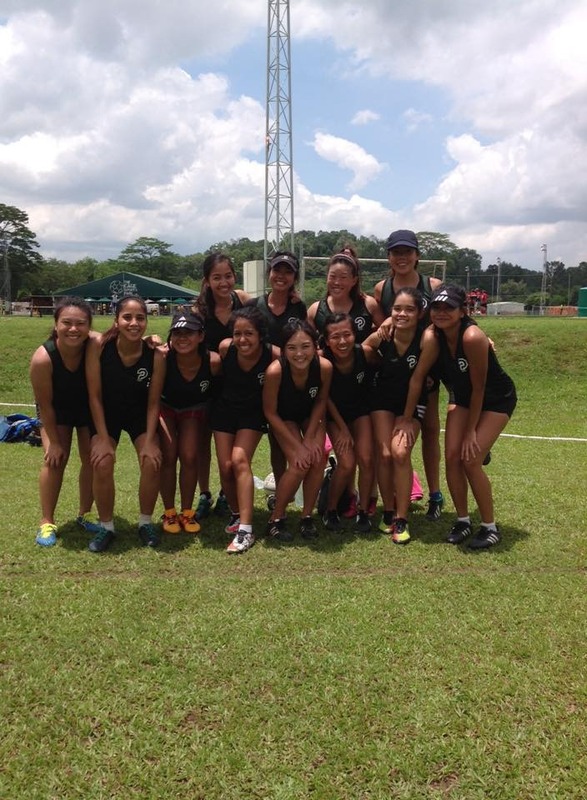 Jazreel Tan is also a 2 time Bronze Medallist at Touch World Cups. She was Co-Captain of the Women's National Team at the World Cup and served as Vice President of Todaks Touch Football Club in the past. She has coached Singapore Polytechnic for a number of years and has been successful in bringing many girls through the system to her alumni team, Wildcards who won the Women's Premiership last year. We look forward to her sharing her coaching expertise and direction with the community. Both local ladies stepping up to the plate is an extremely positive sign for the Singapore Touch Community. TAS hopes that everyone will display the same spirit & contribute in your own little ways as we continue to press on in 2017. Thank you and looking forward to seeing everyone at Turf tomorrow! In line with our Constitution, TAS held her AGM on the 24th Jan, Tuesday at UWC Dover which was well attended by members of the Singapore Touch Community. 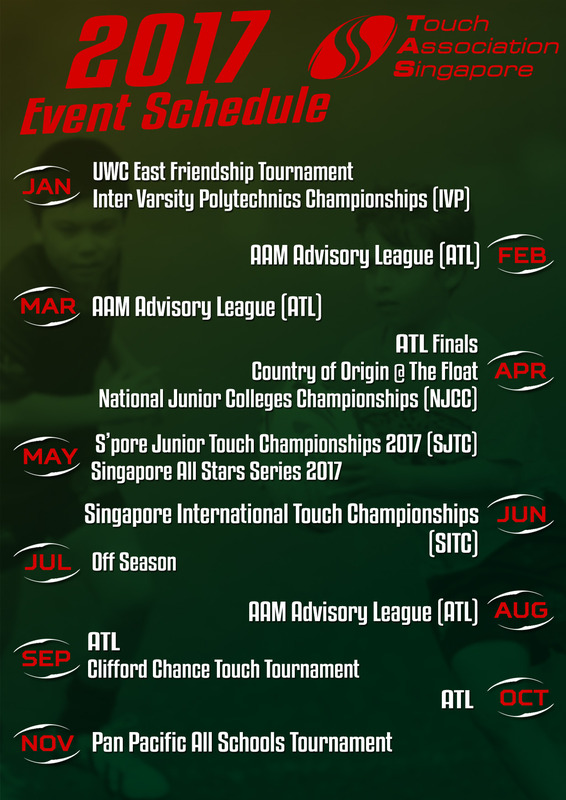 A phenomenal year of growth in Touch was acknowledged along with breakout events such as the All Star Series and the Singapore All Stars/ Daveta Exhibition Match. As stated in the Constitution, TAS produced and attached her statement of Accounts with an Executive Summary for all to see. 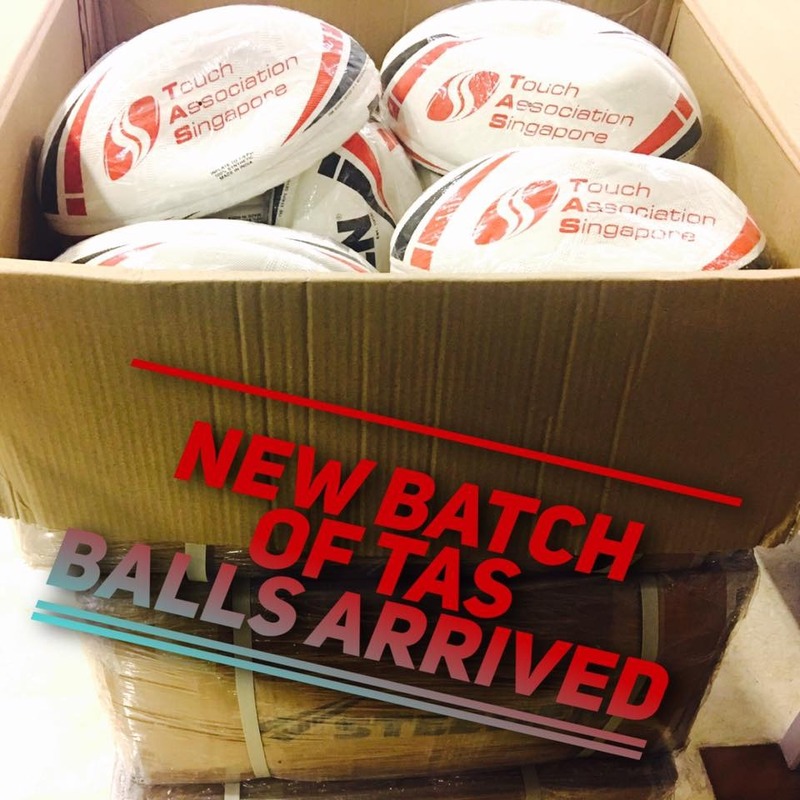 With the continued support from the Singapore Touch Community and sponsors, TAS is able to deliver Touch to all in Singapore. The AGM also involved the nominations and election of the next TAS Executive Committee. We have had two changes which we will feature in our next post. All in all, TAS 1st AGM went smoothly with everyone going home looking forward to another great year of Touch. The TAS Executive Committee would like to thank the Singapore Touch Community for the unconditional support and look forward to serving again this year. Attached are the Finances and Minutes of the AGM. As a Not For Profit Association, we are fortunate as a Touch Community in Singapore to have the support of many local businesses. League and tournament costs are kept at low affordable levels and funds invested back into development due to the generous support of our sponsors. AAM Advisory have committed again for 2017 as the headline league sponsor and we are very appreciative of the support provided by Mr. Lee Sanders - lee.sanders@aam-advisory.com. We look forward to a a great AAM Advisory League 2017. Due to the foreseeable poor weather for the rest of today, the location of the AGM tonight will be moved and held at United World College Dover, High School Staff Room. It's on the ground floor, not far from the big tent area. Please spread the word of the venue change to the rest of the Singapore Touch Community. Congratulations to IVP Champions Team Singapore Institute of Management (SIM) who won 6-4 in a fantastic final played tonight in torrential rain. Pictured are the SIM girls with their coach, Joshua Yap, Singapore Mixed Open Player. All the IVP players will now split off into the club or social teams to get ready to contest the upcoming 10 week TAS AAM Advisory League commencing Saturday 11th February. Please note the TAS AGM will be held at TRC pitches, next Tuesday 24 January 2017. 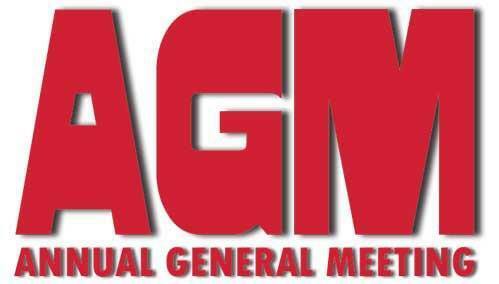 The meeting will commence at 7.30pm and will run for approximately 90 minutes. There will be FREE KEGS OF BEER from Crossroads Brewery and FREE soft drinks. - the opportunity to raise any other matters members wish to discuss. Please remember you are all members. Any club, social team, school, university or poly playing in any TAS competition has a vote so please let your voice be heard. And how good is this for expansion of touch. The mums and dads no longer sitting on the sidelines but actively getting involved. 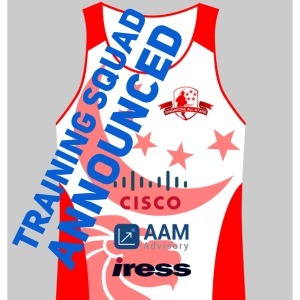 After 6 months of learning the game we look forward to welcoming the TRC MAD's team to their first ever league games in the TAS AAM Advisory League. 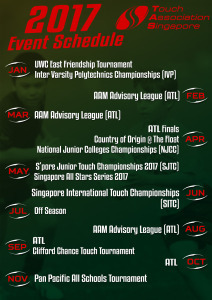 An exciting 2017 awaits the Singapore Touch Community with a full years calendar of events for juniors and open age players to participate in. Aside from age cut offs depending on the tournament, “EVERYONE” is welcome to nominate entry to any event. Touch is very much an inclusive sport and we strongly encourage participation. 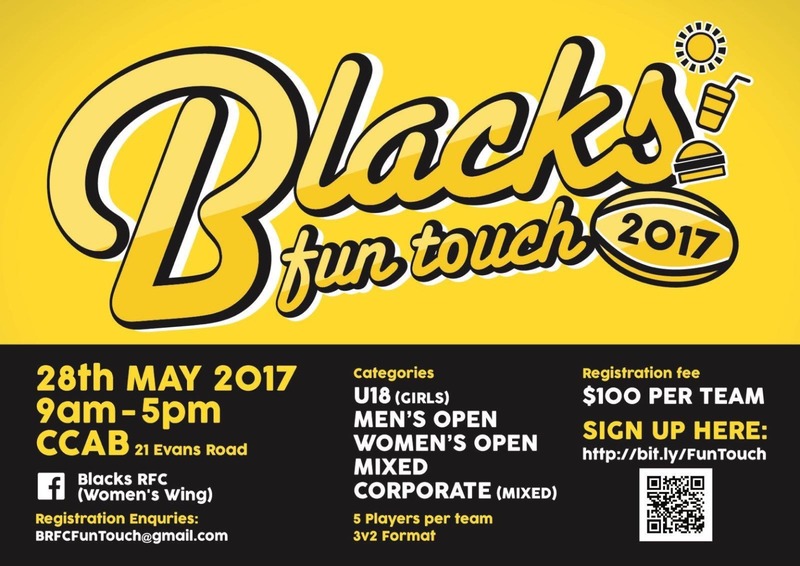 So grab your friends, let your teachers/parents know and enter teams and enjoy Touch in 2017. 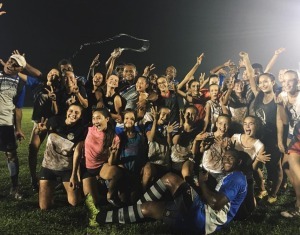 Under TAS, Touch has grown extensively in the past year and many new teams have been formed with many coaches eager to gain more knowledge about the beautiful sport we play. TAS and the Singapore Touch Community are extremely fortunate to have Chris Wall, Shane Morris & Devon Wong as members of the TAS Executive Committee. Chris and Shane coached our World Cup Open Women's Team at 2 World Cups, winning the bronze medals for both - an outstanding achievement. 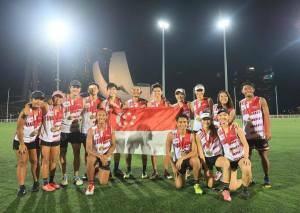 Devon coached our World Cup Mixed Team for 2015 and took them further than Singapore has ever been in the Mixed Category. The course will cover Pass and Catch, Initiating Touches, Roll Ball, Settle Patterns, Effecting Touches (Defenders), Running Backwards, Games for Understanding (games that can be played to involve actual defenders and attackers in decision making situations). These facets of play will then be looked at at the Beginners, Intermediate and Advanced Levels. You may choose to attend more than one course. There will be a nominal fee of $10 to attend EACH course. All fees will be contributed back to the DEVELOPMENT of the sport. Please fill up the google form attached if you are interested. The presenters have shared that they would like feedback on what the participants want to learn so do feel free to put it out on the form. Please note that submission of the form doesn't secure your spot. TAS will get in touch with you via email with regards to more details and payment. 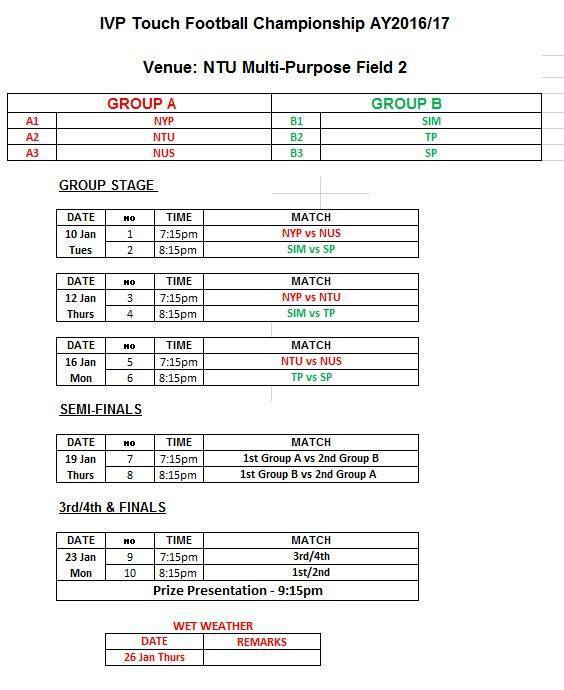 The best of Singapore's Polytechnics and Universities will face off in the annual IVP Championships starting this Tuesday 10th January, held at the NTU Sports Field. 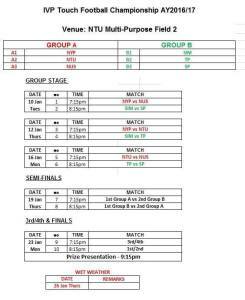 Only the top 3 teams from both POL-ITE and SUNIG games qualify to compete in what promises to be an exciting spectacle of Varsity Touch. As always, TAS will be supporting with the best referees. Please see attached picture for all timings and fixtures. Be there to show your support for your Poly/University and friends! Just 5 weeks until the TAS AAM Advisory League 2017 taps off (Saturday 11th February 2017). Over 74 teams will compete across 10 Categories including 30+ Women's teams competition in Premier League through to D Grade. Mixed Premier League and Mixed B Grade. 10 Weeks of touch ACTION. And remember you are all members. Any club, social team, school, uni or poly playing in any TAS competition has a vote so please let your voice be heard. Anyone interested in standing for the TAS exec or any issues you would like raised at the meeting. Please contact me directly. Venue and exact time will be confirmed closer to the date. Thank you to everyone for the overwhelming support for the 2017 AAM Advisory Touch League Starting Saturday February 11. 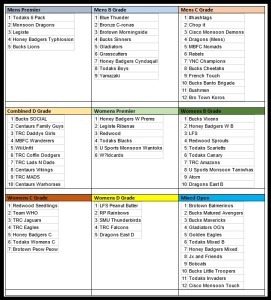 In less than 24 hours we have already exceeded capacity of 60 teams based on current available field space. GOOD NEWS THOUGH! We have just managed to secure additional time slots so there is now additional capacity. We do not want any team that wishes to play to miss out so we are still busily canvassing more options in case more teams wish to play. Continue to get your team nominations in ASAP. A huge sincere thank you to AAM Advisory for continuing their TAS League sponsorship for 2017. It’s wonderful to have the support of corporates and is validation of their belief in TAS and the community. Those of you who may not know Lee Sanders, he is a very generous supportive individual and has been a strong supporter on the touch scene for many years. 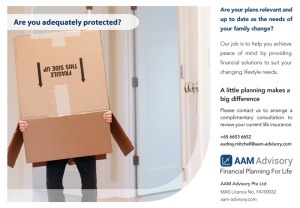 If you need any financial advice from Lee, please do contact him at lee.sanders@aam-advisory.com. The AAM Advisory League (ATL) will commence Saturday February 11th 2017 so please get your team nominations and payments in early to secure your teams entry into the league. We are hoping to get access to all fields, however should there be difficulties then there will be a requirement to cap team numbers. Nominations close 11th January and final date for payment is January 20th 2017. 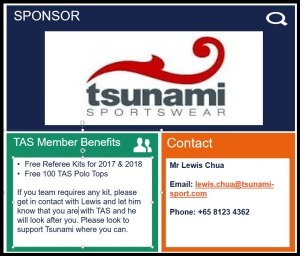 We cap of a great 2016 with the official affiliation of TAS to Singapore Rugby Union - National Sports Association. What does this OFFICIALLY mean? 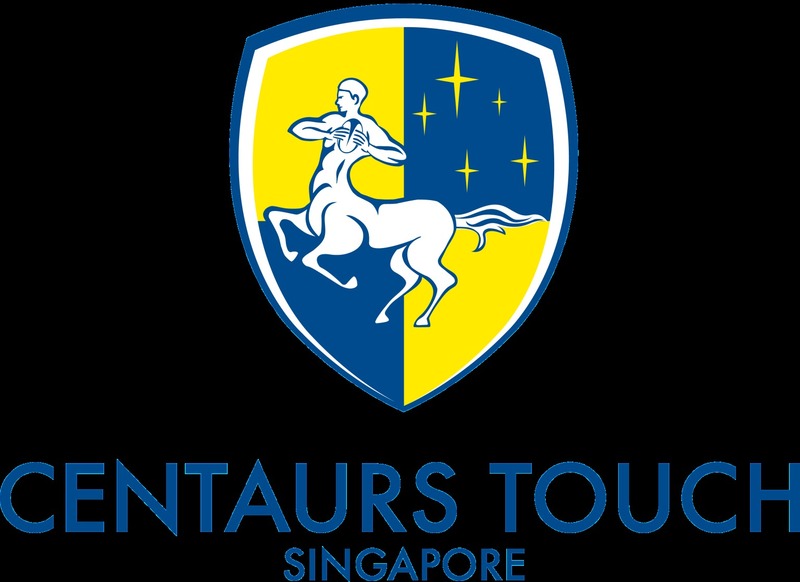 Sport Singapore is supportive of this affiliation and partnership between TAS and SRU to promote and govern the sport of Touch in Singapore. TAS remains independent, has its own Constitution (see Policies & Documents) tab. A formal partnership with SRU fostering strong synergies particularly with joint marketing efforts and access to additional government funding in order to further grow touch in Singapore. This arrangement is comparable to many other Touch/Rugbyor Rugby League Associations Globally - e.g. 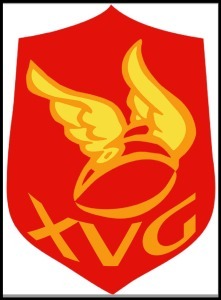 Hong Kong Touch Association and Hong Kong Rugby Union. The Singapore government, through Sport Singapore governs all National Sporting Associations in Singapore. ONLY National Sporting Associations can name the OFFICIAL National teams for all Sports. All OFFICIAL National Touch teams will be under the guidance and support of TAS. This includes government schools, government departments, Junior Colleges, Polytechnics, Universities, International Schools, Clubs (except 1 club) and all social touch teams in the league. TAS is a Not For Profit democratically elected representative of the Singapore Touch Community. Grown the sport from 50 league teams in Season 1 to 76 league teams in Season 2. The growth is due to many Polytechnic and University students that had been priced out returning together with new teams from government departments. Throughout the entire 2016 TAS was only granted one physical meeting with FIT despite multiple (documented) requests to do so. Our (documented) communications with FIT have always been with sincere willingness to work together and this this does not change as we continue to liaise with FIT to gain affiliation. 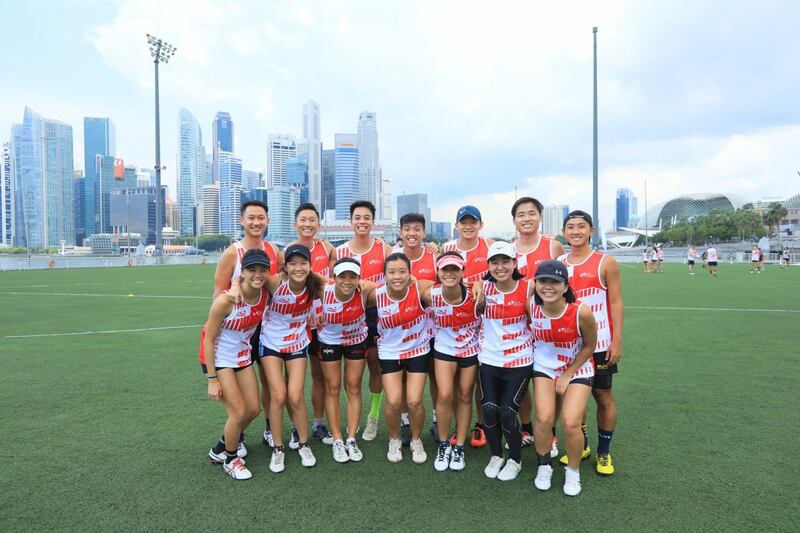 Over Ninety Eight Percent (98%) of the Singapore Touch Community have placed their confidence in TAS to be the administrative body in Singapore. We will continue to ask the question to FIT why the collective voice of the community/citizens of Singapore is not being heard. To end on a positive note, AAM Advisory League will commence again Saturday February 11 2017 with team nominations opening up shortly. 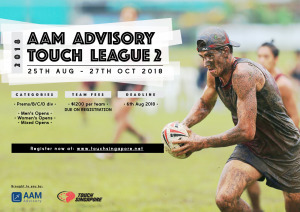 Let's make this league even bigger and better and from a FIT affiliation perspective that common sense will eventually prevail so that all nations within Asia and globally can enjoy Touch as it should be. 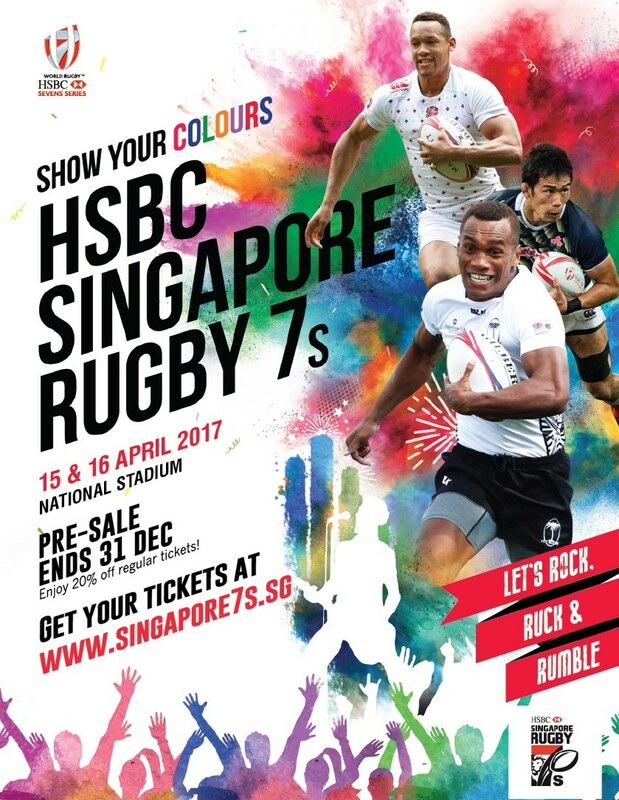 If you are planning to head out to the HSBC Singapore Rugby 7’s please get your tickets early and enjoy the additional discount provided using the TAS promo code below. “SG7STAS” which gives you 15% discount off pre-sale ticket prices, booking fees apply. Do note that this promo code will only be valid till 31 Dec.
Just like the coach pictured, everyone at Touch Association Singapore thoroughly enjoyed staging the SAS Invitational 2016 on the weekend and we hope that all 62 teams also enjoyed it just as we did. As with every tournament, we learn new things and hopefully with the learnings and feedback that we will be able to deliver an even better experience in 2017. 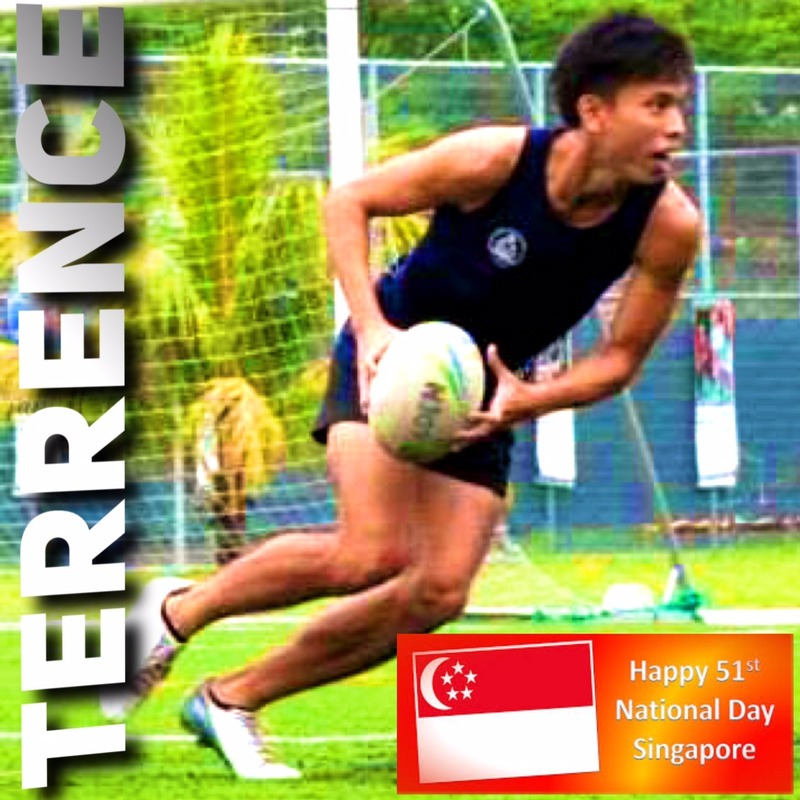 We would like to thank Terence Toh for all his dedication and effort with the tournament. 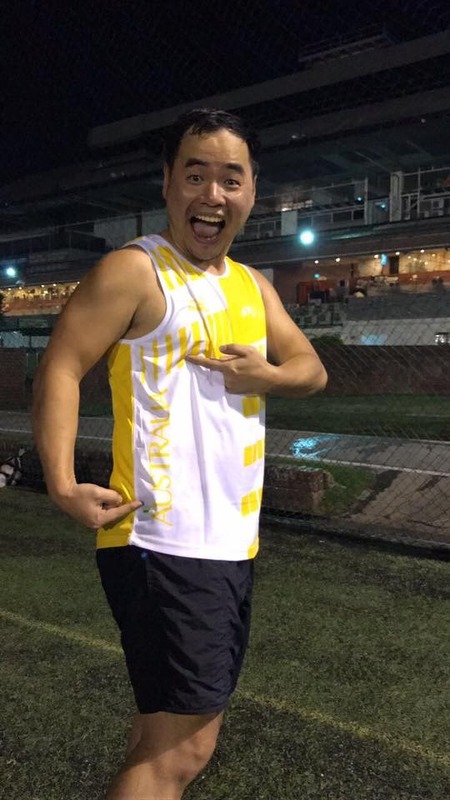 He is patient, thoughtful and genuinely a wonderful human being and we are glad to have him as an integral part of Touch Association Singapore. The support we received from all the referees was again phenomenal ensuring that all the games were officiated with two referees and to the best of our ability the games running on time. 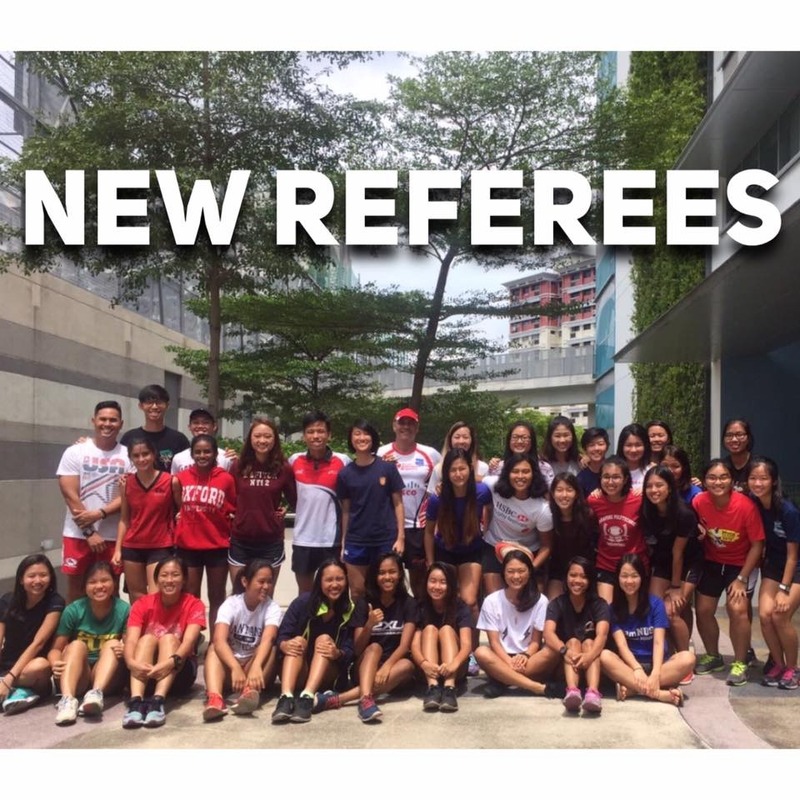 It was a great opportunity for all our new referees to kick start their introduction into real games and serves as great platform for them to continue their involvement with Touch. Of course, we must thank Singapore American School and in particular Mimi for their genuine hospitality. When everyone in the community works together with a common objective, nothing is ever too difficult. We are all dedicated volunteers and put in countless hours for the love of the sport enabling the children and youth these wonderful opportunities to play sport, meet a bunch of new friends and pick up new life experiences. Once again, thank you and we look forward to see you all again in 2017. We have a professional photographer on both days. He does take some wonderful pictures and we will have these uploaded to the Touch Association Facebook site within 5 days following the tournament. We will randomly select representatives from teams for post-match interviews which will be uploaded on both Facebook and Instagram. The first touchdown in each match on both days except for the GRAND FINALS is worth 3 points; the second touchdown and each subsequent touchdown are worth two points. Touchdowns in GRANDFINALS are worth 1 point. This system is to avoid any drawn results during the pool rounds and semifinals. Draws in GRAND FINALS will be decided by the drop off system. 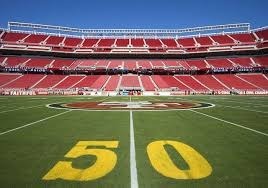 ALL teams must be at their designated pitch 5 minutes before the game is due to commence. It is an extremely tight schedule so please be on time. A point system will operate with 3 points for a win; 2 points for a draw; 1 point for a loss; and 0 points for a forfeit. This break out event should be a ripper for the participants. 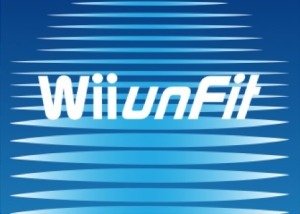 This time it will be run as a relay of four with $50 to each winning age group. You will need to run with a touch ball and pass the ball to your relay team mates. 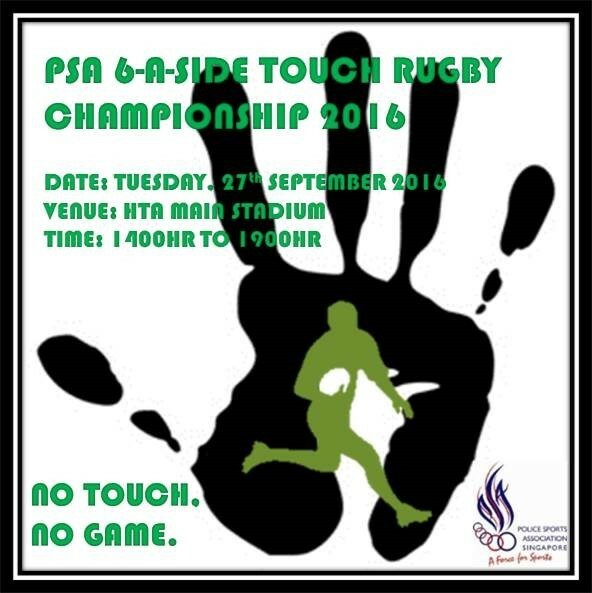 Please advise security that you are there for The Touch Tournament and the Team Name you are representing. The campus will be very busy on both days with three events taking place so I would recommend getting there with plenty of time spare. It’s a packed agenda so we want to be running like clockwork to get through it all. There is an underground parking lot at the end of Building E. You can also park in the driveway in front of C, D and E. There is also coupon parking next to the HDB's and across the street from the main entrance. People will not be allowed to park in the fire lane right next to the stadium and north fields. The air-conditioned café will be open from 8:00am until 5:00pm Saturday and 7:30am to 12:30pm Sunday. There will be plenty of food and drinks for sale in the café and also an opportunity for people to get a break from the heat. There will be water coolers with iced water throughout the day. In addition there will be tents set up on the fields to provide shade whilst out on the playing fields. We will be making use of the PA system so please listen out for all announcements. TAS has arranged for medics to be on hand. 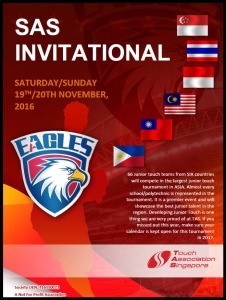 We are very proud at being able to put this tournament at zero cost to the participants including provision of all the referees and hope that it will be a great event leading to further development of junior touch not only in Singapore but the region. A huge thank you to Mimi and the Singapore American School for providing access to their facilities. 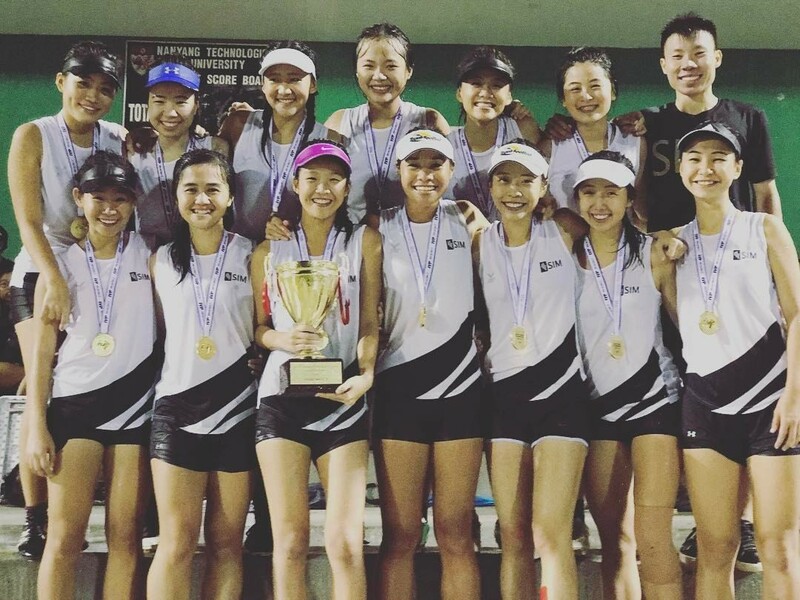 Touch POL-ITE 2016 concluded last week with Nanyang Polytechnic (pictured) emerging as Champions after a hard fought 3-2 win over Temasek Polytechnic in the Final watched by many. Singapore Polytechnic finished 3rd followed by Ngee Ann Polytechnic, Republic Polytechnic & the Institute of Education in one of the most competitive POL-ITEs in years. 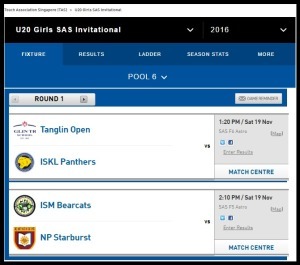 These local teams will now turn their attention to the SAS Invitational this weekend, where they will have the opportunity to play many different international schools in Asia. It will be a truly interesting clash of styles and fantastic exposure for all teams in our 62 Team tournament this weekend. We are just about complete with the draw and will be in a position to provide that to everyone early next week. It is a very busy tournament with 66 teams confirmed to compete from six countries. Over 90% of teams are school based teams so this will lead in well for next year when this tournament will be designated as the Pan Asia All Schools Premier Tournament. The U20 Girls division is a huge one with 24 teams competing and very pleasing to see the U20 Boys division increase to 10 teams from only a handful at the start of 2016. What is even more pleasing is the number of boys teams now participating at the U10, U12 and U14 age groups. 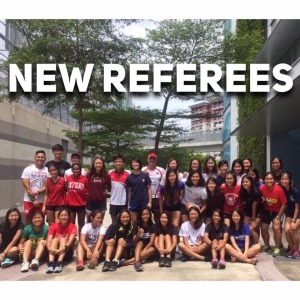 30+ new referees will join the 120+ referees already refereeing. 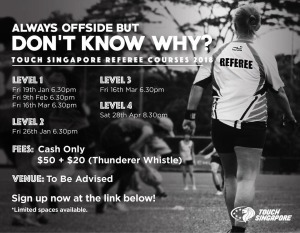 TAS provides these courses FREE of charge including a thunderer whistle for each new referee. 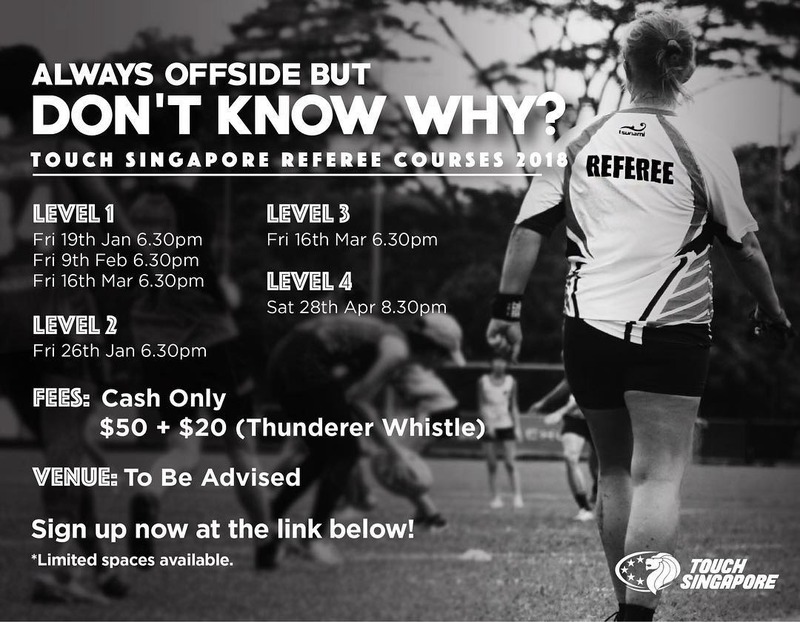 With TAS looking after so many participants of touch in Singapore, we need to ensure that referees continue to be added and developed. Special thanks to Chris Mead for giving up his Sunday to conduct the course and UWC East for providing the facilities for the course. This is what collaborating as a community is all about. In collaboration with our great supporters http://sg.kuckrejas.com/ we will provide all 70 teams participating in the TAS AAM Advisory League a TAS branded Steeden match ball FREE of charge. It's important to emphasise that everything we do at TAS is for the benefit of our members which is the core ethos of being a Not For Profit Association. “Tanglin Rugby Club (TRC) have hosted Daveta Rugby Fiji for the last 9 days and TRC also are the host of all the TAS AAM Advisory league matches with their excellent all grass pitches. 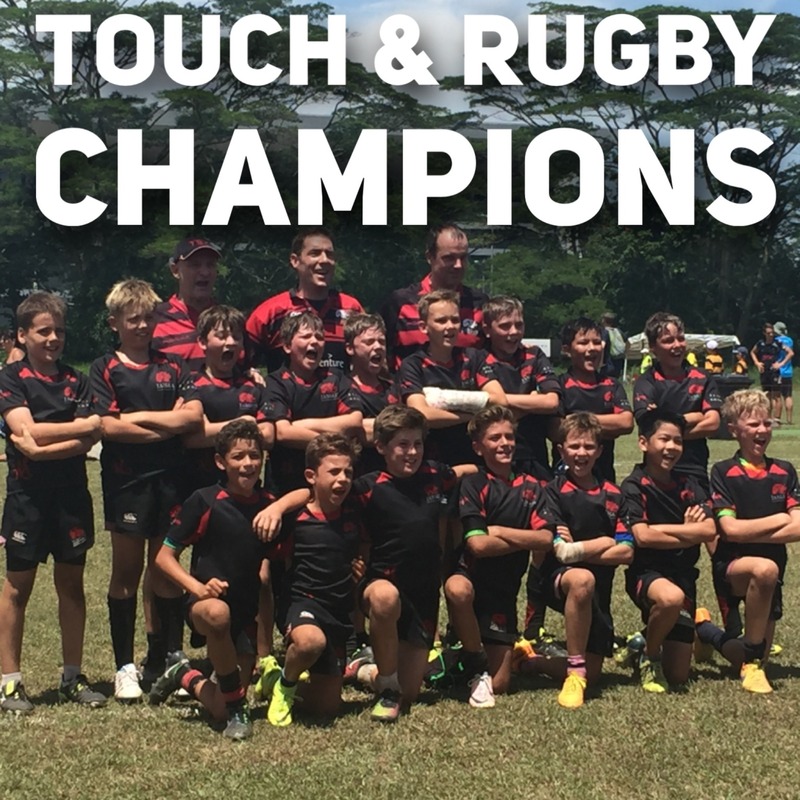 TRC and Daveta put on 4 coaching clinics for all children in Singapore , both Contact and Touch which everyone enjoyed and also hosted the highly entertaining Touch match against our own TAS Singapore All Stars. 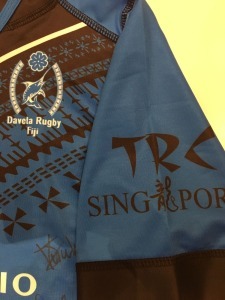 There are still some Daveta Adult and Children supporters jerseys available for sale if you are interested. These can be purchased Sunday morning from 8:30am at TRC Stadium. 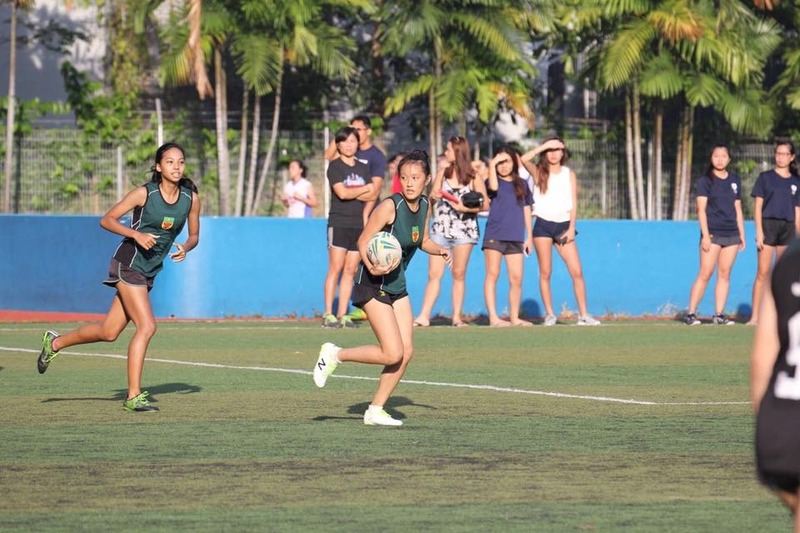 The annual POL-ITE Touch Championships tapped off this week. 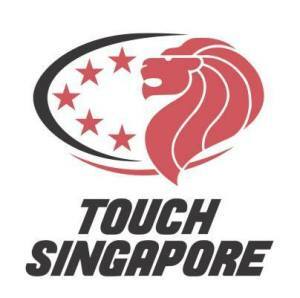 This is a great league that fosters the development and growth of Touch in Singapore and proudly supported by TAS. 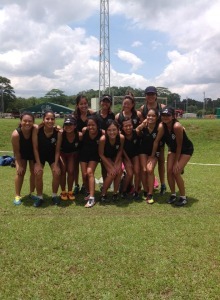 Thank You Daveta Rugby Fiji for a great week with us Singapore. Your welcoming nature has been admired by all. 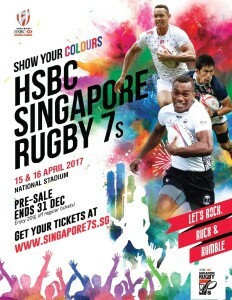 On behalf of Tanglin Rugby and Touch, Singapore Rugby and Touch Association Singapore, Good Luck with your participation in the SCC Rugby Sevens tournament this coming weekend. We will be out in force to support you. Great performanceand sportsmanship shown by the Singapore All Stars. These young men will have lifelong memories and stories to tell their children in the furture. 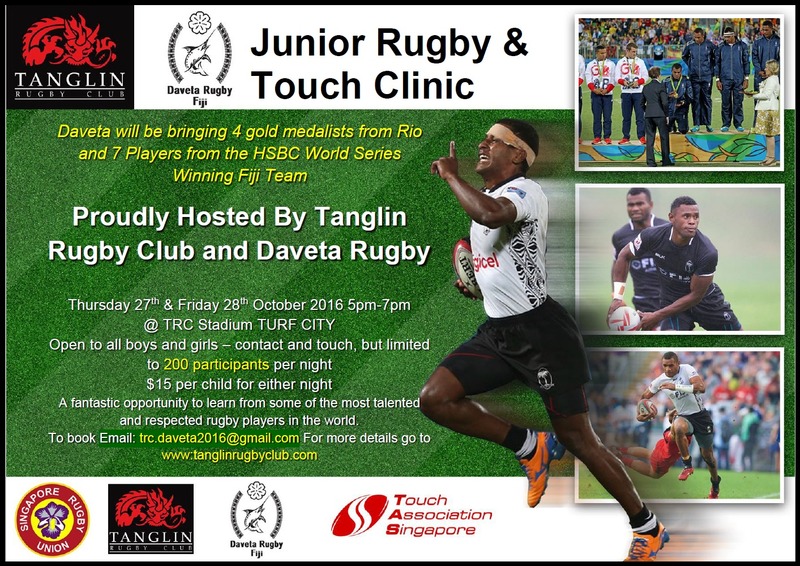 Thankyou to Daveta Rugby Fiji, Tanglin Rugby, Singapore Rugby and Touch Association Singapore for all working together to provide this wonderful opportunity. 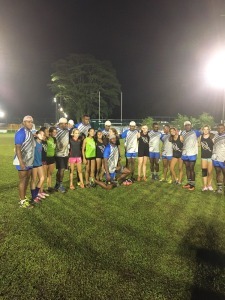 Speaking to many of the All Stars, they still can't believe that they had just played a game of Touch against Olympic Gold Medalist and the best sevens rugby players on the PLANET. 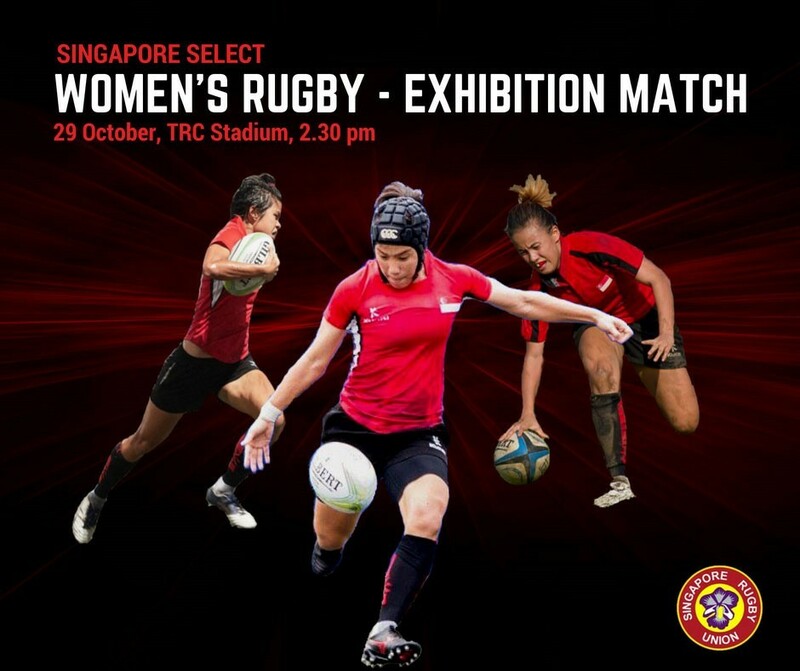 As a curtain raiser to the TAS Singapore AllStars Vs Daveta Rugby Fiji Touch match, the best women's sevens players in Singapore will be showcasing women's sevens rugby. Many of these women play in our TAS Touch league from teams such as the RAVENS, PHAT KIDS and DUCK KNIGHTS. A great example of Singapore Rugby Union and Touch Association Singapore working in unison to promote cross code participation. 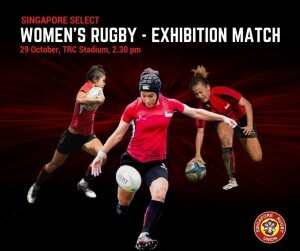 Come down to Turf City TRC Stadium this Saturday the 29th at 2:30pm to watch two great games. Daveta Rugby Fiji are now in town and immediately out and about sharing their knowledge and warmth to the children of Singapore. 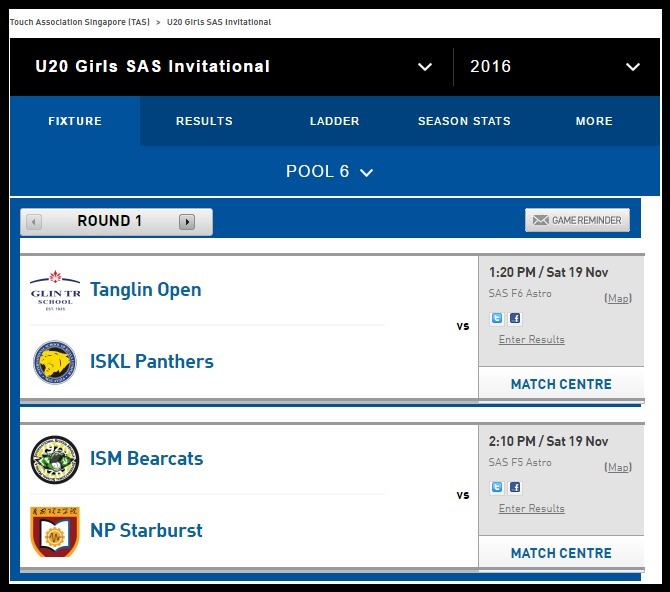 What a great opportunity for the Tanglin U14 girls to play a friendly match against the Fijian Olympic Gold Medalists. It's opportunities like this that all of us at TAS will continue to bring to the benefit of all the children involved in sport in Singapore. As parents, nothing is more rewarding than seeing a smile on a child's face. 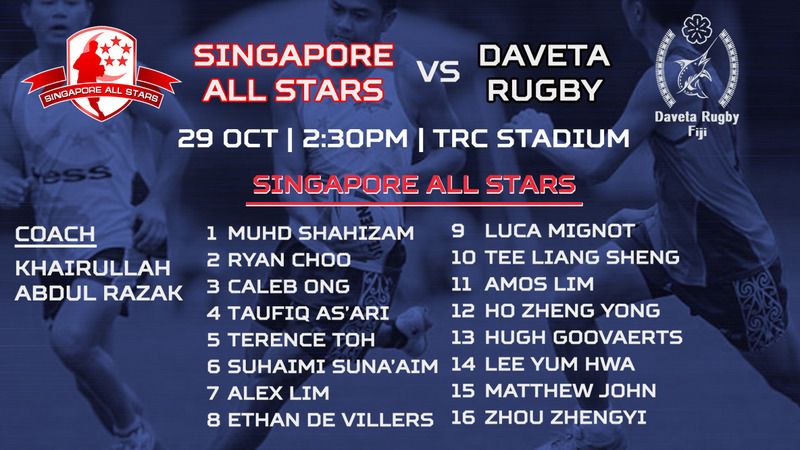 The Daveta team will play an exhibition Touch match against the Singapore Men's All Stars Team this Saturday 29th October at 2:30pm TRC Stadium Turf City. Come down and watch these supreme athletes in action. Singapore All Stars all set to take on the might of Daveta Rugby FIJI in an exhibition Touch match. Get down to Tanglin Stadium Turf City Saturday 29th with tap off at 2:30pm. 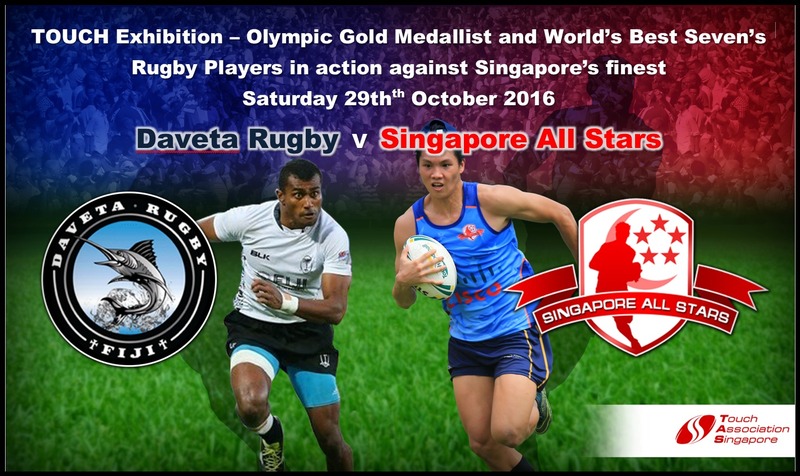 What an opportunity for the team to play against some of the best rugby sevens and Olympic Gold Medalists. Two of the youngest guns in the team Ethan Devilliers and Luca Mignot will have an opportunity of a life time to face off against their idols. The game will be STREAMED LIVE ON TAS FACEBOOK. 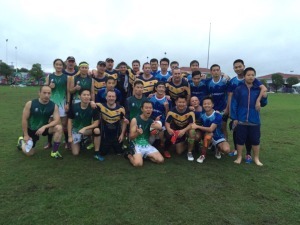 THANK YOU - SHANGHAI Touch Association. Not enough praise can be said about this team of volunteer organisers. Despite all the hurdles and road blocks placed in front of them leading up to the tournament, they still managed to put on as ALWAYS the best run tournament in Asia. 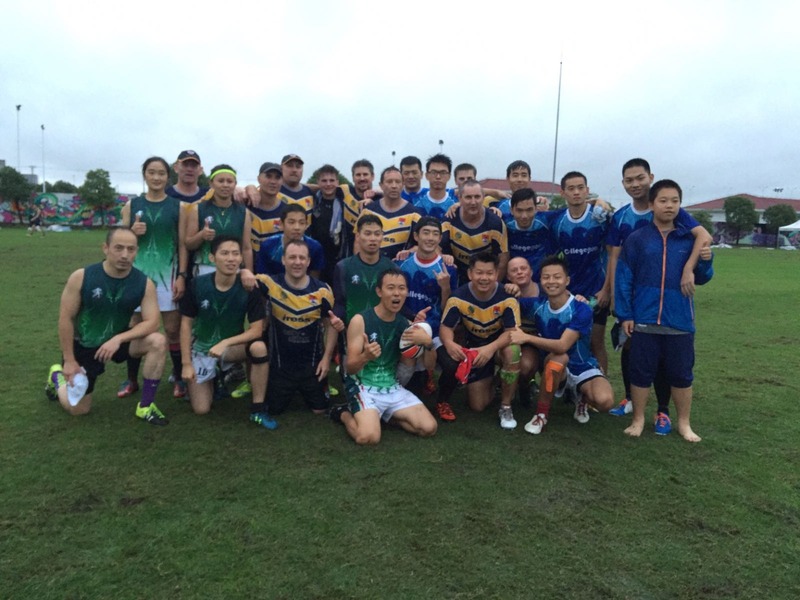 Over 50 teams from all over Asia and New Zealand including four teams from Singapore made their way up to Shanghai and to see the unified approach of all the participants despite the hurdles was very pleasing for the development of touch. Thank you to all the referees that came up and we enjoyed being refereed by you. The New Zealand contingent of players and referees were wonderful and the Haka performance was truly memorable. For 2017, we will keep the SITT weekend TAS League free so that many more teams from Singapore will have the opportunity to come up and experience the Shanghai Tournament. Once again a very big SINCERE thank you and from all of us in Singapore we look forward to 2017. Entries are now closed. 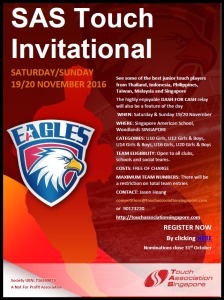 70 Junior Teams from all over Asia will descend into Singapore November 19 & 20 to compete in this years SAS Invitational. By the numbers that's over 1200 Juniors and nearly every touch playing school represented. 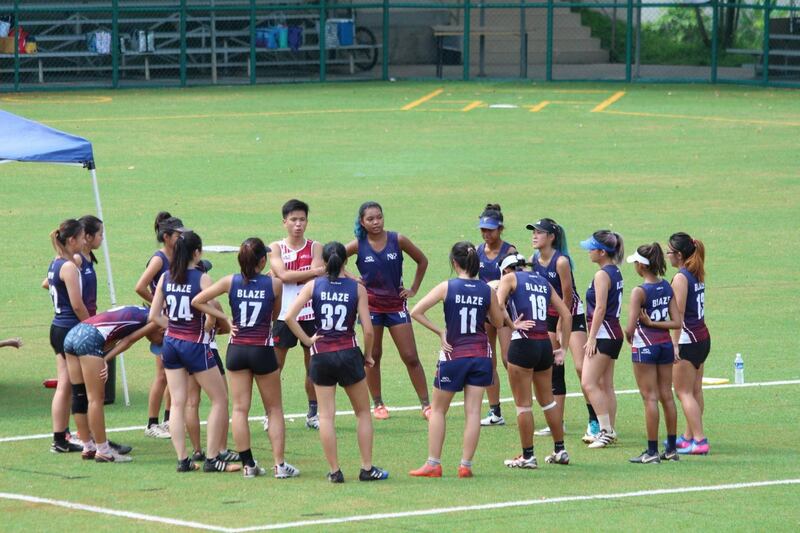 At TAS we have worked tirelessly to try and garner greater media exposure for the sport of Touch in Singapore. 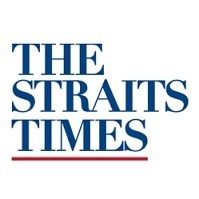 Through the great support of Tanglin Rugby Club, Daveta Rugby and some wonderful individuals (you know who you are) we have managed for the first time in Singapore history to have Touch mentioned in the National Publication "Straits Times". 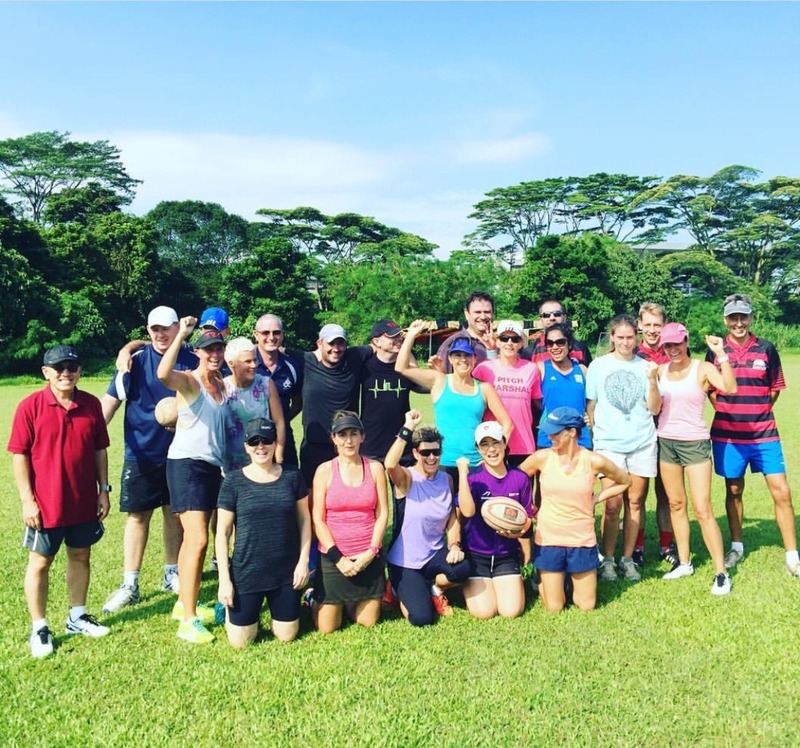 To clarify, Tanglin Rugby Club "organised the rugby coaching clinics". We hope to foster a healthy relationship with the Straits Times and continue the positive coverage. Thank you Straits Times for taking this initial step. Here is a link to the article that was also in print form from Saturday 8th October. 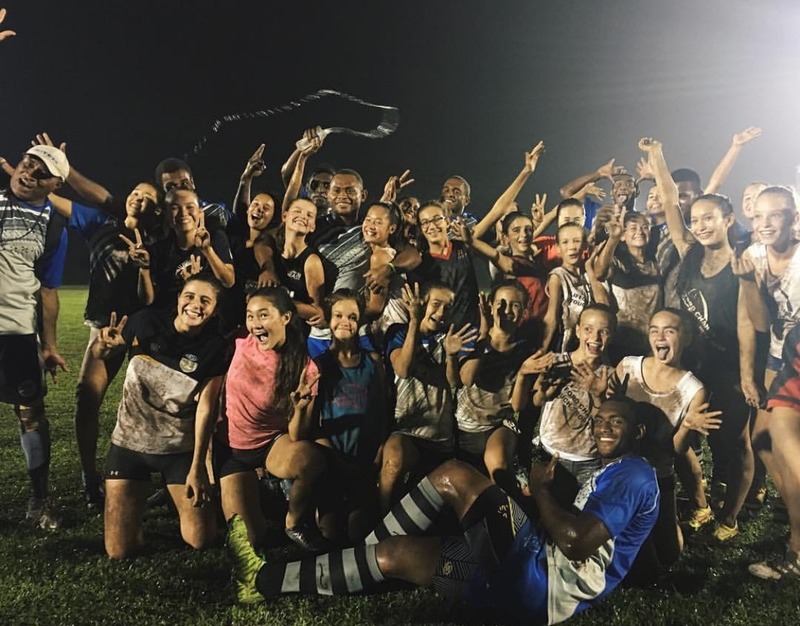 An awesome opportunity presents itself to be trained by the BEST Sevens players in the WORLD. Ensuring that no family is priced out, the cost to attend is only $15. However, please note capacity is limited to 200 participants each night. Please book early to secure your spot. Given the unprecedented growth of Touch in Singapore, it is timely to ensure the broader Touch community of the transparency of TAS which is clearly articulated in the Strategic Three Year Growth Plan. This plan outlines the background on the formation of TAS and also the vision of the committee over the next three years. We are all volunteers at TAS and the beneficiaries of TAS are the participants. 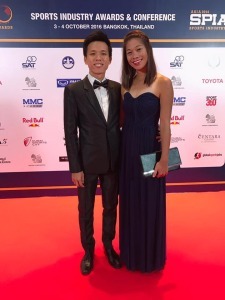 Terence Toh and Beatrice Chua representing TAS at the Sports Industry Awards Asia. We didn't manage to get the thumbs up this year but nevertheless a huge effort to be nominated and short listed. Credit to everyone involved with TAS. 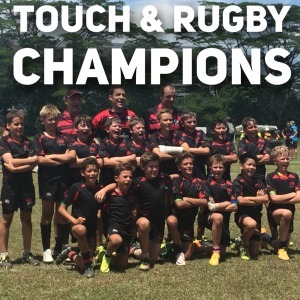 Proving that Touch & Rugby are complementary sports the U11 TRC boys last week won the Clifford Chance U12 Touch Tourney and Yesterday the boys won the TRC Cup U11 Cup Final. Well done boys and a great advertisement in boosting Touch Football particpation amongst the boys. Thank you to all the players that attended the Singapore All Stars trials last week. The standard was of very high quality and congratulations to the following 21 players who have been shortlisted for the training squad. The Final team of 14 plus two shadows will be announced 6th October. 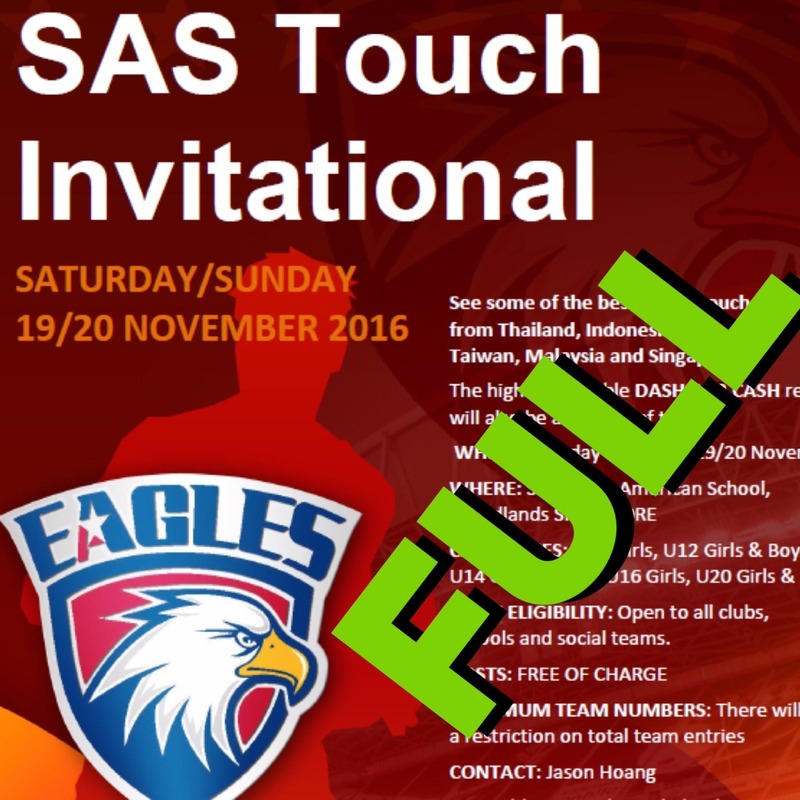 The SAS Invitational 2016 will bring together Juniors from across the region to participate in what will be another exciting tournament for the junior touch participants. We already have teams confirmed from Thailand, Philippines, Indonesia, Taiwan which will provide for further diversification of opponents and new friendships to be made. The fun and exciting DASH for CASH will be a highlight with a slight variation this time round as we introduce a relay style. The attached flyer provides the basic details with specific details of the tournament proceedings to be sent through as we draw nearer to the date. Teams entrants will be restricted so I would encourage nominations early to avoid disappointment. 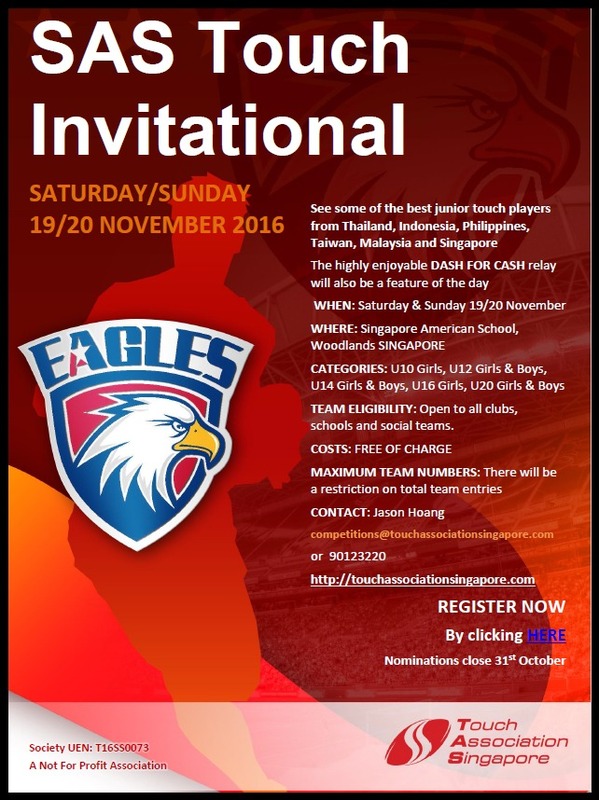 With the support of the Singapore American School and TAS, the SAS invitational will be provided FREE of charge to all teams. At this early planning stage it is envisaged that for U10 Girls, U12 Girls plus all boysU10, U12 and U14 games and finals will be concluded on the Saturday. All other age groups will play pool games on Saturday and will return on Sunday for finals. This plan is to negate the potential weather disruptions that could be expected during that time of year. Any questions, please get in touch with me. Please click on this link to nominate. Today the Singapore Police Sports Association will be hosting an internal police divisional Touch Tournament proudly supported by TAS. Fantastic to see the adoption of Touch by the civil servants and we now have many of the civil servants playing regularly within the AAM Advisory League. 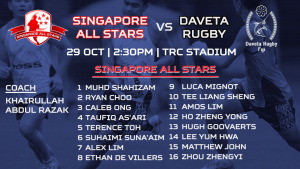 Following the news of the Daveta Rugby V Singapore All Stars game and the short time frame to get everything organized, this triggered a chain of events which included a number of matches that were required to be moved around in order to accommodate timing where we could accommodate the majority of the initial batch of players that could trial. For clarity, and with respect to timing and field space we approached all the representatives of the Men’s Premier League teams to garner interest and a total of 38 players expressed interest. It has not been the smoothest process but the best that we could manage given the relatively small window to get this all done and take advantage of such a great opportunity. Thank you for everyone’s cooperation and look forward to seeing people out and about either tonight at the CCTT Corporate Tournament, AAM Advisory League tomorrow or Sunday at the CCTT Junior Tourney. A HUGE weekend of Touch indeed. The corporate Singapore Touch community is looking forward to the annual Clifford Chance Touch Trophy tournament on Friday 23 September at TRC Stadium, Turf City. 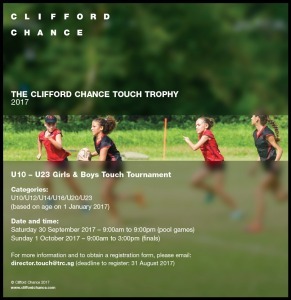 Clifford Chance, the seventh largest legal firm in the world, is a long term supporter of Touch in Singapore and is once again generously sponsoring this popular annual event. The ten corporate teams entering will be donating $500 each to raise a total of $5,000 which will go to the Rainbow Centre, Singapore. The Rainbow Centre, Singapore is a voluntary welfare organization that serves children and youths with a diverse range of special developmental and learning needs. Rainbow Centre, Singapore is a voluntary welfare organization that serves children and youths with a diverse range of special developmental and learning needs, including autism spectrum disorder (ASD) and multiple disabilities, which may involve a combination of intellectual, physical, visual and/or hearing impairments. Founded in 1992, the Centre currently runs two Special Education (SPED) schools for students aged 7-18 years old and two Early Intervention Programme (EIP) centres for children 2 months to 6 years old, at two campuses - Margaret Drive and Yishun Park. Rainbow Centre also trains special education teachers and caregivers, and provides consultancy for others working with children with special needs through Rainbow Centre Training & Consultancy. Rainbow Centre is a registered charity with the Registry of Societies and an Institution of a Public Character under the Charities Act. Rainbow Centre, Singapore is raising funds for an extension wing at its current Margaret Drive campus. The new purpose-built facility will serve 350 children aged 6 years and below in the Early Intervention Programme and an additional 130 students aged 7-18 years in the Special Education Programme. The new wing will also house the Rainbow Centre Head Office, its Training and Consultancy unit and a new Special Student Care Centre for 50 students. The building project is estimated to cost $21.5million. Rainbow Centre’s share of the cost is estimated at $6.5million after co-funding from the Ministry of Education and Ministry of Social and Family Development. THANK YOU DAVETA Rugby - It just doesn't get any better! 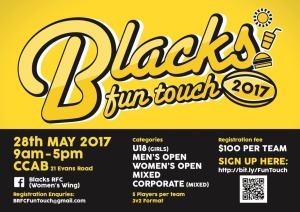 Through our wide network, TAS has arranged for a TOUCH exhibition game against Olympic Gold Medallist and Worlds best seven's players. 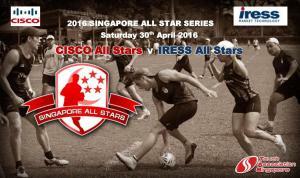 What an experience and honour it will be for our Singapore All Stars men to have such a wonderful opportunity. The Singapore Touch community is super excited and cant wait to see the supremely talented, gifted Fijian athletes in action. 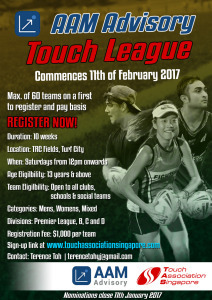 It's great to see the sport of Touch spread throughout Singapore and at TAS our role is to facilitate this growth as much as possible. A total of 8 divisions participated in the competition. Each division comprisesd of mens and ladies who are firefighters, paramedics and NSFs who share the same passion of playing touch. SPIA, a global leader in sports conferences and awards, named TAS among the finalists for its 2016 BEST MASS PARTICIPATION EVENT OF THE YEAR. The winner will be announced at SPIA's conference in Bangkok on 4 Oct.
As a unified association we continue to deliver material measurable progress and on this note I’m very pleased to announce that today we have secured AAM Advisory as the TITLE SPONSOR for our league for the remainder of 2016 and will now be known as AAM Advisory League. This continues the trend of corporations believing in our ethos and partnering with TAS to continue to drive our collective objectives. AAM Advisory offers a complete financial planning service for expatriates, Permanent Residents and Singaporeans focused around wealth creation and preservation strategies. The company has a team of fully experienced financial representatives backed by a wealth of research, knowledge and expertise. Lee Sanders plays in multiple teams with TAS and understands what we are all about and a very valued supporter. Lee currently looks after a number of us so if you need some financial guidance/advice please do get in touch with Lee. We breathed a sigh of relief having gotten through round 1 successfully. True to the community spirit fostered within TAS, referees stood up when it counted and we managed to fulfill every fixture with two referees (with 76 teams it is quite a task each weekend). Speaking to a number of teams old and new on Saturday, everyone was just happy to be out and about playing competition touch again. Pictured below is what pretty much sums up what we are all about – providing a unified inclusive platform so touch can be played with mates, fathers, sons, daughters and a few laughs shared afterwards with a cleansing ale. Pictures of round 1 will be gradually uploaded onto our Facebook Site during the week. 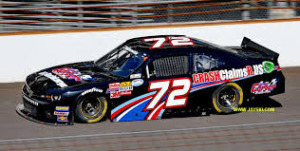 There are some awesome action shots so check them out and show the grandkids you still have it. Round 1 results are alredy updated updated under the fixtures and results tab. There is a slight change to the schedule due to the unavailability of the grounds. Below is our final schedule for the league. Games will start at 12:50 pm. Should the hourly psi reading creep over 100 whilst we are playing, opposing captains will decide to continue or not with their games. If the hourly psi reading exceeds 150 whilst we are out there all games will then be postponed. The long wait is over and round one gets underway Saturday. It’s going to be an exciting Saturday particularly for all the new teams. 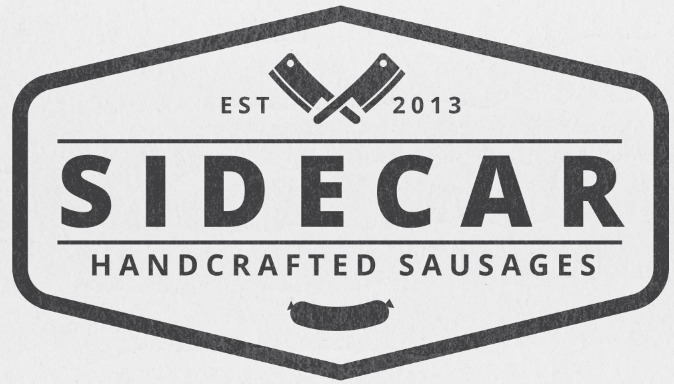 With the support of our Partners SideCar (Delicious Handcrafted Gourmet Sausages) TAS will be putting on a BBQ and 100 Pluses FREE of charge. As with Grand Final day – once you start smelling those Tom Yum Sausages from the BBQ, get over quickly and grab one before the Bro Town boys take them all! Plenty of 100 Pluses in the large ORANGE eskies so help yourselves. For the interest of Touch participants within TAS and the broader Touch community, the Strategic Three Year Growth Plan outlines the background on the formation of TAS and also the vision of the committee over the next three years. Fast forward eight months since inception, we have achieved over 90% of the goals that we set ourselves and will continue to collaborate as a community to deliver on the stated objectives. 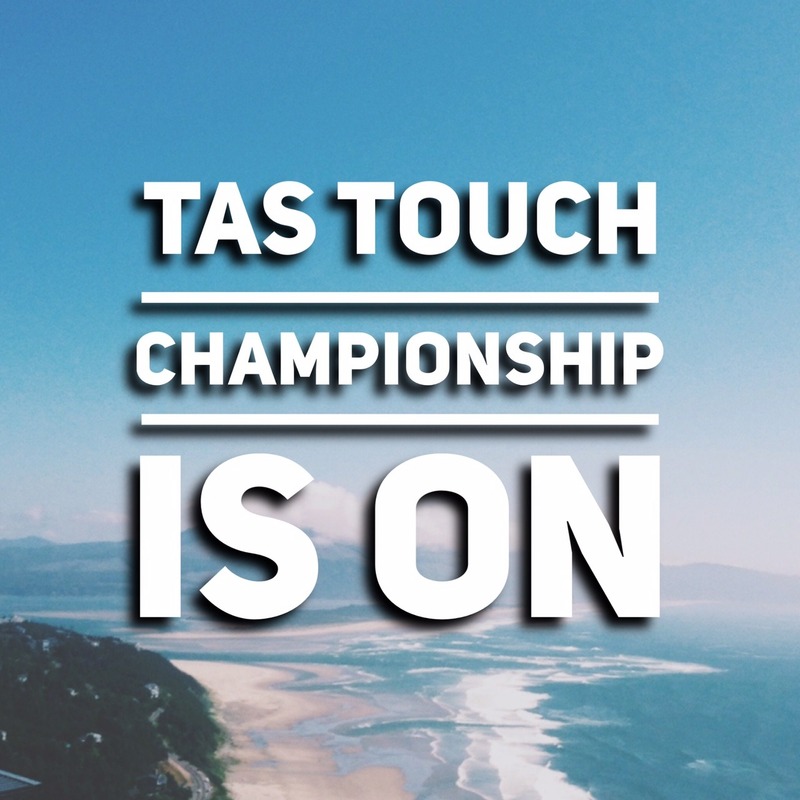 Look forward to seeing everyone out and about next Saturday for the commencement of the TAS Touch Champioships whereby 76 teams will start their campaign to be one of nine divisional champions. Keeping with the INSPIRATIONAL theme, back in 2008 and then as a 12 year old, Joseph Schooling met one of his heroes that had inspired him when he visited Singapore - Michael Phelps. As we all know now, Joseph beat Michael by 0.75 seconds and has the Olympic record and of course the GOLD Medal. Great example of following your dreams and never giving up no matter the challenges. TAS salutes Joseph Schooling on his historic achievement in Rio and Singapore's first Gold Medal at the 2016 Olympics! Hard work and perseverance all paying off on the big day - what a great way to start Singapore's 51st Year! Two weeks until tap off - We hope you have a all been training like Joseph and remember from the 76 teams there can be only 9 Division Champions ! One of our key objectives was to facilitate the growth of Touch at the grassroots level and get more people interested in playing the game. By providing transparent access for groups such as the Singapore Civil Defence Force to coordinate inter-unit competitions, it nurtures the game where it is needed most. 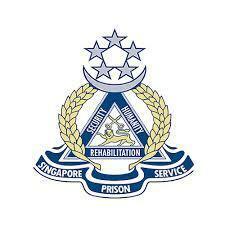 TAS will assist the Singapore Civil Defence Force with provision of referees. 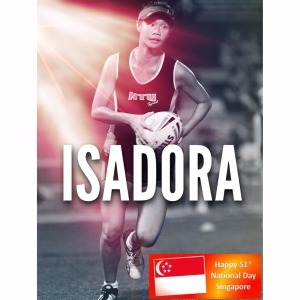 Some of the SCDF players will be part of teams along with the Singapore Prison Services team that will also participate in the upcoming TAS Touch Championships. Truly great to see all parts of the community get involved. Keep up the great work NAZ and team. 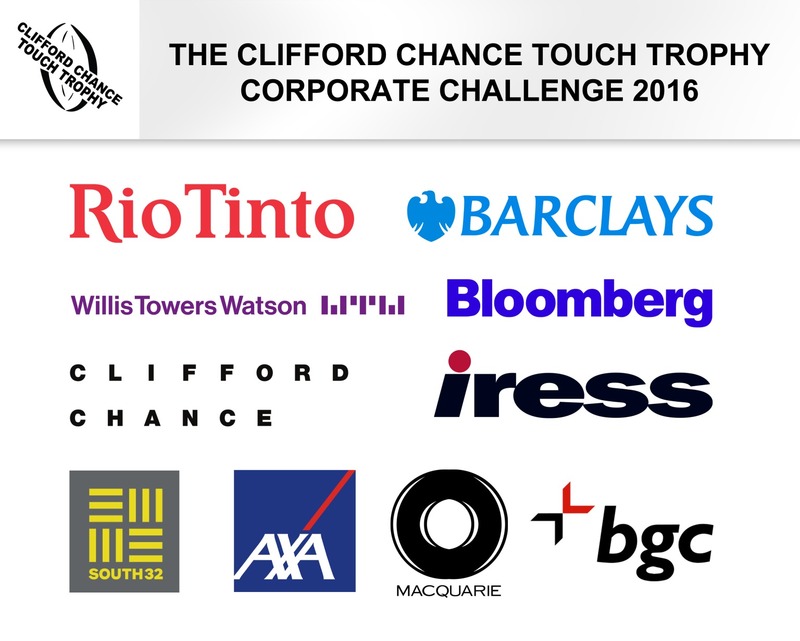 The Clifford Chance Touch Trophy 2016 is back on again September 25th. The tournament is FREE for all children thanks to Clifford Chance, the 7th Largest Law Firm in the World. All clubs, schools, social teams,in fact any one can nominate and register a team as getting children out and active building long lasting friendships is a key building block for children. Over 1000 children will be participating so get your nominations in asap. TAS would like to take this opportunity to sincerely thank Clifford Chance who have financially supported the growth of Touch for all children for many years in Singapore. 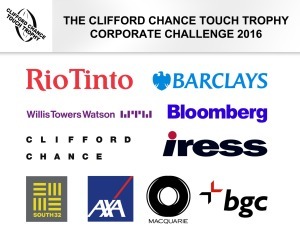 The 10th annual Clifford Chance Touch Trophy competition will be held once again this September! Join us for a great day of Touch or simply come and support the teams over a BBQ and drinks. The Touch Association of Singapore (TAS) are pleased to announce their partnership with Singapore Airlines , one of Asia's most iconic brands. Singapore Airlines is known and respected for the high quality of their service the world over. TAS sincerely thanks Singapore Airlines for their support and we look forward to growing Touch in Singapore together for all Singaporeans, residents and visitors with one of Singapore's most admired and greatest institutions . TAS warmly wishes a happy 51st National Day to all and look forward to an exciting second season tapping off on Saturday 27th August with a record 1400 players in 76 teams participating in 9 divisions. What it means to be Singaporean? Many things. We were once a small colony, now evolved into a buzzing cosmopolitan country. The path was not easy with our forefathers toiling to pave the way for the quality of life we enjoy now. Singaporeans are unique and special with the diverse cultures and languages not being a barrier to co-exist. Singapore has many things to be proud of and I am happy to be part of it. 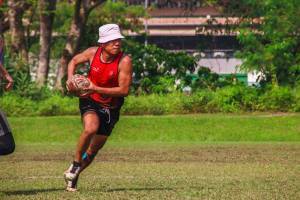 What it means to play touch for Singapore? It's always an honour to represent your country. To know that you are representing your people, you have to give your all on the field! With TAS serving the Singapore Touch Community now, I am confident that we will continue to have Singapore's best players representing the nation. 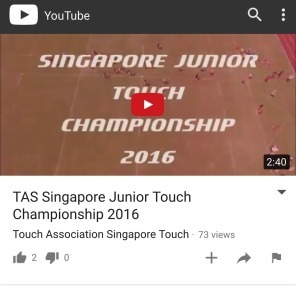 Very proud of the Singapore Touch Community this year for taking the step to support TAS. Touch has grown faster this year than ever before - it's wonderful to see so many people being able to play again. Remember to always give back to the sport you love! Looking forward to seeing everyone on the field in the upcoming season! Happy National Day all! Corporate sponsorship is a key element in the success of any administration, particularly Not For Profit Associations such as TAS. Many corporates highlight community and corporate social responsibility as one of the key reasons in supporting but just as important is building newer and deeper community networks. Every cent and benefit in kind that TAS receives all goes towards providing a stable platform for the continued growth of touch for the Singapore community and importantly to the people that need it most which is grassroots. Thank You to Tsunami for the partnership with TAS and trust that we will assist Tsunami with further brand differentiation and strengthening amongst our network and of course the benefit to TAS over the next few years and beyond. Being Singaporean means I get to eat all the great food from many various cuisines without having to travel. Food aside, it also means being a part of a small country that went from nothing to something, which is also what makes me proud to call Singapore my home. Donning a Singapore jersey is an honour as we get to represent our local Touch community at international tournaments. At these platforms, we also get to meet with and play against other players from around the world and are exposed to higher skilled and faster paced games. Happy birthday Singapore! 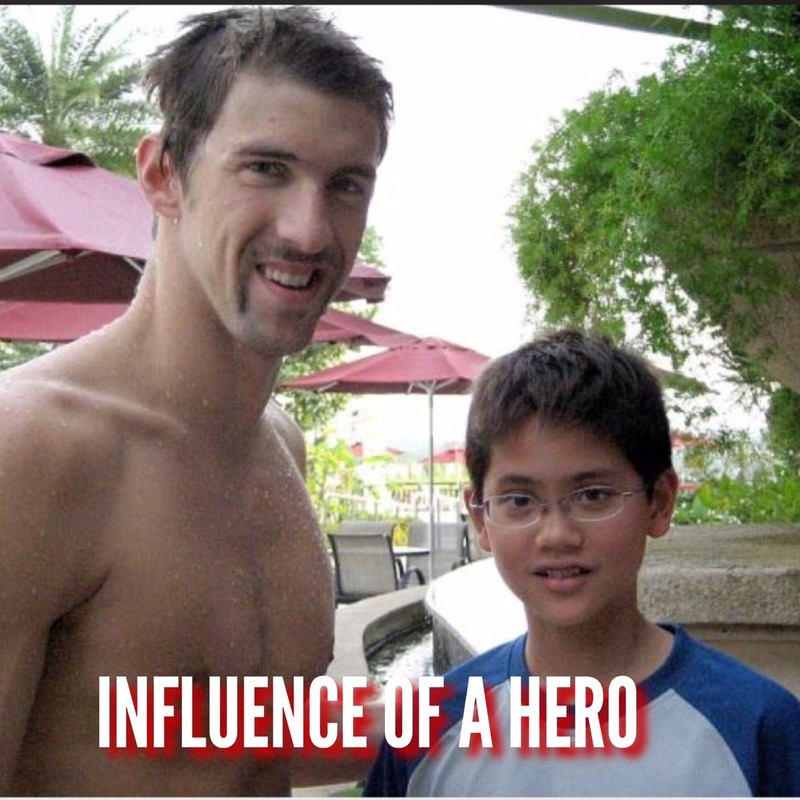 Let's continue to display the Singapore spirit through our sport and stay united regardless of our differences. The mere association to Singapore gives me a sense of immense pride. The closer ones would probably know that I am closet patriot! There's so many things to be thankful about being a Singaporean. 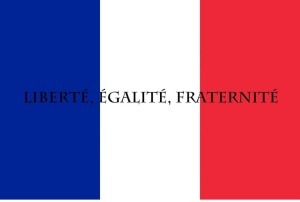 To co-exist harmoniously among the different ethnic groups and reside in a cultural society. To enjoy a wide variety of food, to live in a clean and green city with low crime rates, be served by an effective and efficient government, our home is in order and we are safe. To be known as the little red dot but yet we made our mark on the world map! It's a 'privilege' to be born and bred here and I'm grateful for that. It is an honour to represent the country. The experience is humbling and rewarding - to perform under great pressure and see the game at the highest stage. It also means an opportunity to make another mark for Singapore and the sport! We cannot let the years and others rob away what makes Singapore special- our history, childhood and cultural strings to the nation. With progression, changes are inevitable. Embrace positive developments with contentment and take ownership towards the change you want to see. Be it as a citizen of Singapore or a player in the touch community, we need to stay together and true to what we believe in. Special mention to TAS for bringing the Touch community together for a better and selfless future! I believe in the power of hope and I hope that we will feel more deeply and be purposeful & responsible for the causes we champion, as a community and eventually a nation. Happy National Day! Proving to the world and to ourselves that as long as we choose and commit to building a future together, we will continually outdo expectations and overcome physical deprivations. 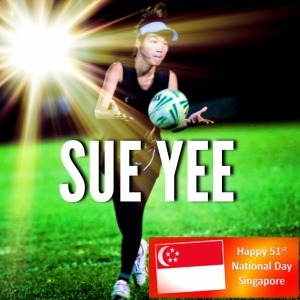 What does it mean to play touch for Singapore? Apart from it being a tremendous honour, nothing more rewarding than seeing your hard work payoff and having a blast on tour. For me it's also a chance to do proud the people who've taught, guided and given me opportunities over the years. Being Singaporean means I get to meet, befriend and play touch with people of different races and cultures. I have access to a variety of yummylicious food from all the different cuisines and I get to speak Singlish. 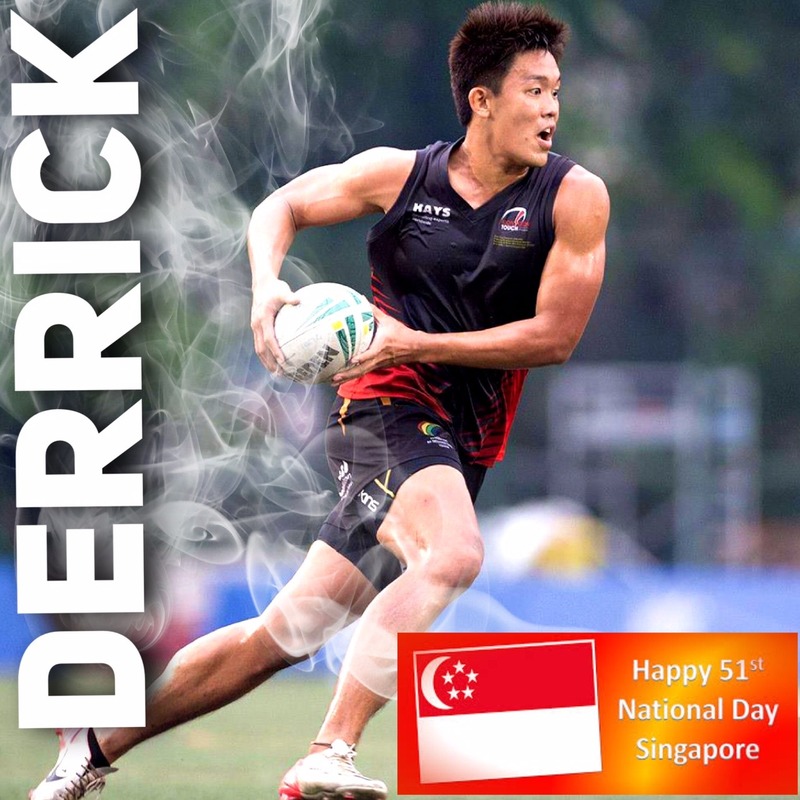 To me, playing touch for Singapore means training hard and doing my best to improve as a player to represent my country and do the nation, my family and friends proud by showing others how far the sport has developed and evolved in Singapore. Playing touch for Singapore also means putting on my best attitude and behavior when I don the national flag and to maintain the positive image of my country. Being a Singaporean to me is about preserving what is unique to us. The diverse culture, language and of course food. Singaporeans have by far formed a commendable level of tolerance between us. This diversity and tolerance must be embedded within the generations to come. Having played touch for a while, I've seen the sport grow significantly, especially with TAS leading the way. I will say touch in Singapore is still growing and to garner more appreciation in Touch, we need to make it affordable to every keen individual, opening up avenues for social teams and clubs while keeping the competition healthy. Change is sometimes necessary for growth, change can also challenge your values and beliefs. Changes were necessary to build Singapore to what it is today. Hopefully, with TAS leadership, our voices will be heard and we can all embrace these changes and share its benefits as a nation. What does it mean to be a Singaporean? I have always prided myself for being a Singaporean because of the multi-cultural society and the diversity of nationalities in this sovereign city state. 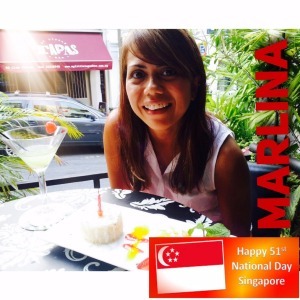 At 27 years old, to tell any visitor that you know friends of at least 6 nationalities residing in Singapore will always amaze and inspire them. Representing Singapore at the highest stage let's me share the wonderful country Singapore is. Being able to display the level of Touch Singapore has at an international stage is a dream come true ever since I was introduced to the sport, a decade ago. Furthermore, the respect and recognition given by players from other countries is another memorable part of the wonderful journey of being a touch player in Singapore. 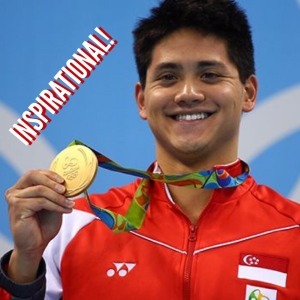 To all Touch Players in the Lion City, Stay motivated, Stay passionate and never give up on your dreams! Cause in Singapore, we make everything possible! Being a Singaporean means we are able to enjoy any kind of food at anytime of the day. From hawker centres to fancy restaurants to even uber for food. Nothing can stop a true blue Singaporean from enjoying what they like to do most – EATING! So I can say that I am proud to be born and bred in Singapore, knowing that Singapore will always be a safe and peaceful country that even foreigners enjoy living here. 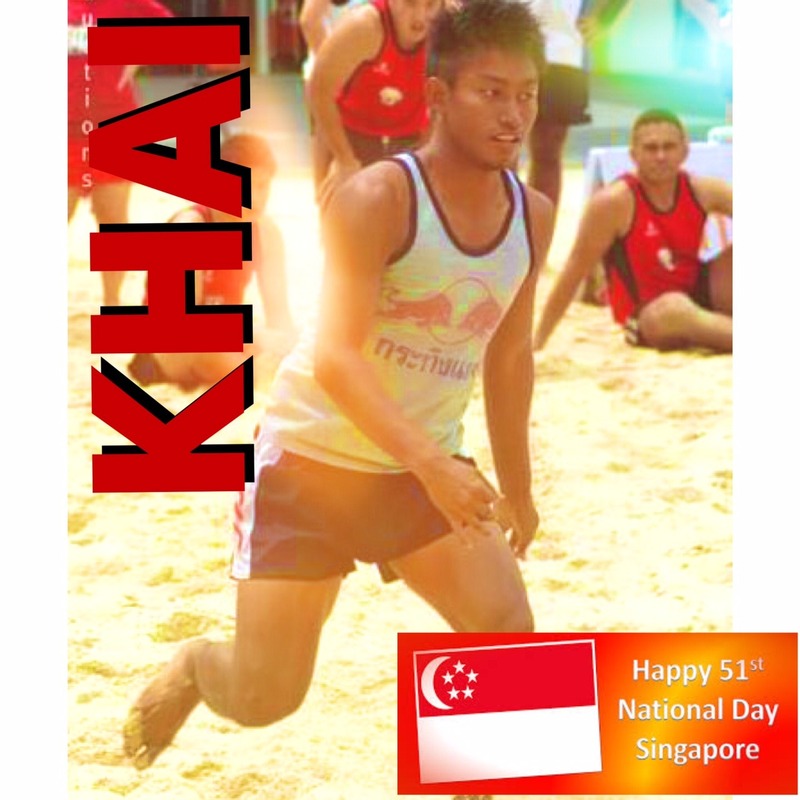 Playing Touch Football for Singapore has been a good opportunity for me. Not only do I get to play the sport that I am passionate about but to travel and see the world. It’s like killing 2 birds with 1 stone. Besides traveling and playing, I also have the opportunity to earn my Level 4 referee badge in Australia where top notch referees and players come together to play in a high level Touch Football. That was really insane! Happy National Day Singapore! 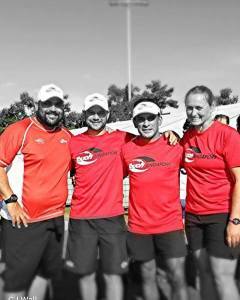 Looking forward to many more years of playing, refereeing, coaching and giving back to the community in the Touch scene. Being Singaporean to me, it means feeling like we are home. We can travel around the world but once we step foot back into Singapore, we feel a sense of comfort and warmth. Being Singaporean also means making the commitment and choice to give back to the society, with a sense of purpose. It means empirically feeling like we are a part of a growing nation that we love. Being in the National Youth Squad was an amazing eye-opening experience for me. I got to travel to Perth to represent the nation for the WA Junior State Championships. It is an amazing honour and a great stepping stone for passionate players like me, that I hope to continue for years to come. We have achieved all of the above with a cash surplus of $13,000 which we will re-invest back into developing the sport of touch. 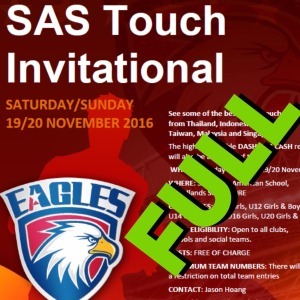 Second half of 2016 will see further growth of Touch through TAS. 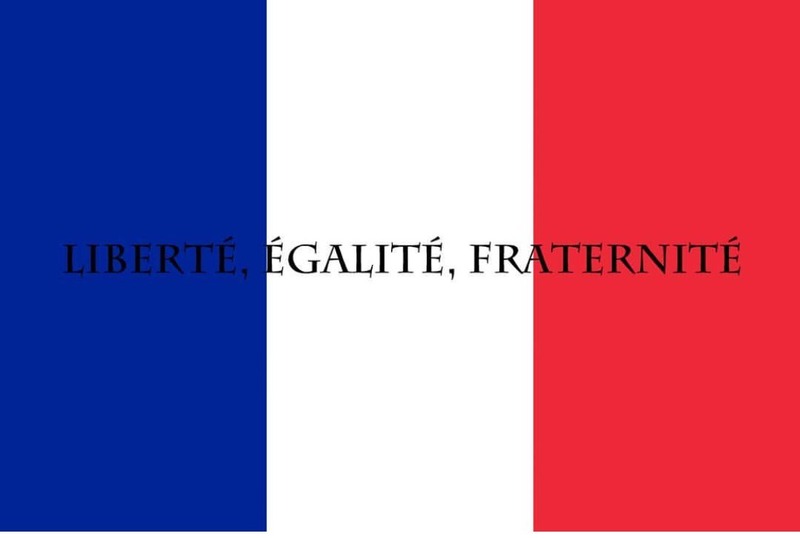 "To our French members, the French community in Singapore and everyone in France we stand with you"
Just a huge THANK YOU to everyone for the support in promoting the growth of Touch in Singapore. 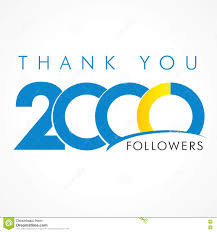 SpectacularAlex is the lucky 2000th Instagram follower who will also receive a TAS branded Steeden Touch ball. We cant wait for the season to start. Congrats to Ezekiel a Saint Andrews Rugby player who is our 1888th Instagram follower. Great to see rugby boys take an active interest in touch as the sports bring complementary skills. All Black Rugby World Cup 2015 Champion Nehe Milner - Skudder won NZ National Touch titles in college and credits Touch with helping develop his devastating skills. TAS will continue to work with the local rugby clubs to introduce more boys to the game. Check out the news article. Ezekiel will receive one of our highly sought after match balls. 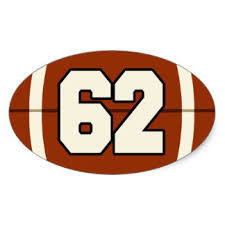 We are very pleased to announce that as of today we have received a total of 78 team registrations to play in the upcoming TTC. That’s an increase of 28 teams from season one. Those that are keen on numbers this equates to over 50% growth in players, something that everyone should be proud of as it’s your competition your association. Continuing on the numbers theme, we now have over 1800 followers on Instagram in only a space of 7 months. The social media reach cannot be underestimated as our numbers indicate that on a national touch association basis this puts TAS in the top three National Associations globally. We will shortly publish our half year set of financial accounts on our website. The key takeout from our accounts is that we were able to offer the league at a minimal fee of $1,000 per team and still have a surplus of $13,000. The strong 20+ volunteer committee (which includes some very senior leaders of multi-national companies) are dedicated to ensure we continue to be as professional as we can in everything that we do. 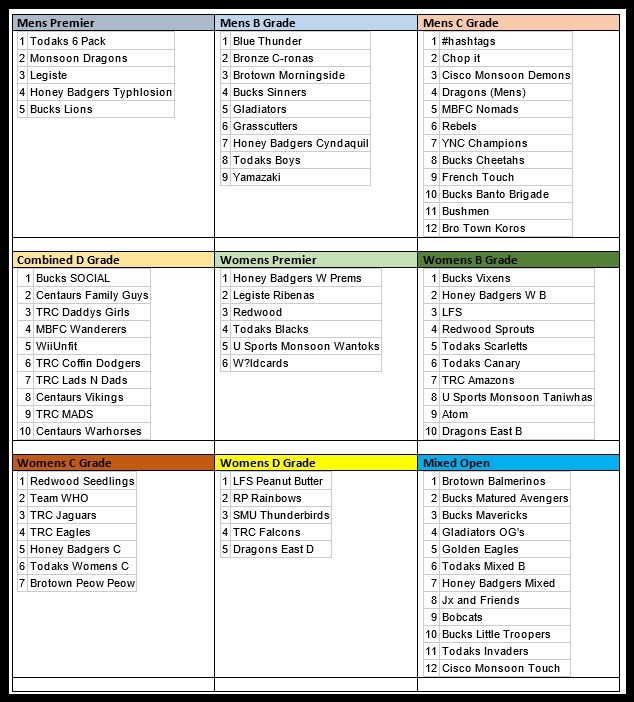 Please note final teams in each division will change following the first two rounds of grading, particularly as we aim to have no more than 8 to 9 teams per division. The rationale behind this from feedback in season one was to have each team play each other once where possible and also to ensure that each division is evenly matched in terms of playing ability. Thus for example following round 2, the women’s B Grade will have 9 teams and the women’s C Grade will have 12 teams. Similarly for the men’s category, B Grade would be 9 teams, C Grade 9 teams and D Grade 11 teams. Question – Can we accommodate all 78 teams? We are working with Tangling Rugby Club to gain access to more pitches and confident that we will be able to come up with a format that will accommodate all teams. However, please note that in the unlikely event that we are required to reduce teams then priority will be based on a first to register first to pay basis. Follow the onscreen prompts to register your team. At this stage there is no requirement to register individual players – just the TEAM NAME only. The whole process should not take more than a few minutes. The total team fee is $1000. Payment can be made up until Saturday 27th August directly into the TAS bank account. However as per the note earlier above getting an early payment could be advantageous for your team. For ease of reference please note your team name in the transaction. Although we have reached current capacity, we are investigating gaining access to more fields and confident that we will be able to keep on accepting more teams . In the unlikely event that we are required to restrict teams, priority confirmation will be based on a first to register and payment basis. Players are able to play in different teams across grades, i.e. up or down grades. However each team will be limited to a maximum of two players who are playing down grades. Any team found in breach of this rule will have the result of the match recorded as a forfeit. Full set of competition rules will be provided to all teams prior to commencement of the competition. Following the completion of the first two rounds a REGRADING process will take place and results of the first two rounds will carry through. Regrading decisions are made by the TAS committee and all decisions are deemed final. Our New Match Balls. 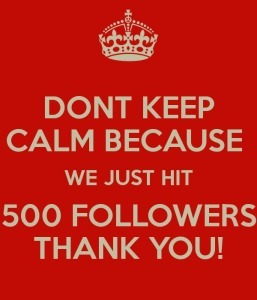 These will also be our gift to our 500th, 888th, 1000th and 1500th Instagram followers. Six weeks to go until Season two - Its going to be huge! U Sports Sand Sation 2016 Beach Touch Tournament, proudly supported by Monsoon Touch Football Club. 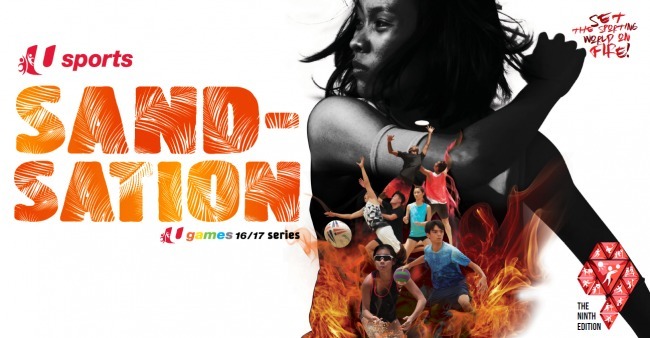 Get in some awesome touch action before season two starts. NTU Touch Attack is back! 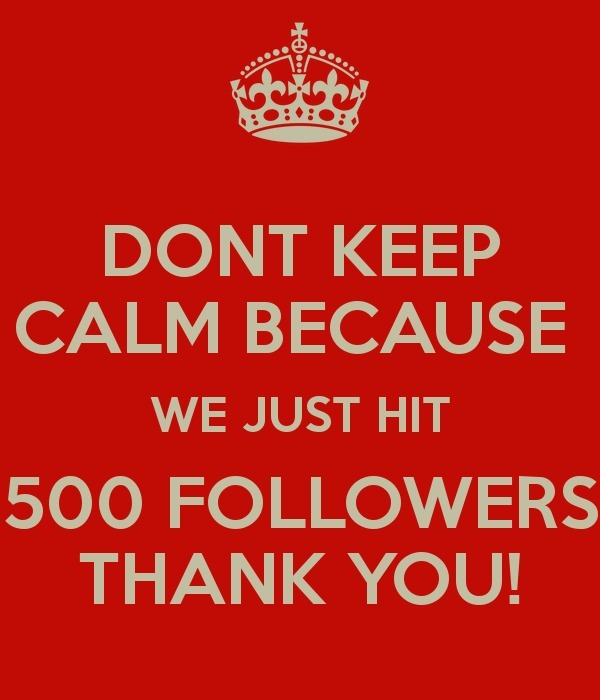 Really great to see the worldwide support of TAS as we reached another milestone of 1500 Instagram followers on Instagram.Katie. 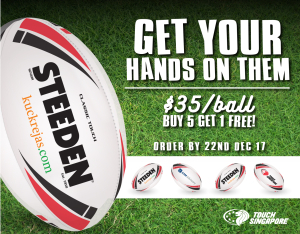 Aln will receive a TAS branded Steeden Touch Ball. It's your game,your association. Thank you for all the feedback from 50 teams from season one. 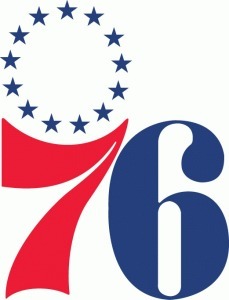 We will incorporate those changes for season two so all 76 teams will benefit for season two. We are now officially oversubscribed with 76 teams nominating to participate in season two of the TAS league. It's a phenomenal response and reflects an increase of over 50% new players to the league. Over 1350 players will participate of which 460 will be new to the league. 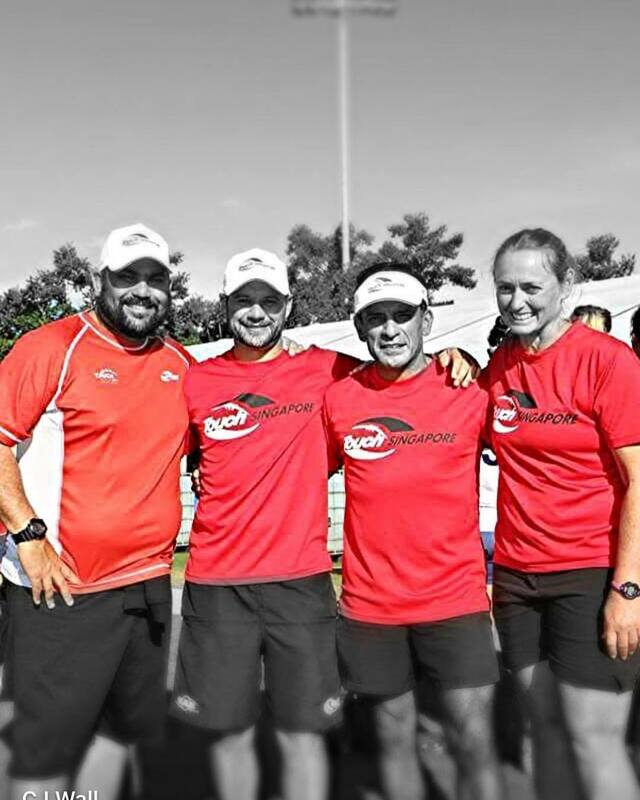 Our key mission was to grow the game of touch in Singapore and we are certainly on track with this key objective. Any further nominations will be wait listed as we start the process of confirming teams. Thank you and as dedicated volunteers we will ensure another successful season is delivered. 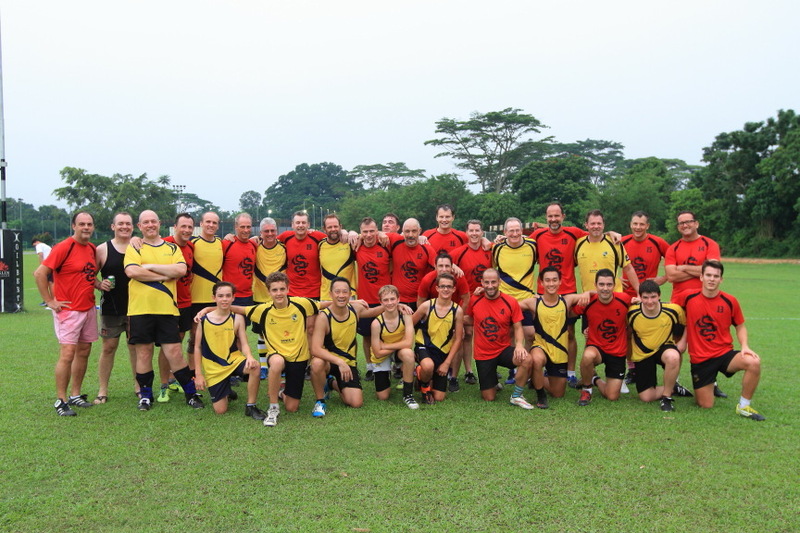 Thankyou for supporting TAS and being part of such tremendous growth of touch football in Singapore. 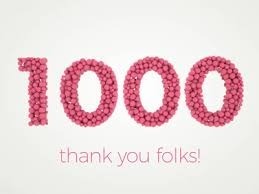 Our 1000th follower is Clarence Chung. Clarence will receive a TAS branded Steeden Touch Football. 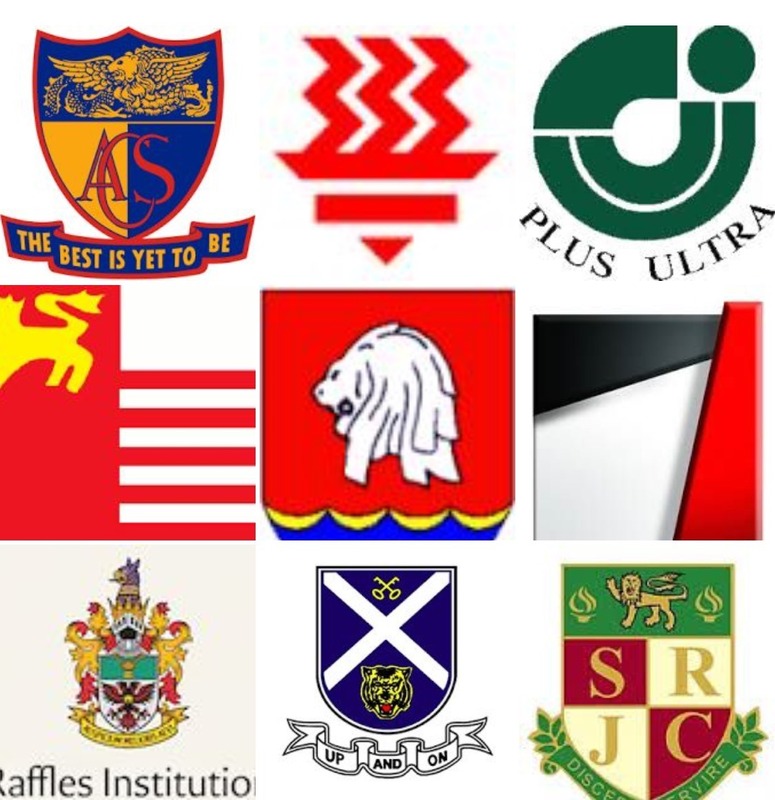 With a trusted framework now firmly in place a across all levels of touch, the Singapore Touch community have now come out in force with a staggering 72 teams currently registered for the upcoming TAS Touch Championship (TTC) commencing Saturday 27th August 2016. This represents an increase of just under 400 new players. This growth is currently isolated to the open category as data for the junior category is currently being compiled. Many of the new teams registering are coming from the Junior Colleges system where they enjoyed their first taste of TAS leagues when they participated in the 8 round NJCC in the first half of 2016. Great to see their enthusiasm in forming their own teams amongst friends and out and about enjoying touch. 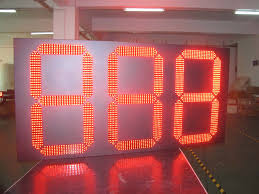 The registrations keep on rolling in, that's right 68 TEAMS have registered so far for the upcoming TAS Touch Championships (TTC) which commences Saturday 27th August. That's a growth of over 300 players (33% increase) in the space of just 6 months. This means TAS will have over 1200 players participating on a weekly basis in the league. It's going to be a huge high quality league as we restrict the B grade teams to eight teams per category thus opening up a larger pool of teams in all the C Grade categories with similar playing ability ensuring teams also enjoy competitive games. 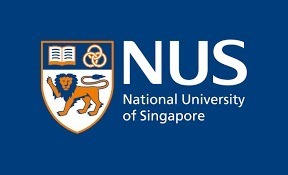 We welcome the following new teams: Coconut Water, National University Singapore (NUS), RP Storm, Monsoon Barbarians, Legiste Aubergines and NP Starburst. 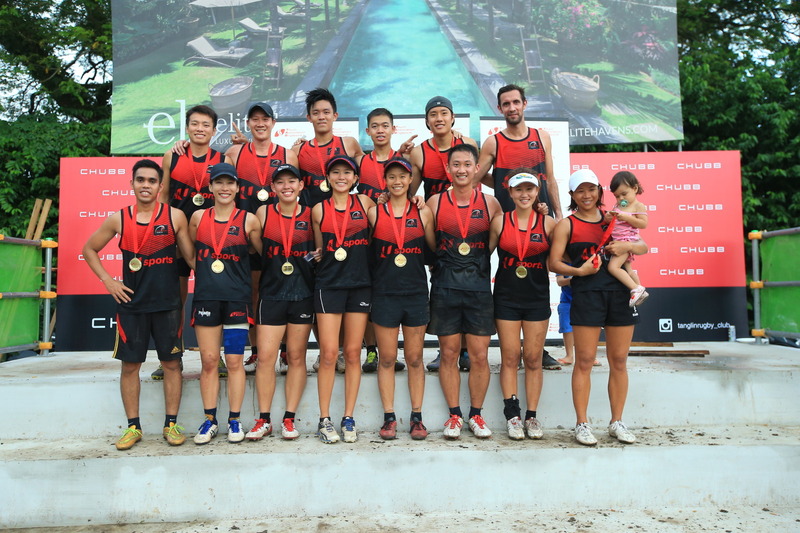 In only six months, TAS has managed to set a Singapore RECORD registering 62 teams in the upcoming TAS Touch Championships(TTC). Ten weeks remain before tap off and we will continue to accept teams. This now represents 95% of the touch playing population in Singapore playing in the TAS leagues. It's a true reflection of the confidence the Singapore touch community has in TAS to develop, nurture and support the growth of touch across all levels. The most pleasing aspect of the team registrations is that 70% of the teams registered are local Singaporean teams at the grassroots level - which is the backbone of any sport. 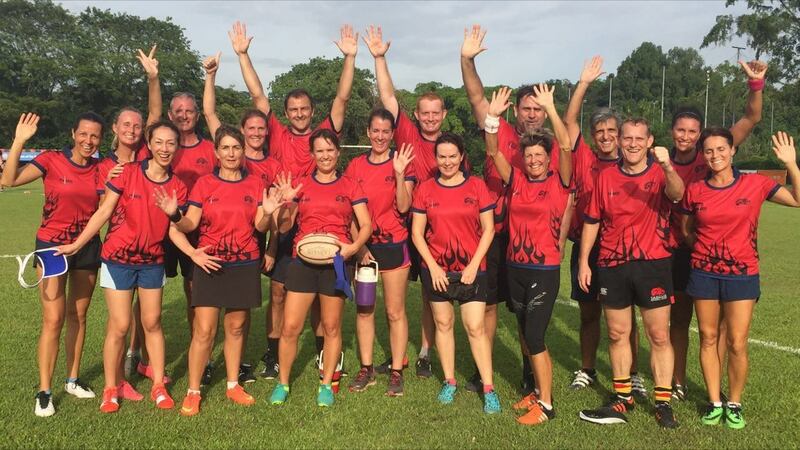 Touch is an amateur sport and as TAS is a Not For Profit Association under the guidance of dedicated volunteers, every cent that is generated is invested back into the game. 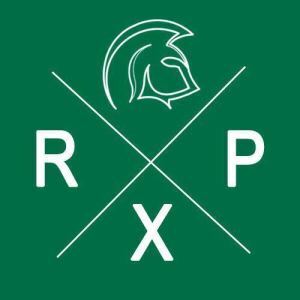 Some of the new teams to join the league include, Scoopastars, RPX, Phat Kids, YNC Heroes, Centaurs Warhorses, Centaurs Family Guys, Blue Thunder, Chop It and the mighty REBELS. 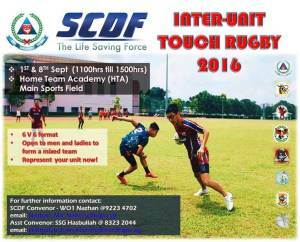 Keep the registrations coming in as EVERYONE is welcome to play touch. 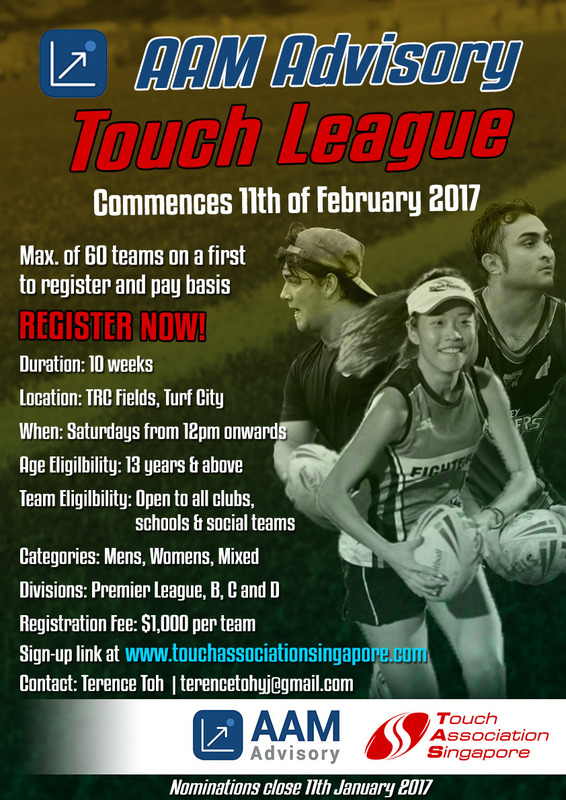 50 teams have now registered for the TAS Touch Championships(TTC).A new Singapore record will be set as we expect 60+ teams to particpate in the 10 week league. This represents over 90% of the touch playing community in Singapore. Capacity is about to be reached only after two weeks of opening up registrations proving the popularity of the TAS competitions. 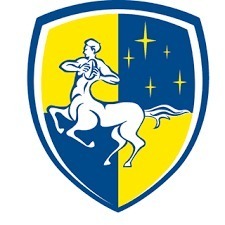 So far we welcome new teams,Kingsmen, Spangels,TRC Eagles, TRC Harriers, Centaurs Warhorses and Centaurs Family Guys just to name a few. If you haven't registered, please do so ASAP to avoid disappointment. 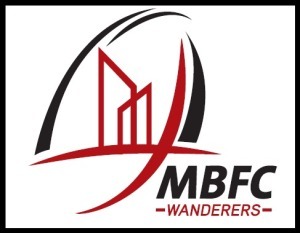 Grass Cutters, MBFC Wanderers, Dragons, The Original Ravens, Warhorses, Monsoon Juggernaught, Legiste Ribenas, WildCards, Chop It, Bro Town Peow Peows, Bucks Lions, Blue Thunder, Riverlords, Matured Avengers, Gladiators OG's, Bucks Mavericks. Looking forward to seeing old faces and welcoming new ones. Get your teams registered ASAP to avoid missing out. 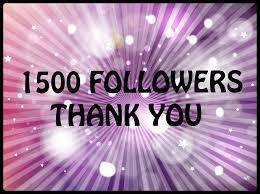 Congratulations to Stephen Murtagh "stevieeeboi" on being the 500th TAS Instagram follower. Stephen has won a TAS branded Steeden Touch Footy Ball. 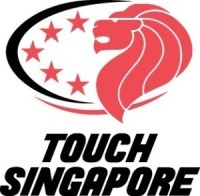 Stay connected with us and share in our journey with the growth of touch footy in Singapore. It has been a few weeks now since the end of season one and from feedback it was enjoyed by all participants. In order to improve on season one we would like to plan well in advance and thus season two registration details is attached. The plan is for a 10 week competition comprising of 8 rounds plus two rounds of finals. The proposed schedule below is for your planning and reference (please note that this could be subject to change). The total team fee is $1000. Payment can be made up until Saturday 27th August directly into the TAS bank account. For ease of reference please note your team name in the transaction. Please note that due to limited field availability, there is a requirement to cap the total number of teams at 60. In the event of over subscription, priority confirmation will be based on a first to register and payment basis. We had 50 teams participate in season one and expectation is that we will hit 60 teams this upcoming season two. To avoid disappointment I would encourage that you register as soon as possible. 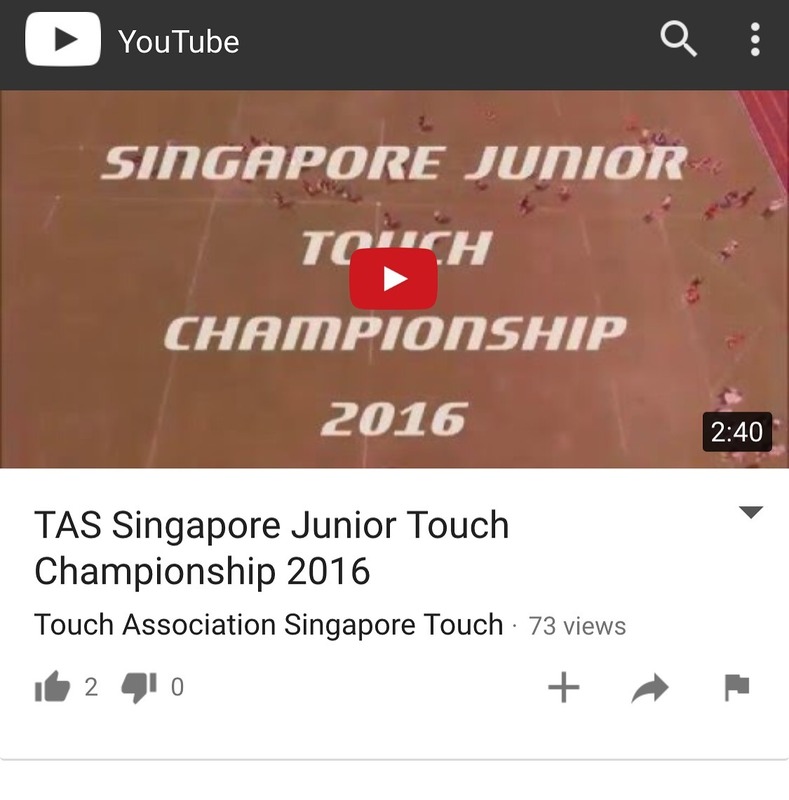 At the Singapore Junior Touch Championship we used a drone to capture an aerial perspective of the tournament. 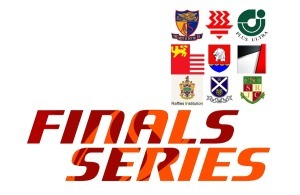 It’s Grand Final weekend and across all grades the games will be extremely competitive. We start off the grand finals with the womens B grade at 2:30pm and will end the grand finals with the mens premier league at 5:50pm – Friendlies will be played around the grand finals. Teams that made the grand finals have worked hard to get there so where possible we should stick around and support these games. Let’s make this an enjoyable afternoon and one that is different from our normal rounds. TAS will be putting on a FREE BBQ starting at 3pm and we have engaged the services of Matthew Talbot and James Barrie from Fine Palate. Fine Palatewill be putting on top end thick sausages on a pretzel gourmet bun and onions. (Italian, Thai and Aussie BBQ). Plenty of onions and sauces to compliment. We have sampled the sausages from Fine Palate and I can assure you they are GOLD. If you like what you taste, please speak to Matthew and James who will be taking control of the BBQ like all good Aussies. So bring your eskies and children and enjoy the afternoon. We will have a professional snapper who will be at the grounds from 1pm to 6pm hopefully catching some great action and social shots. 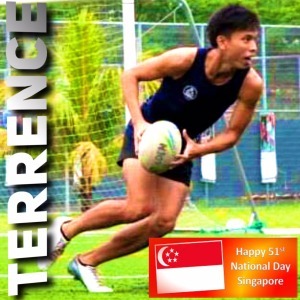 We had him at the Singapore Junior Touch Tournament last week and his work was quite awesome (see TAS Facebook). I will endeavor to get these shots up on our Facebook site as soon as I get them from him. All medal presentations will follow immediately at the conclusion of each Grand Final. This will slightly delay the start of the subsequent matches but won’t be too much of an issue as they deserve the time to bask in the glory. Thank you to the Singapore American School and our sponsors CISCO, IRESS and AAM Advisory for making TAS's first SJTCs a fantastic success. To see so many new teams and new faces playing touch in Singapore was wonderful. Particular thanks goes to SAS's Mimi Molchan who ensured Singapore's best facilities for touch were perfectly set up for us. SAS is a great supporter of TAS and provided all the fields free of charge to us on Saturday. That allows us to make this a free tournament to all the participants. 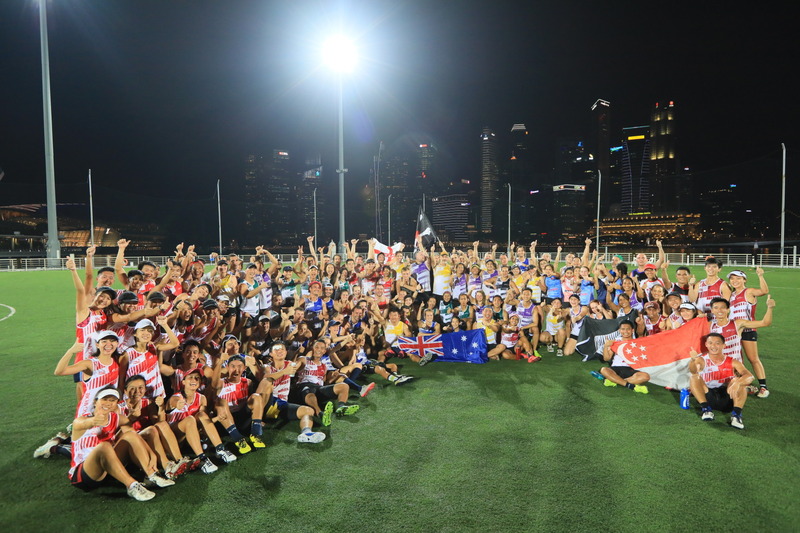 The All Stars matches played at such high standard in front of 700 cheering fans in the grandstand is surely a new high for touch in Singapore. All you juniors remember we will be running U10s, U12s and U14 competitions for boys and girls in the second half of the year. Older kids enter your team in the TAS open winter league. Want to improve prior to that? Email enquiries@touchassociationsingapore.com about free coaching assistance for your team. With big crowds, top quality playing surface and and a high standard of play, the All Stars concept was a huge success. The womens match finished in a dramatic drop off whilst the mixed match show cased future superstar Timothy Pan (pictured) to the u12/u14 boys how fast, dynamic and skillful touch is. Over 700+ people watched the matches and provided a great atmosphere which the players were very appreciative. In addition running commentary was added to the match providing valuable information to the crowd. Hopefully these matches will inspire the juniors to take up or continue their involvement with touch. 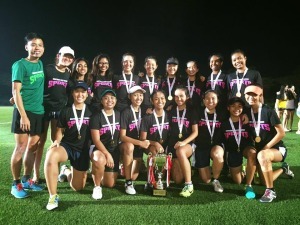 Singapore's best touch players will play two exhibition matches this Saturday during the Singapore Junior Touch Championship (SJTC) held at the Singapore American School Woodlands. 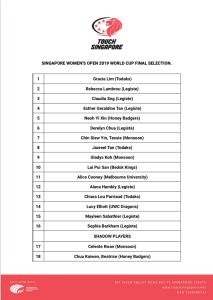 26 of the 56 All Stars have represented Singapore at previous world cups and combined with this experience are a new crop of up and coming young talent. These matches will be played in front of 600+ spectators and will add to the atmosphere of what is expected to be a great day of touch. The SJTC starts at 8:30am and concludes at 6:00pm. 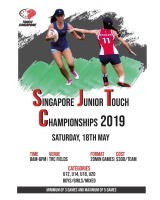 On the back of a successful 10 round league for the Junior Colleges, we now turn our focus to this weekend's SINGAPORE JUNIOR TOUCH CHAMPIONSHIP (SJTC) Saturday 30th April @ Singapore American School Woodlands from 8:30am to 6:00pm. See Fixtures/Results tabs for all games. Well done to Terrence Toh and team for fantastic organization of the TAS NJCC 10 round league. It's dedicated volunteers like these that help to drive the growth of the game at Grassroots. 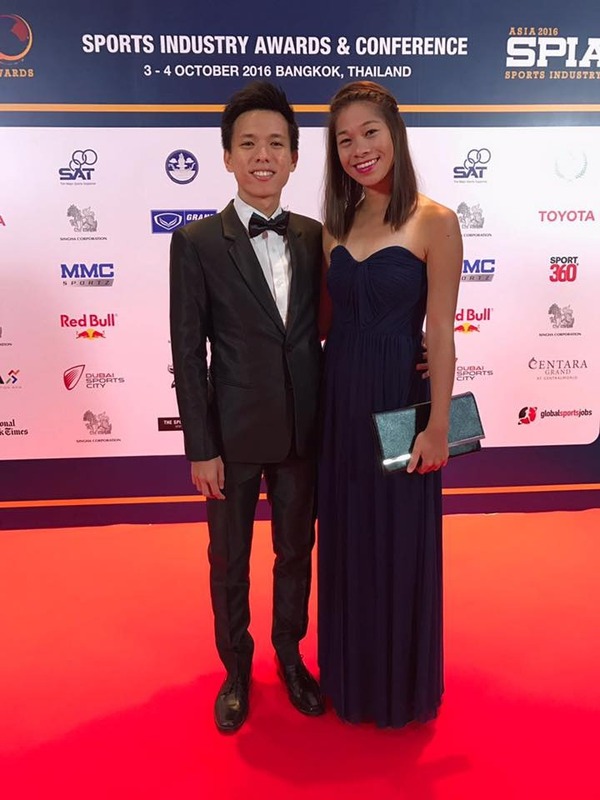 Terrence and Caleb (pictured) both represented Singapore Mens Open team at the 2015 World Cup. As highlighted by fellow observers, "the respect given to the Junior Colleges by organising and running a 10 round league was returned by the participants with their enthusiasm support and genuine excitement". We are proud to have been chosen by JC's to facilitate the champioshipfor them and look forward to making it bigger and better next time around. 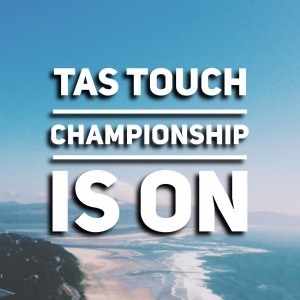 TAS Summer Touch Comp Finals Series this Saturday. Monsoon Dragons have already booked a place in the Mens Premier League GF going through the season undefeated. 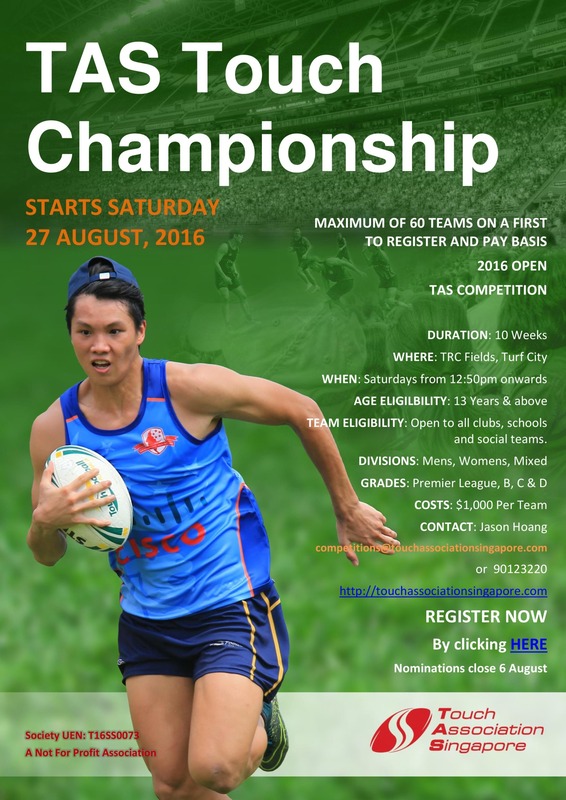 There will be some great games this Saturday with teams vying for Grand Final positions. Teams not participating in the competitive finals series have been assigned friendlies so it will be a packed Saturday afternoon with 50 teams and 700+ particpants. National Junior College Championship Finals this Saturday. Serangoon JC has earnt the right to host round 9 and the Finals Playoff. It has been a great 8 rounds of pool games so far and pleasing to see the continuous adoption of touch across the Junior Colleges. Good luck to all teams for the finals. Thankyou to Terrence Toh for volunteering his time to co-ordinate the league and ensuring all games were run professionally including provision of referees across all games. 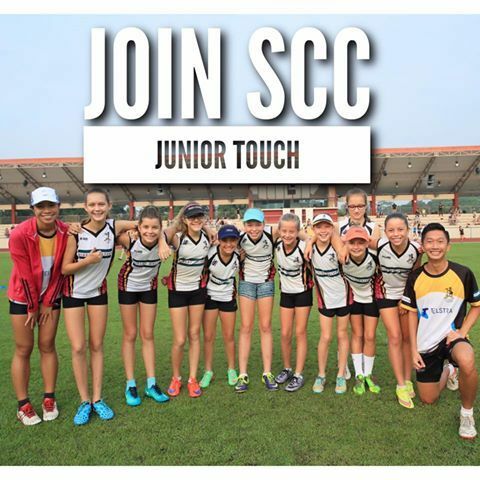 37 teams across U10, U12, U14, U16 and U20 both boys and girls will compete in the inaugural Singapore Junior Touch Championship to be held on Saturday April 30th at the Singapore American School Woodlands. Through the support of the community, volunteers, sponsors and TAS , the event is put on at No Cost so that more grassroots juniors can access touch. This is clearly evident with 18 of the 37 teams being local Singaporeans. 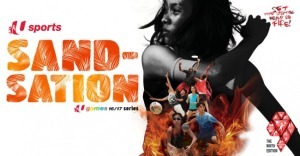 A strong grassroot foundation is the future of touch in Singapore. TAS has assisted with the delivery of three tournaments in the first four months of 2016 welcoming all juniors who wish to play with access to quality tournament play. Many of these juniors have been selected in the Open Age All Stars team and will have an exceptional opportunity being coached by world cup coaches and playing with some of the the best open age players in Singapore. Corporate sponsorship plays an important role for all organisations and at TAS through our extended network we are fortunate to have companies such as AAM Advisory lend their support. They have a strong belief in our support for the growth of Junior development in touch and we hope this is a start of long partnership. 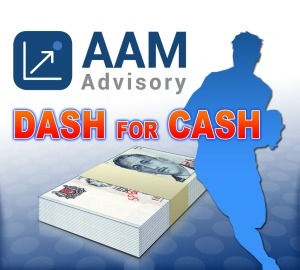 For the upcoming Singapore Junior Touch Championship on April 30th, we will be holding a novelty dash for cash event across all eight junior divisions. Juniors will lie face down and on the siren will get up turn around, pick up a ball on the 5 metre line and DASH to score a touchdown. First one to score in each age group will receive $50 in cash from AAM Advisory. Once again, Thank you to Mr Lee Sanders and AAM Advisory for their support. Only 4 days remain until nominations close. There are currently 31 teams registered and a capacity of team entrants at 40. It's very pleasing to be able to facilitate tournaments for the juniors enabling them the opportunity to bring all skills acquired through weeks of training into a tournament environment. It is shaping up to be a great day of Junior touch so get your nominations in by Sunday 17th of April. Link to registration form below. 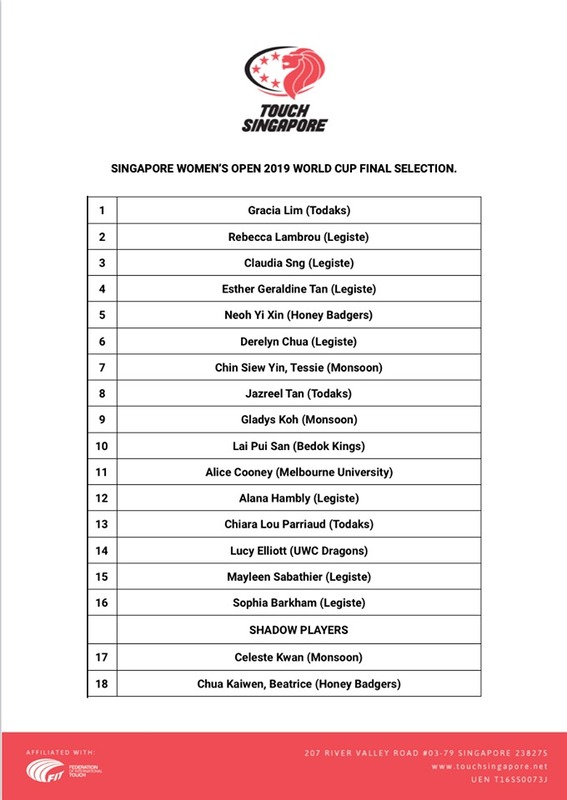 All teams have now been announced and of the 56 players selected 26 have represented Singapore at either the 2011 and/or 2015 World Cups. World cup experience combined with the upcoming youthful talent, the series shapes up to be an outstanding contest. 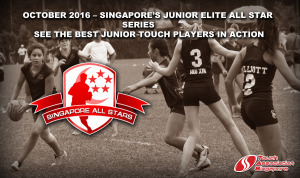 The two games will be exhibition matches played during the upcoming Singapore Junior Touch Championships providing the elite players the platform to showcase their talent and hopefully inspire the 500+ future generation of touch players in Singapore. All four teams are coached or mentored by world cup coaches and training commences tomorrow evening for the two womens teams and Friday evening for the mixed teams. Congratulations everyone. Training commences Tuesday 12th April 7:30pm at TRC stadium. Coaches will be in touch. TWO days remaining to nominate for ALL STARS selection. 80+ players have already nominated. Nominations received after midnight 3rd April will NOT be considered. Coaches will be announced Monday 4th April and team announcements following thereafter. 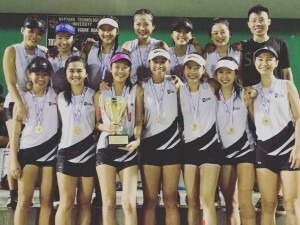 The National Junior College Championship (NJCC) taps off this Saturday with Nanyang JC hosting. Jurong JC, Raffles Institution, Nanyang JC, Hwa Chong Institution, National JC, Serangoon JC, ACS International, St Andrews JC and Pioneer JC will be taking part. The league will be run over 5 weeks with ten rounds in total providing an excellent platform for the girls to develop their touch skills in a friendly but competitive environment. There has been an overwhelming response from referees to support this league and apologies to those referees that missed out. 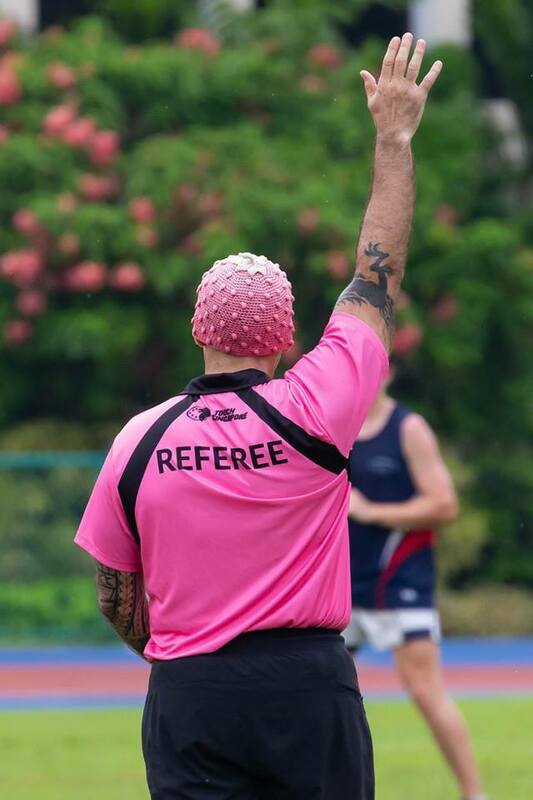 Special thanks to Terrence Toh who has volunteered his time in the organisation of the league and so well is his organisation that referees have already been booked out for the first three weeks. Good luck JC's and enjoy your touch. We look forward to crowning the Singapore JC champions in 5 weeks time. Without doubt, many of us are involved with Junior Touch in one form or another and have witnessed some brilliant touch played. 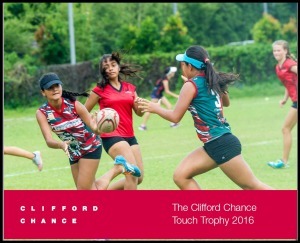 The recent Clifford Chance Touch Tournament unearthed some future stars of the game and we hope to see more of the same at the upcoming Singapore Junior Touch Championship on April 30th. 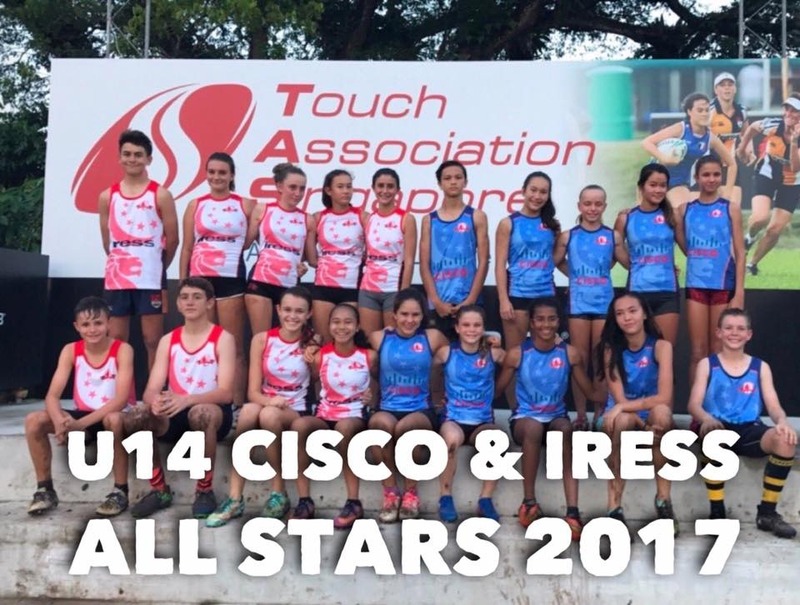 To provide an additional platform for these elite Juniors to strive towards, for the first time in Singapore, TAS will be running the Junior All Star Series for U14, U16 and U20's. These Juniors will have the opportunity to be mentored by Singapore World Cup players and be coached by 2015 World cup coaches.These games will be showcased during the TAS WTC providing a deserved great atmosphere for them. Participating in these lead up tournaments and the TAS Junior League commencing in September will ensure you put yourself forward with the best opportunity for selection. Selection process, sponsors, playing strips will all be unveiled as we draw closer to the date. As an administrator, our responsibility is to source sponsorship for these events so that they can be provided at No Costs. We envisage these initiatives will bring more Juniors to the great game of Touch. 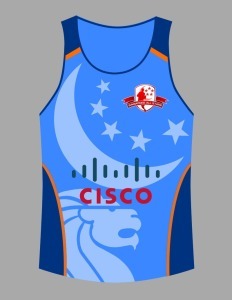 So you want to be a CISCO All Star? Nominate yourself ASAP. Please note the cut off date for nomination has been moved forward to Sunday 3rd of April in order to allow more time for the coaches to work with the selected teams. Many of Singapore's 2015 World cup players will be on show. So you want to be an IRESS All Star? Nominate yourself as we currently have 55 nominations so selection will be tough.It's going to be an awesome event. All you Juniors get excited! The Singapore Junior Touch Championship (SJTC) will be held on Saturday 30th April at the Singapore American School. Register quick as only a maximum of 40 teams across all divisions can be accepted. The tournament is provided FREE of charge. Register by clicking on this link. Calling all interested coaches to NOMINATE. We would love to see many coaches nominate for this inaugural elite showpiece event. We will offer mentorship from World Cup coaches so that you will also have the opportunity to improve on your knowledge. There are only four coaching positions and you will have sole responsibility in picking your team through the Draft System. Please nominate by clicking on this link - Nominations will close 31st March. Two All Stars games will be played as exhibition matches during the upcoming Singapore Junior Touch Championship to be held on Saturday 30th April. A large crowd of Junior touch players and their parents will be on hand to witness Singapore's best open players. We hope the Juniors will be inspired by witnessing elite touch and we hope you will get a huge thrill playing in front them and being role models. Two womens teams and two mixed teams will be selected to participate. Interested players will nominate and be entered into the Draft System and be selected by the opposing coaches into one of the All Star teams. Coaches will take turns in selecting the players from the pool. One off playing singlets will be provided to each team member which is proudly sponsored by IRESS and CISCO. There is NO costs to participate in these matches. If you are interested please nominate here: Nominations close Sunday 3rd April. It's great to be able to support the growth of GRASSROOTS touch which is key to TAS's mission and vision. The clear objective is to ensure that touch is affordable and accessible to all that wish to take up the sport. The longer term objective is to increase the populairty of touch through the schooling system so that touch does become a recognised CCA. The majority of external coaches at these colleges are all dedicated volunteers and through TAS we will assist further with mentoring programs for them. 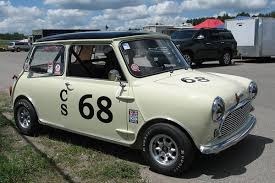 The NJCC will be run over 4 weeks and will commence Saturday 2nd April. Post this championship, these girls will then have the opportunity to join the TAS WTC in the 2nd half of 2016 and further develop their game. Again, thanks to all our volunteers and in particular Terrence Toh for putting it all together. Team on focus this week is WHO. After four rounds and a game to catch up on, WHO is sitting in 6th place in the Women's B grade competition which has 12 teams in total. A lovely bunch of ladies enjoying their touch and pushing for a few more wins to get into the all important top four.